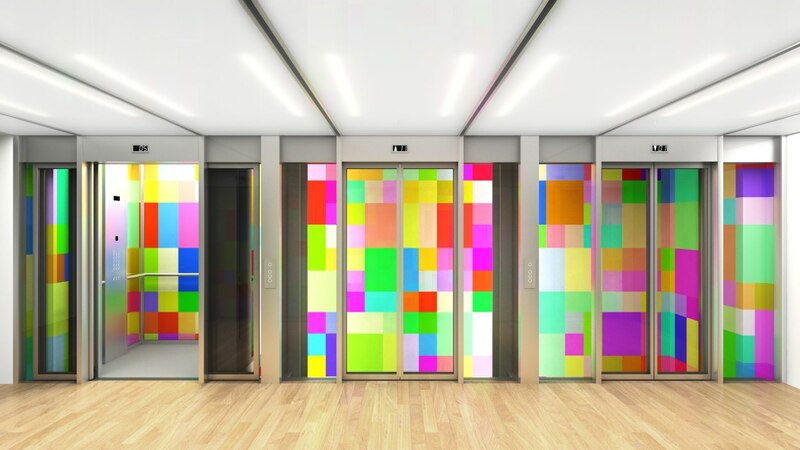 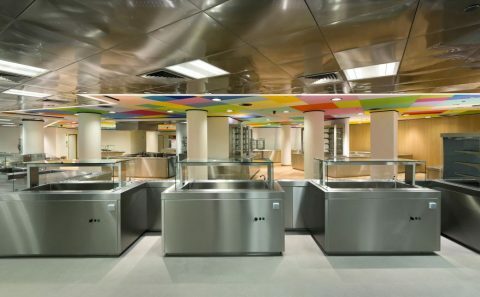 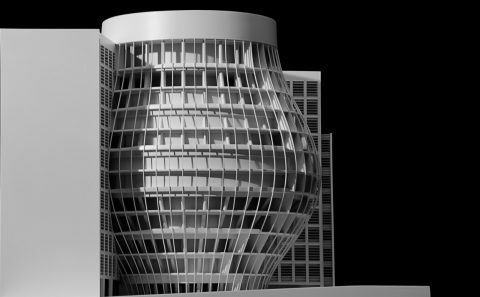 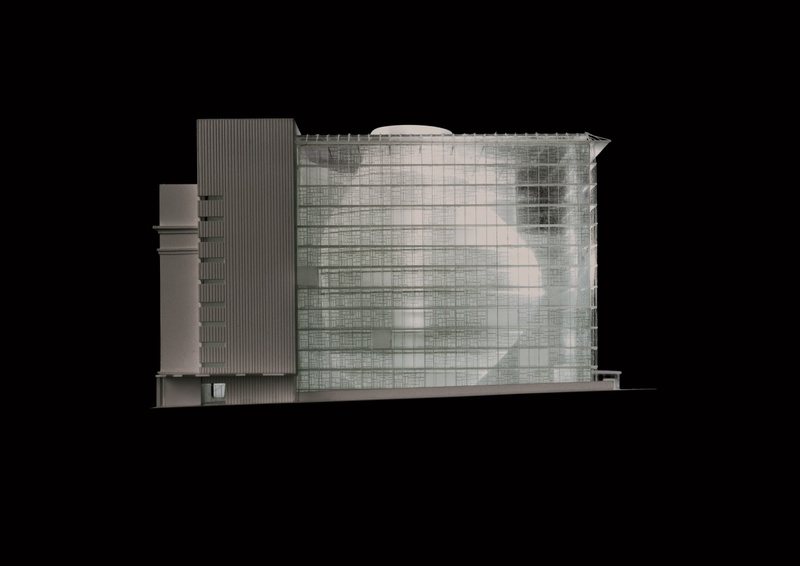 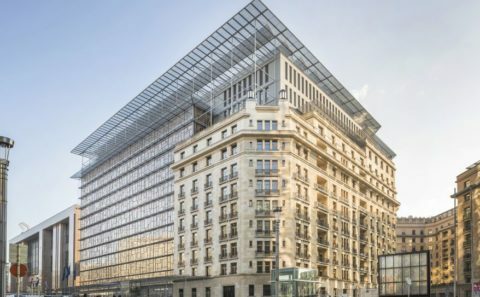 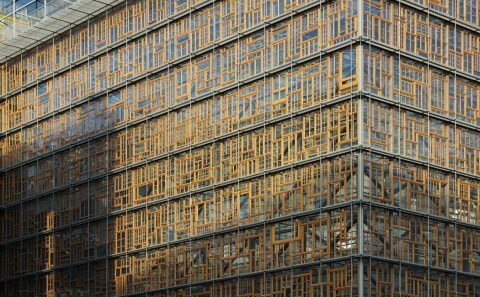 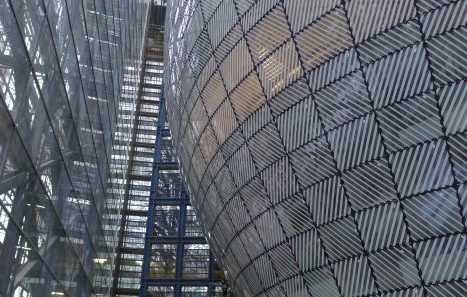 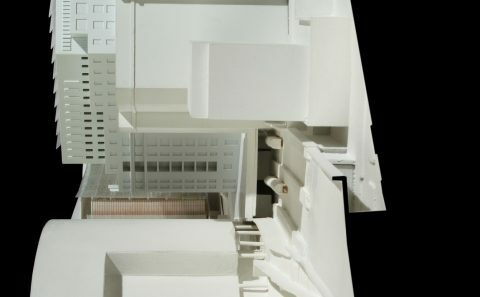 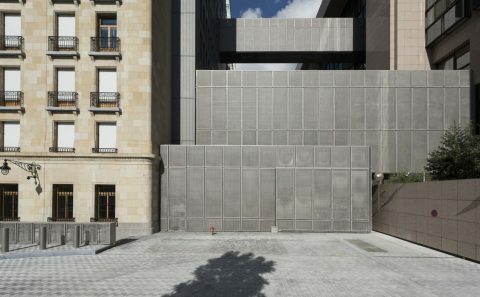 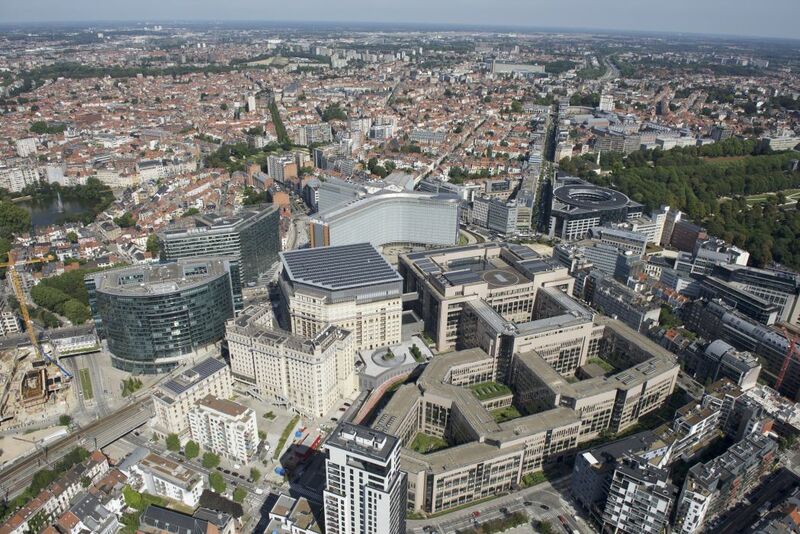 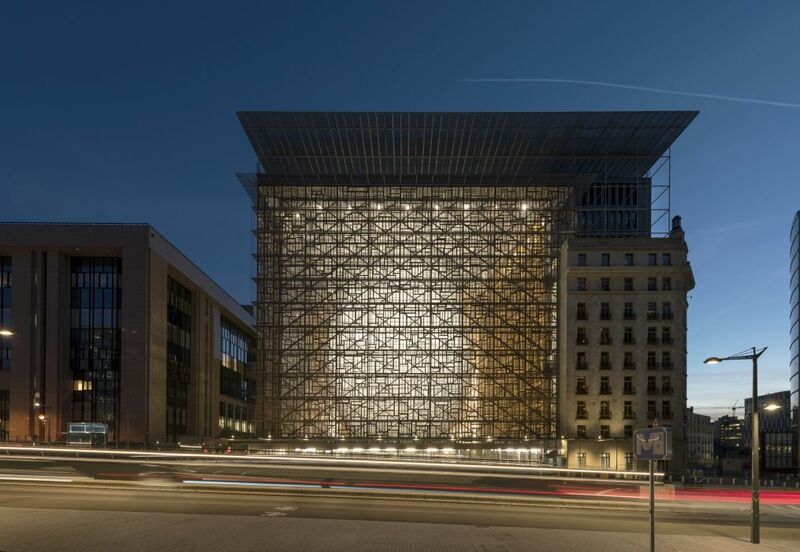 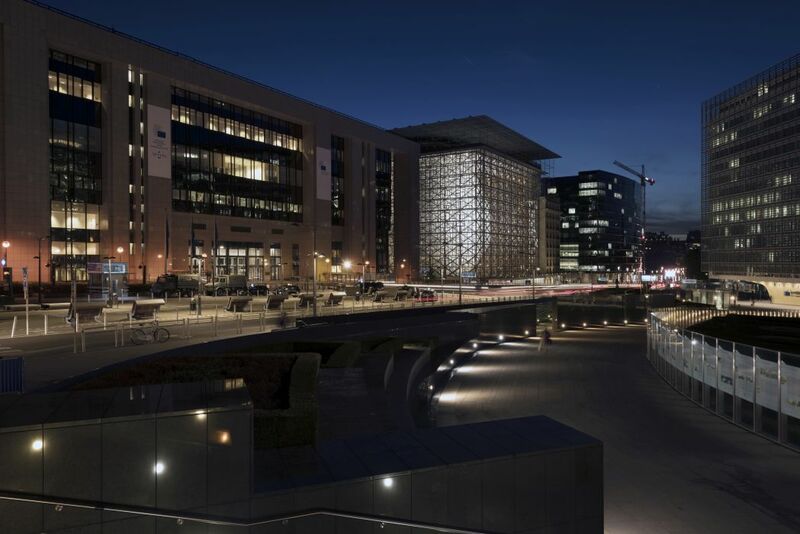 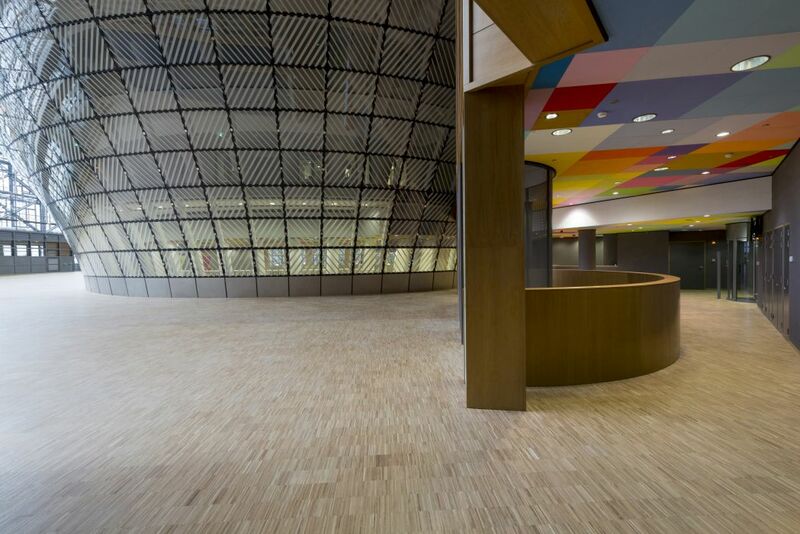 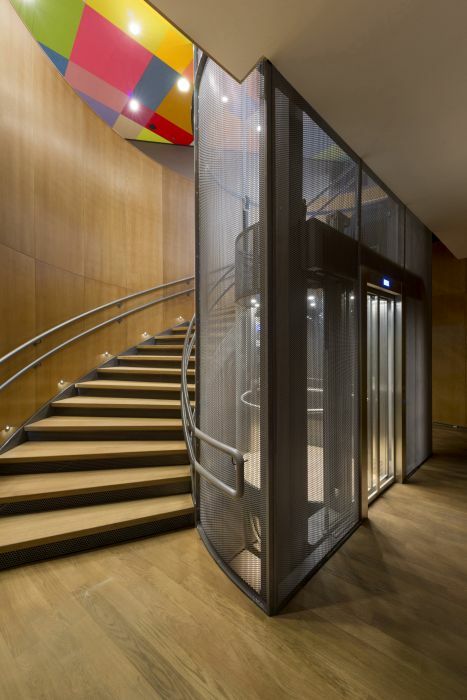 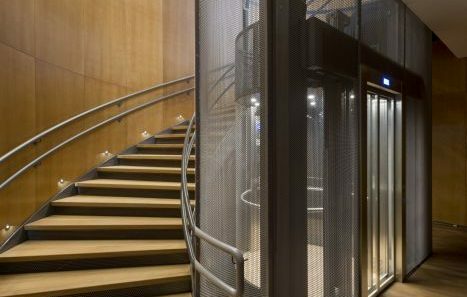 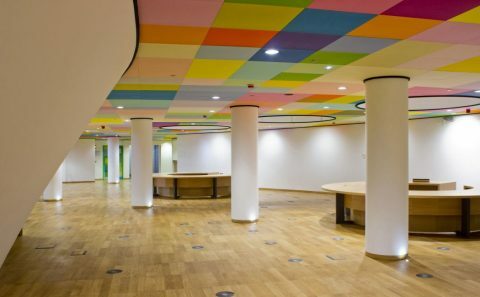 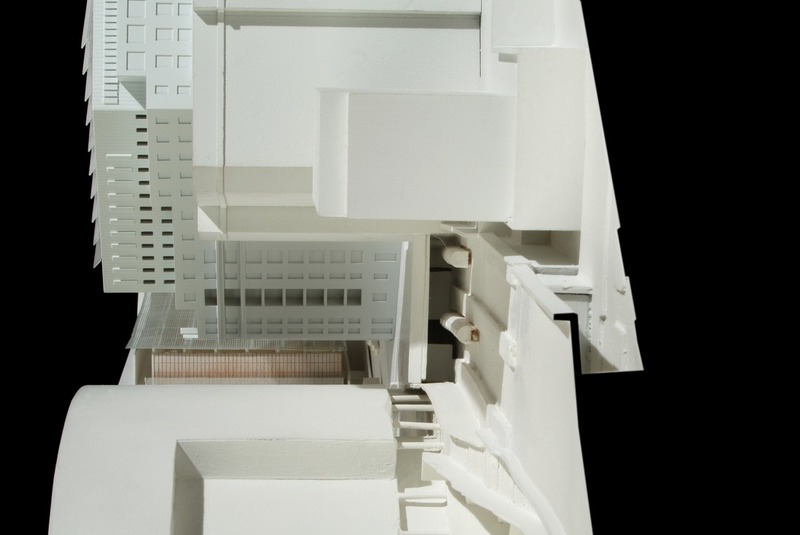 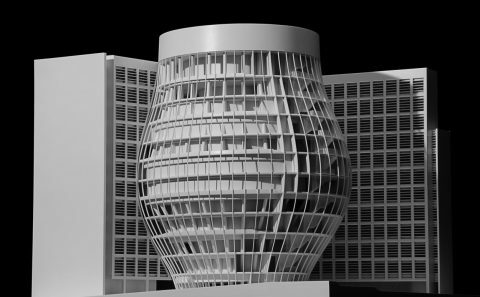 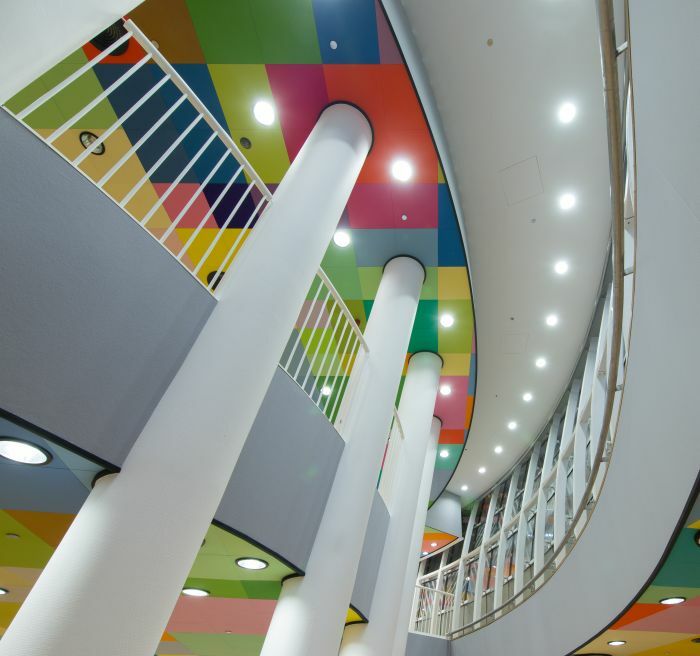 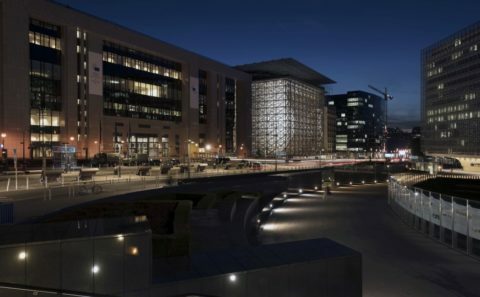 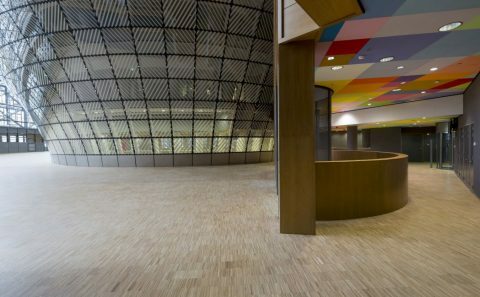 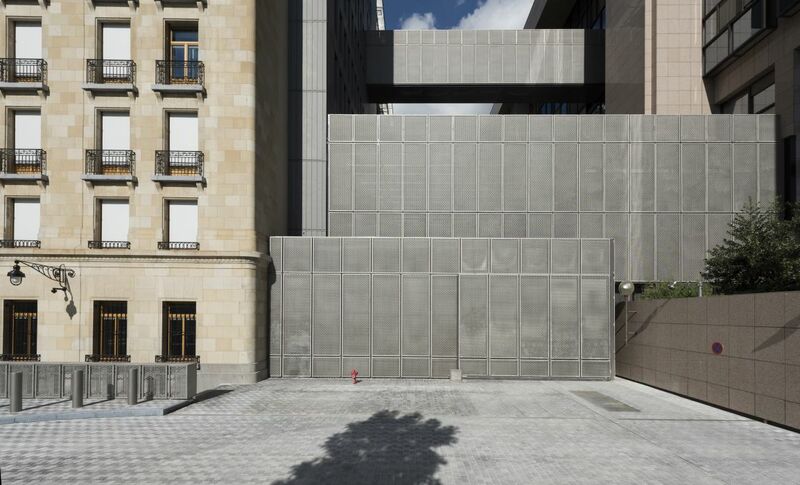 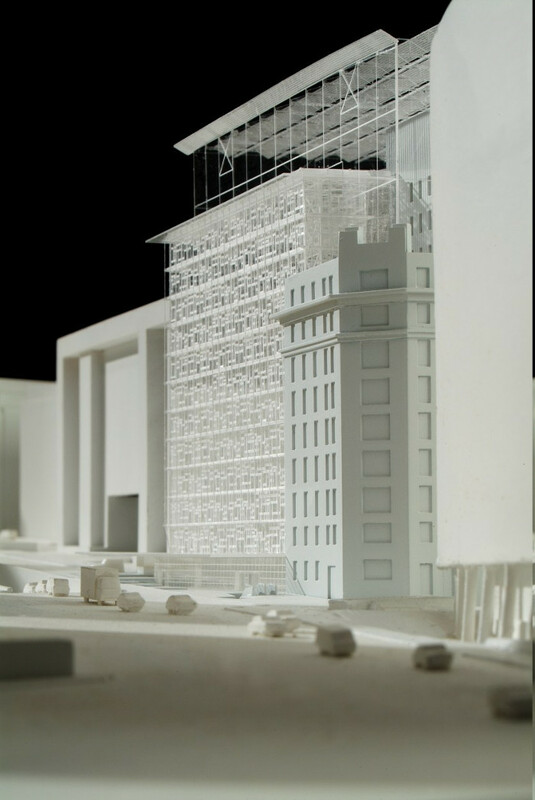 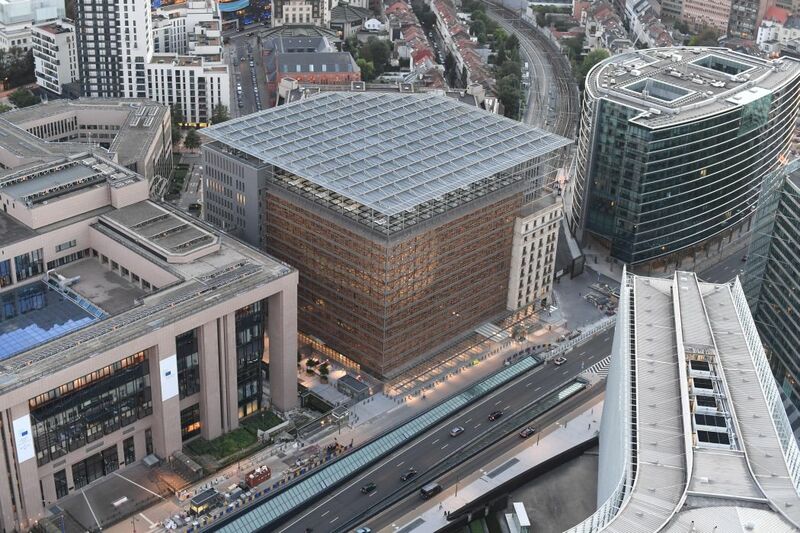 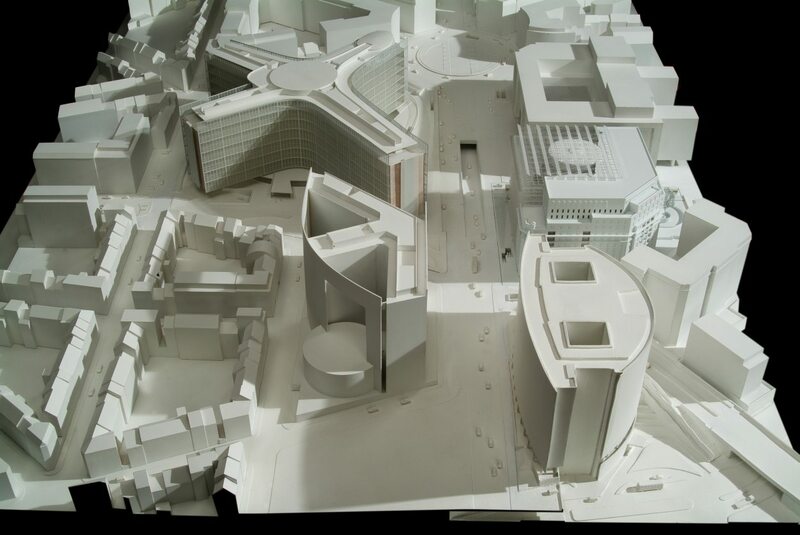 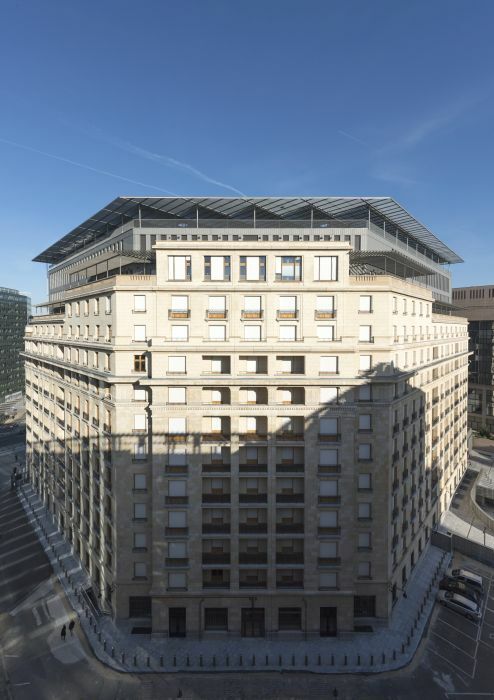 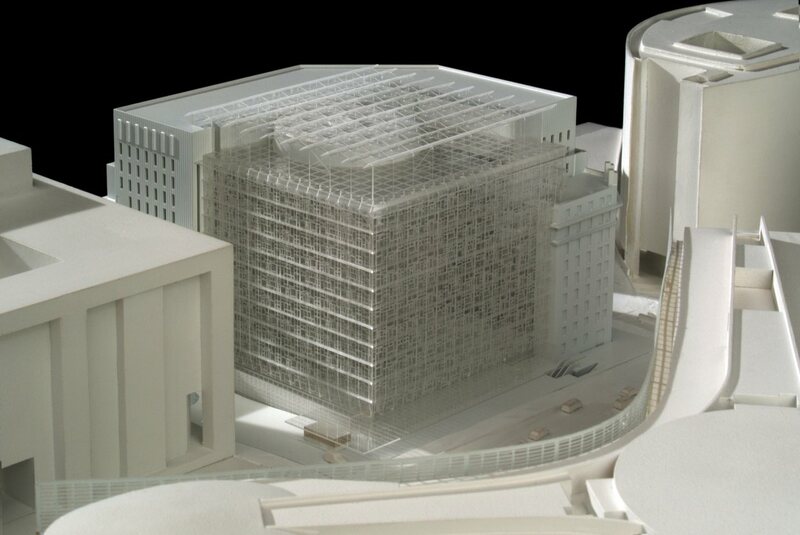 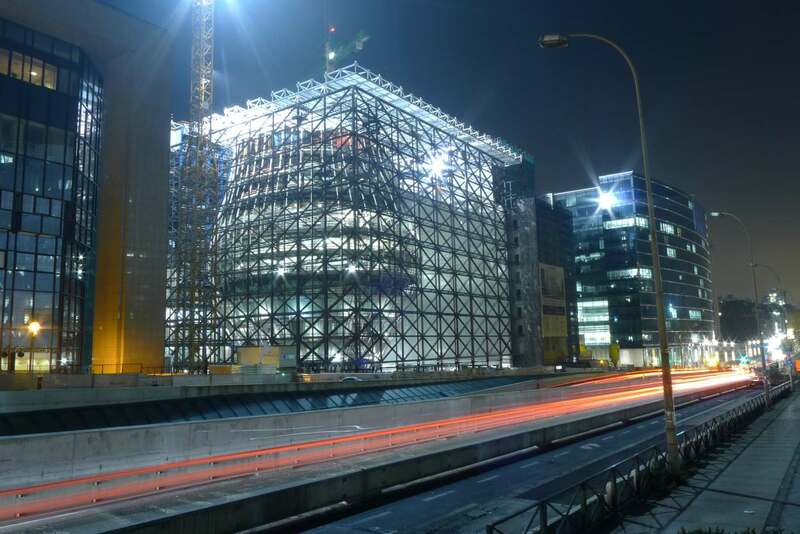 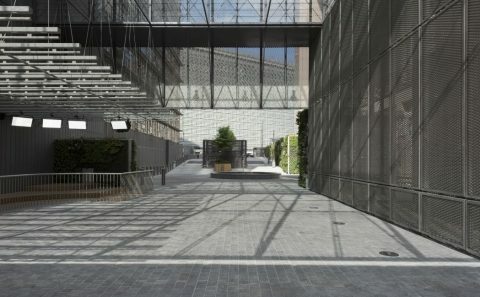 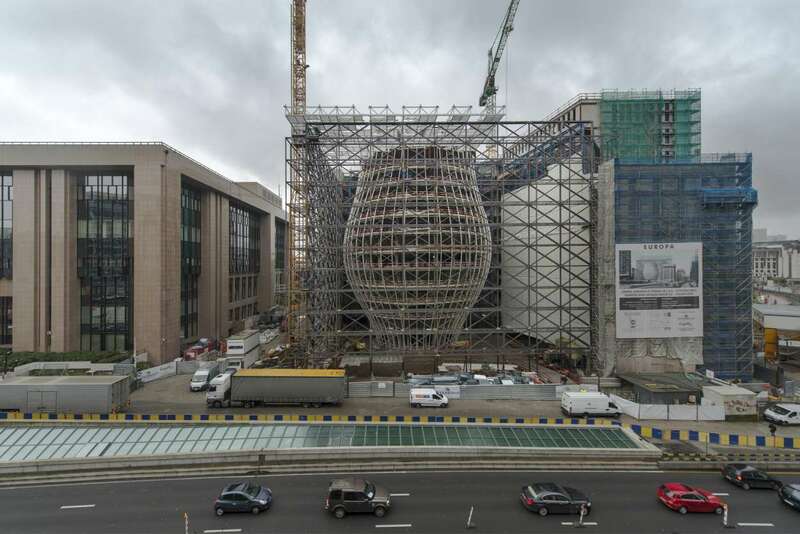 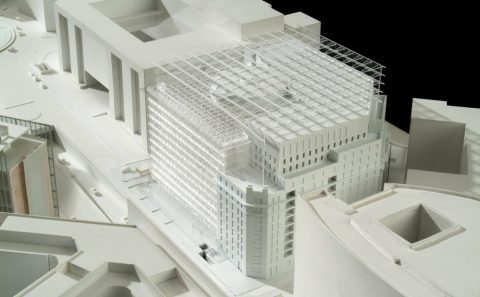 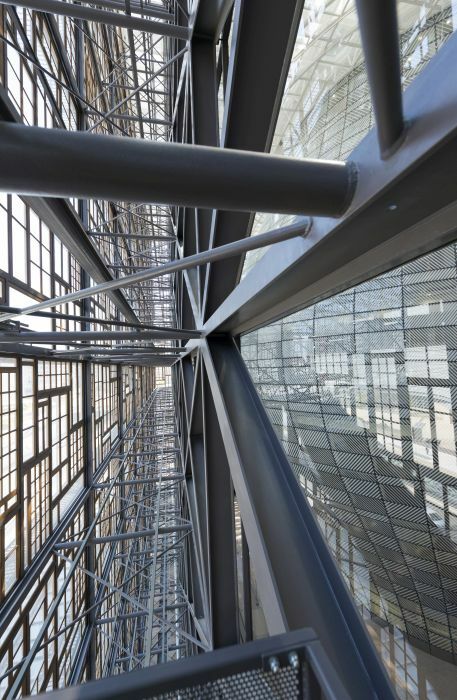 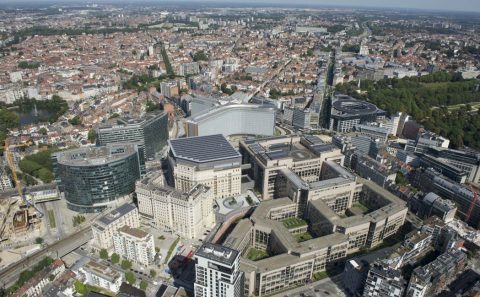 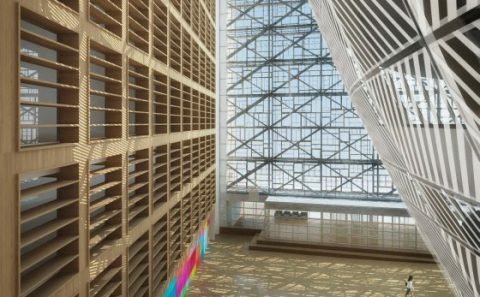 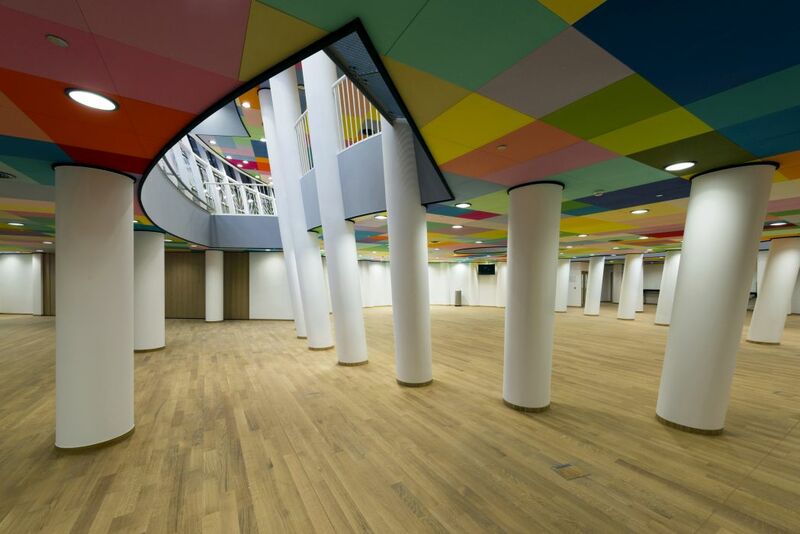 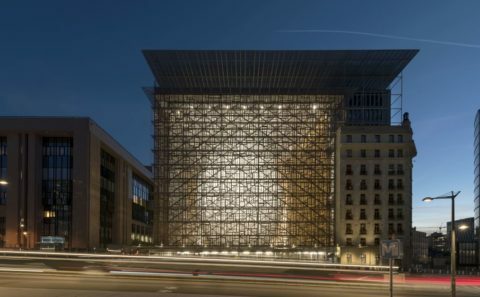 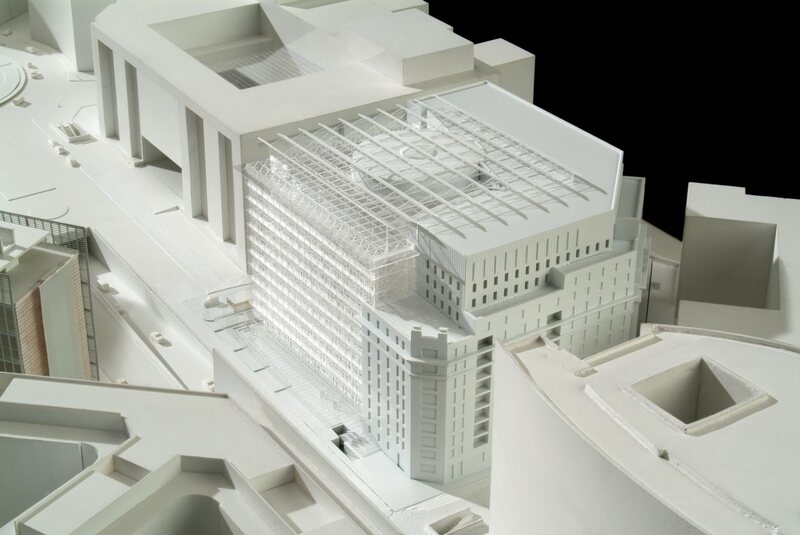 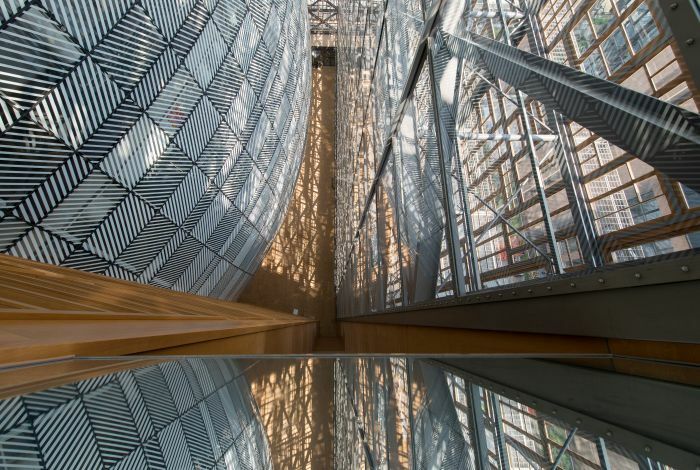 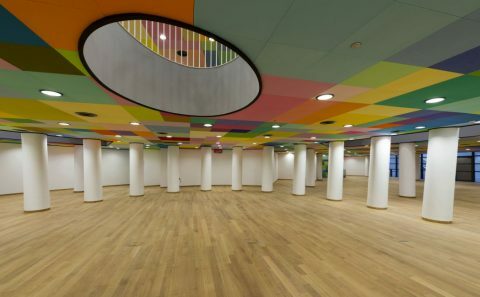 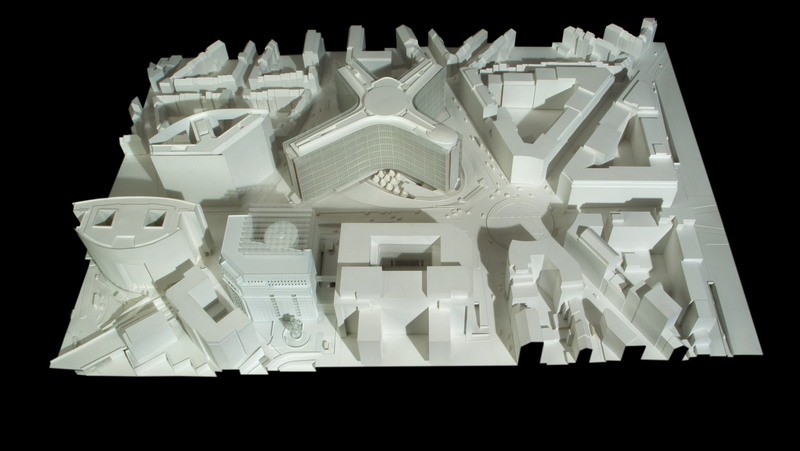 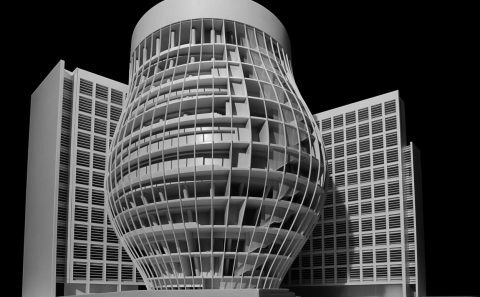 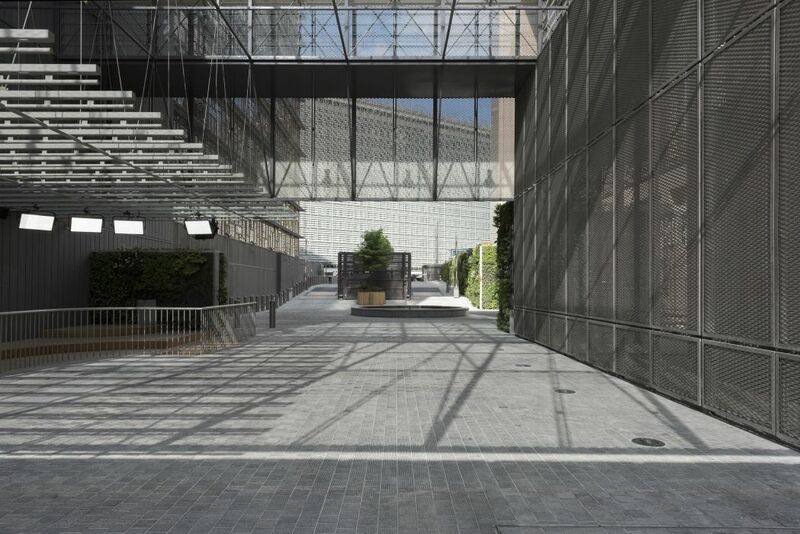 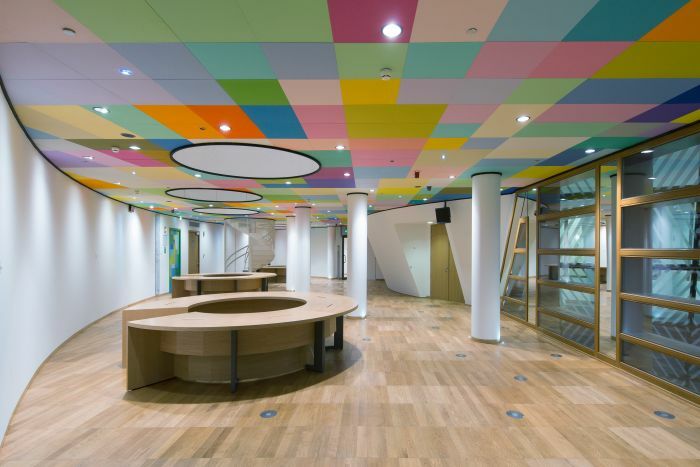 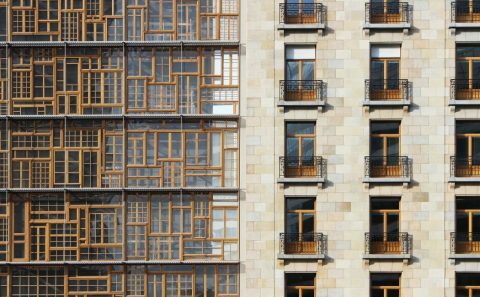 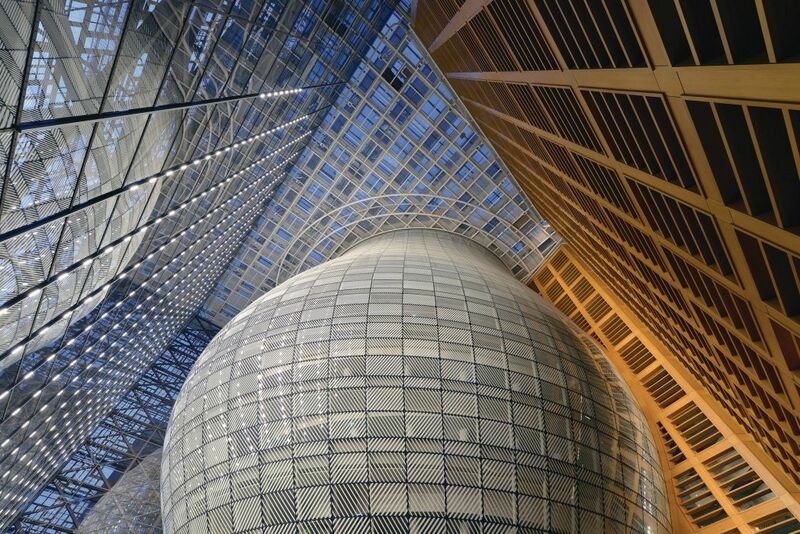 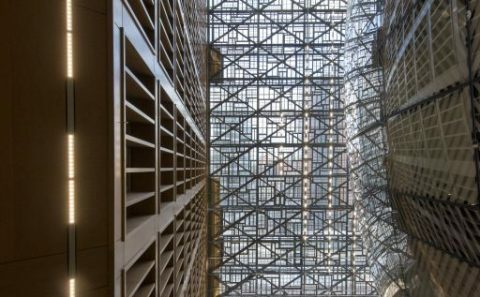 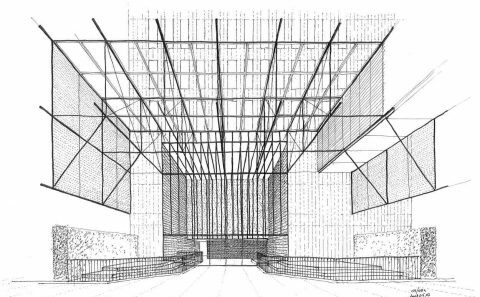 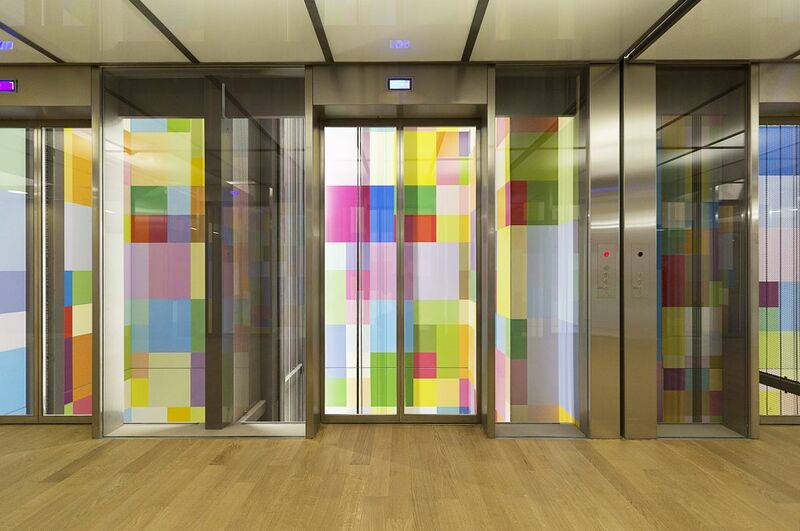 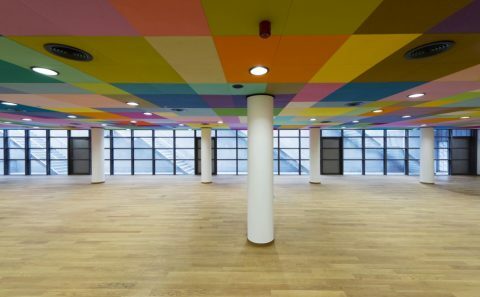 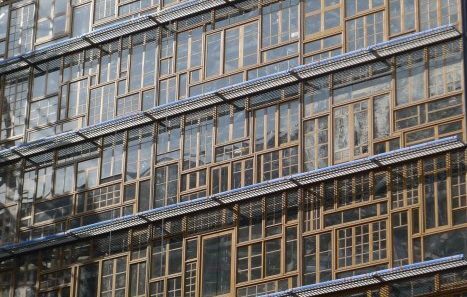 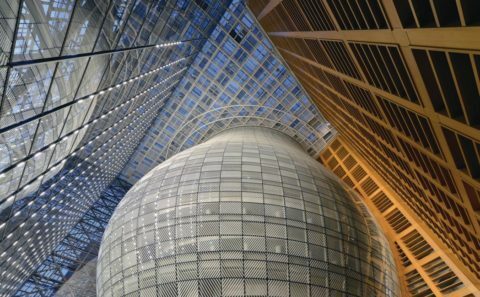 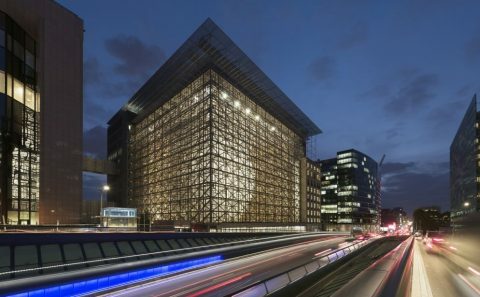 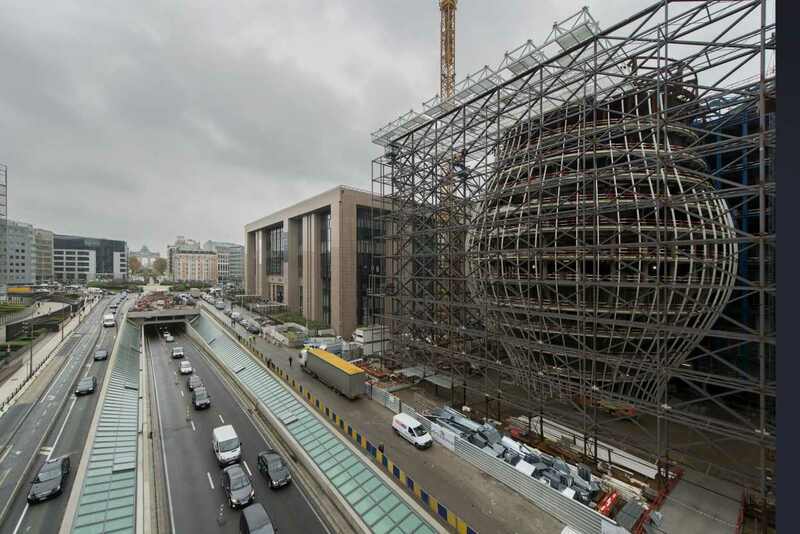 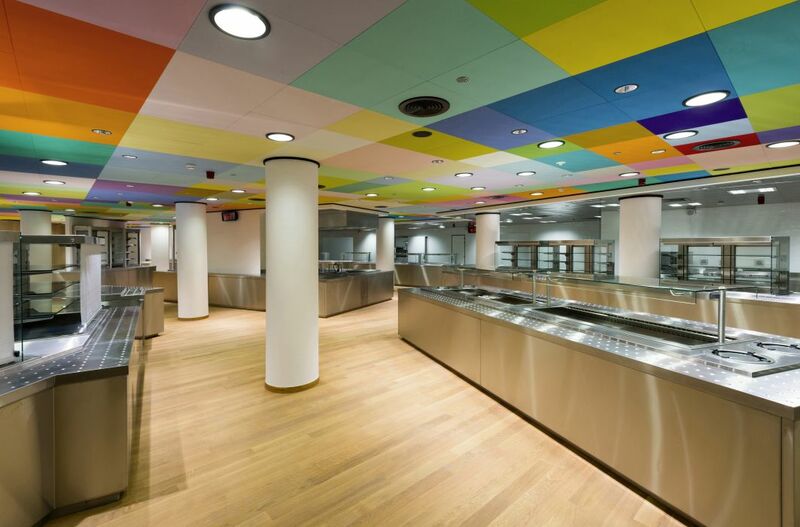 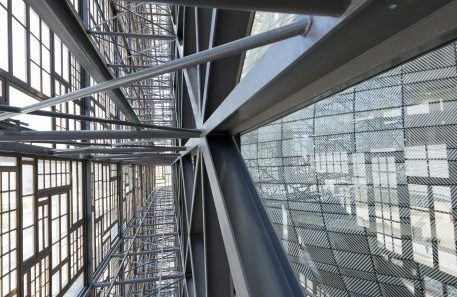 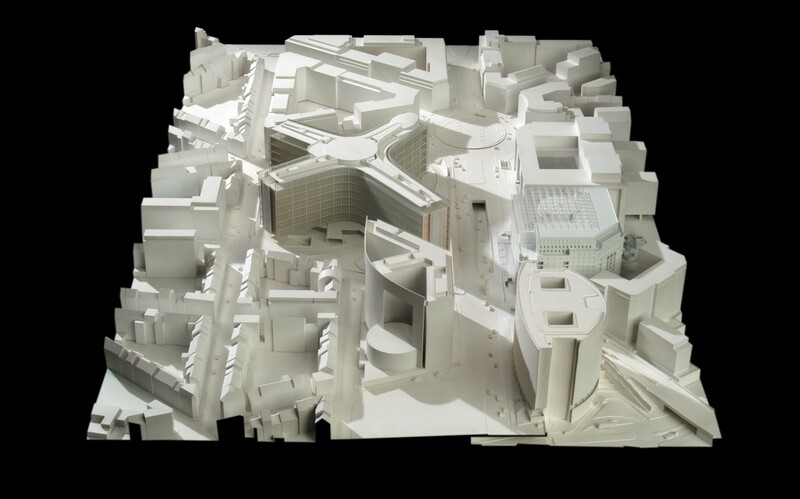 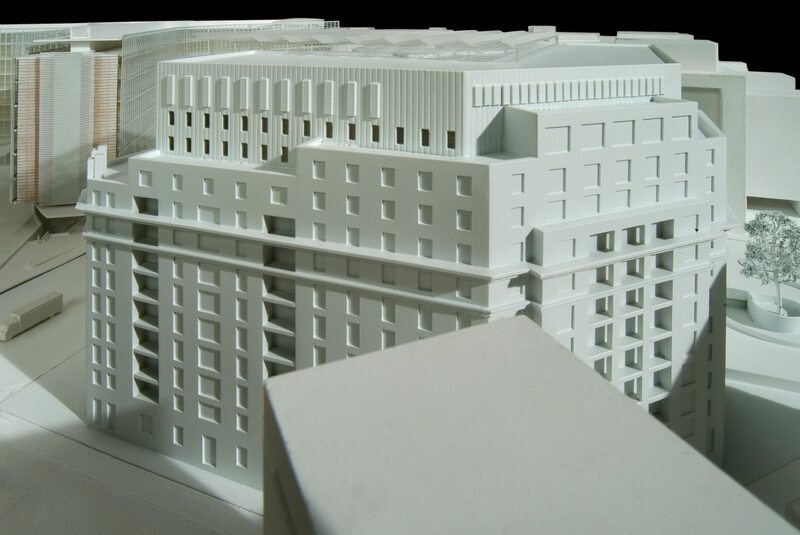 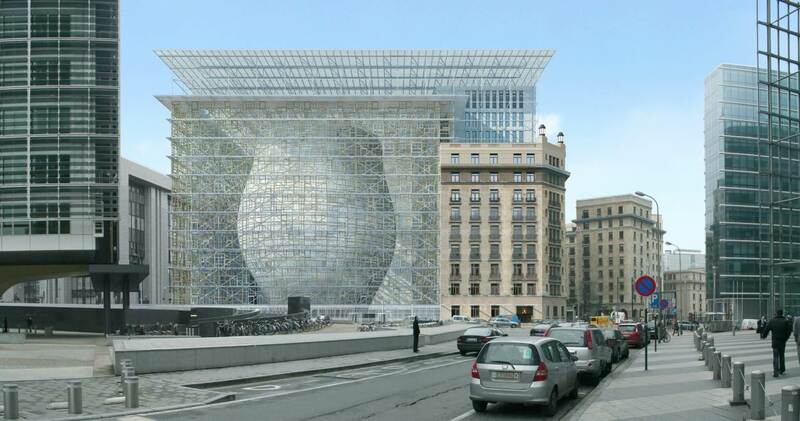 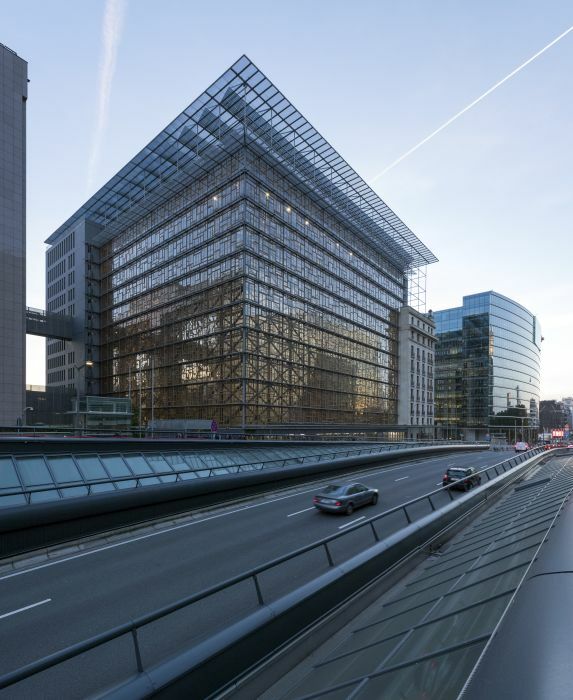 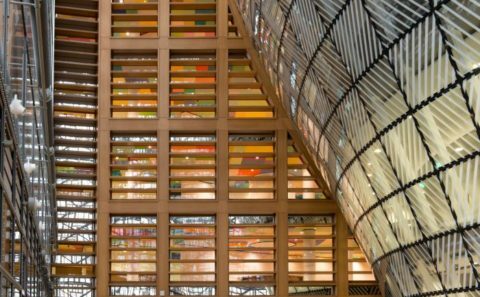 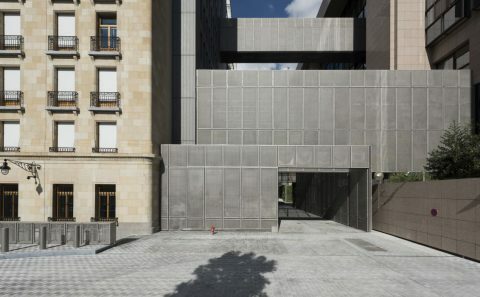 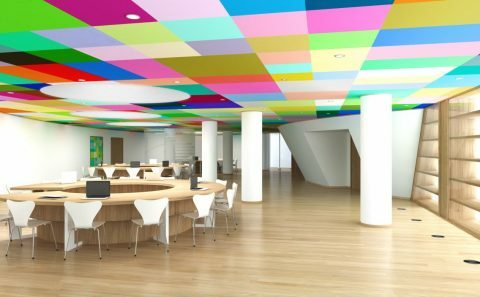 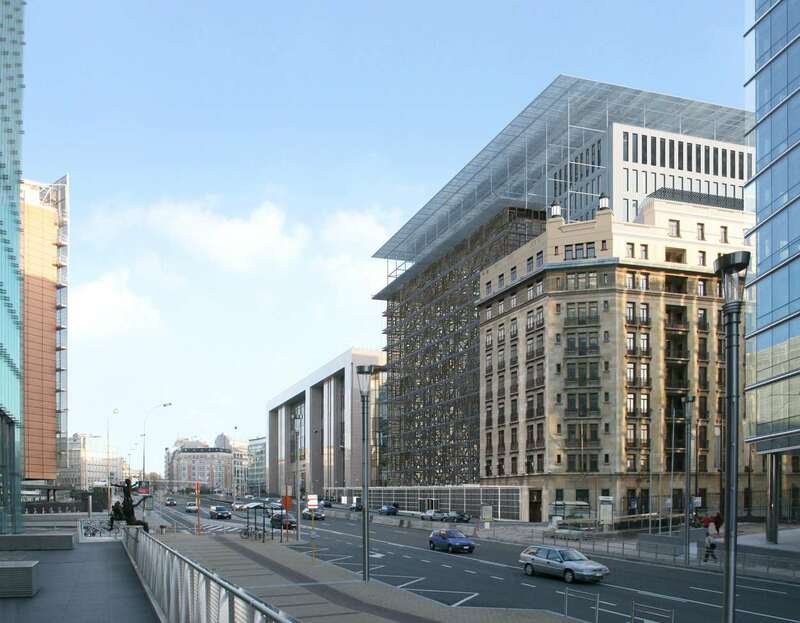 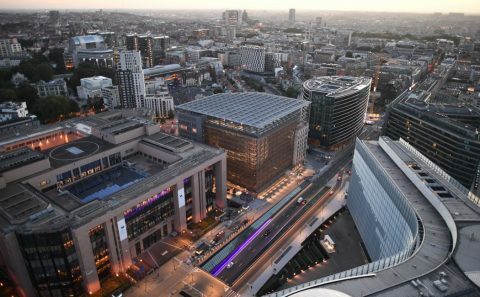 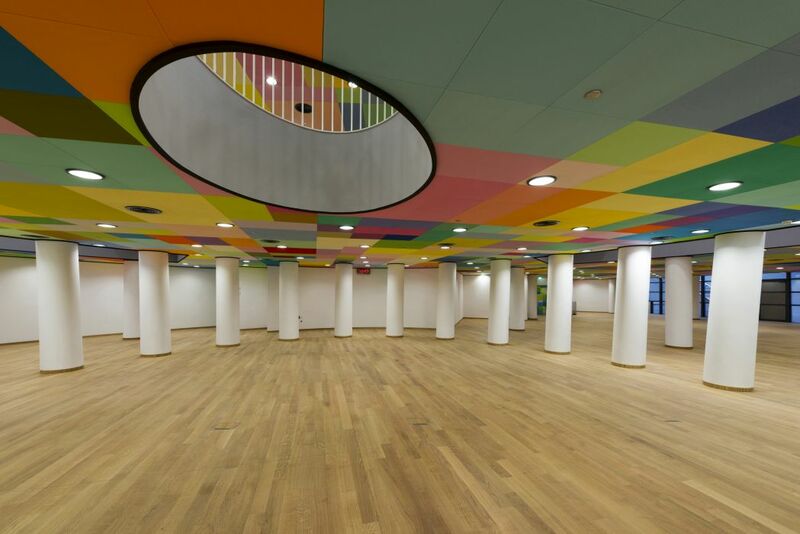 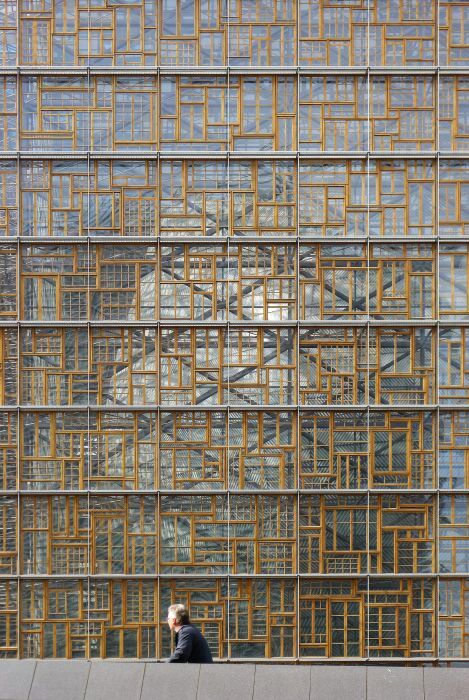 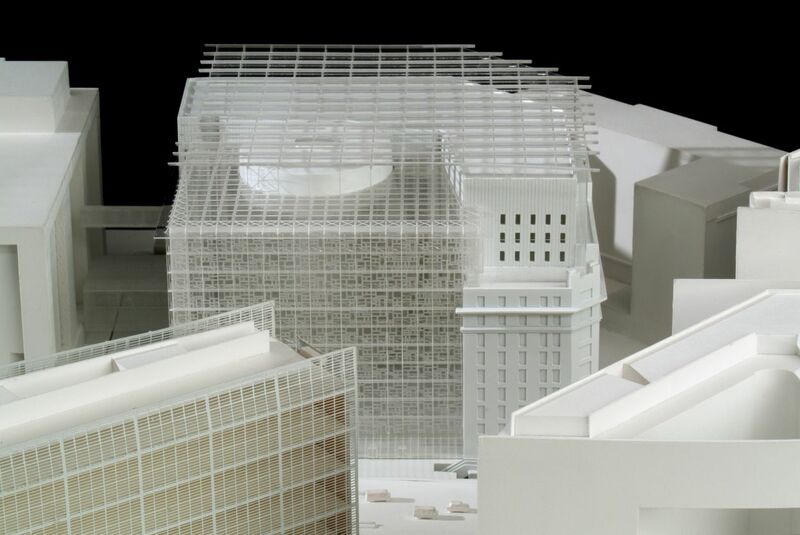 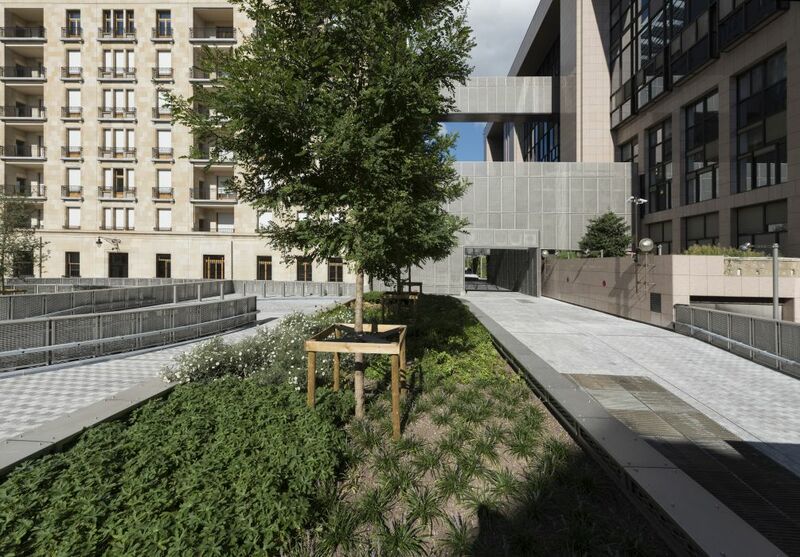 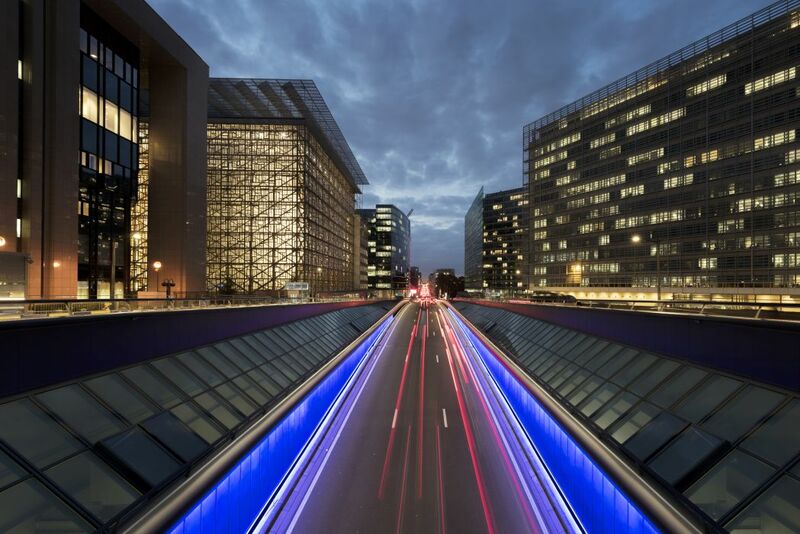 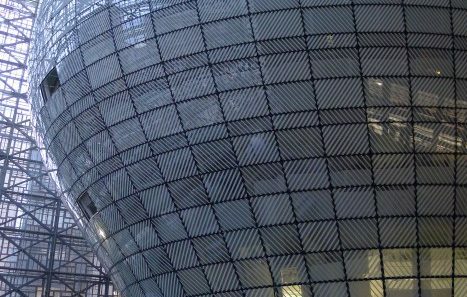 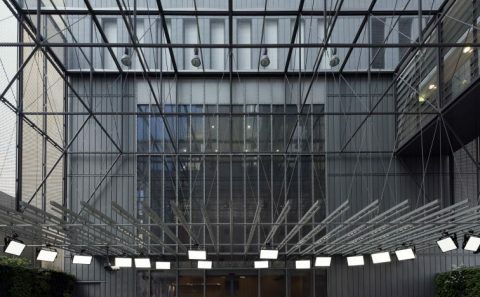 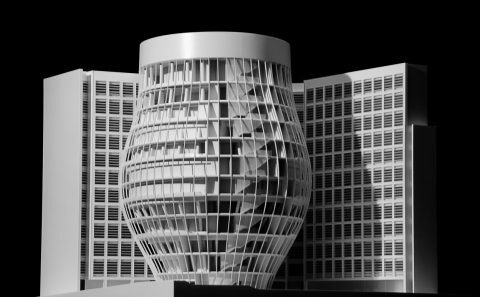 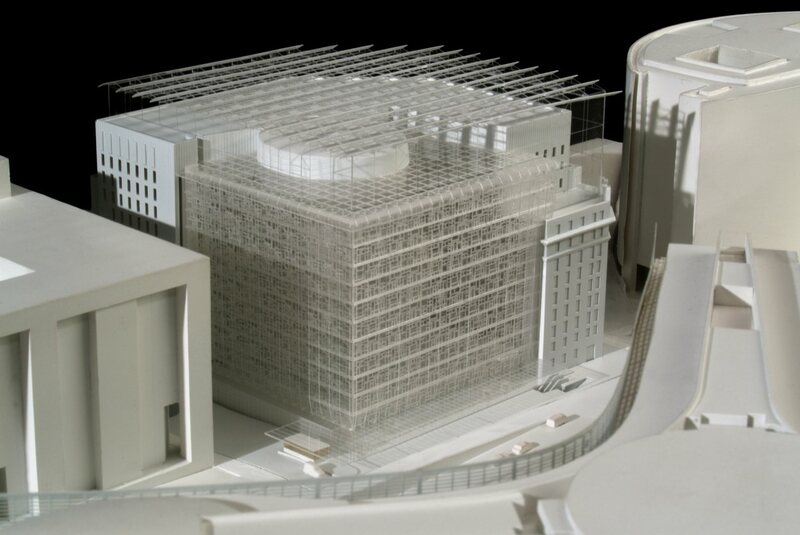 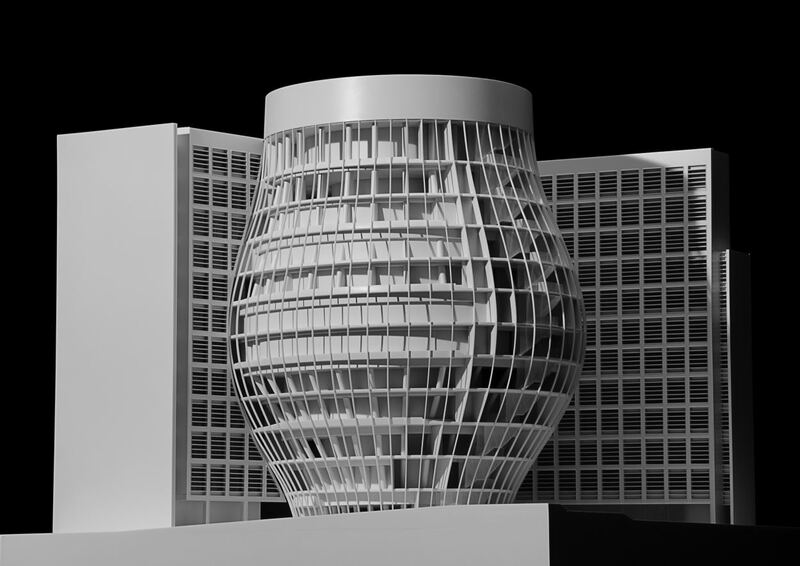 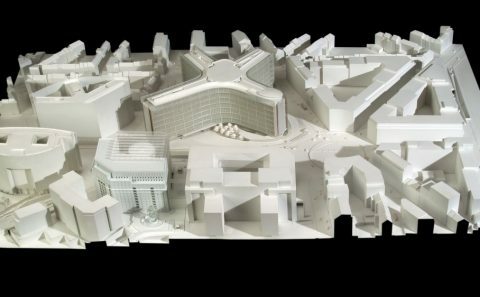 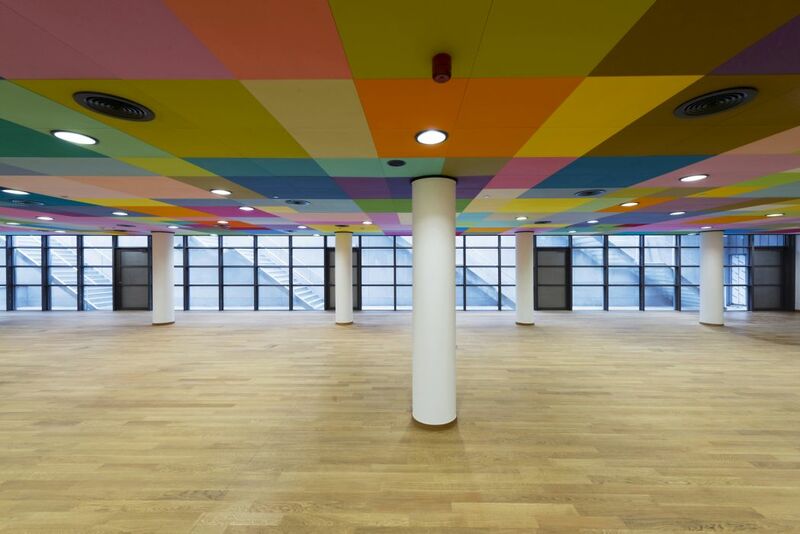 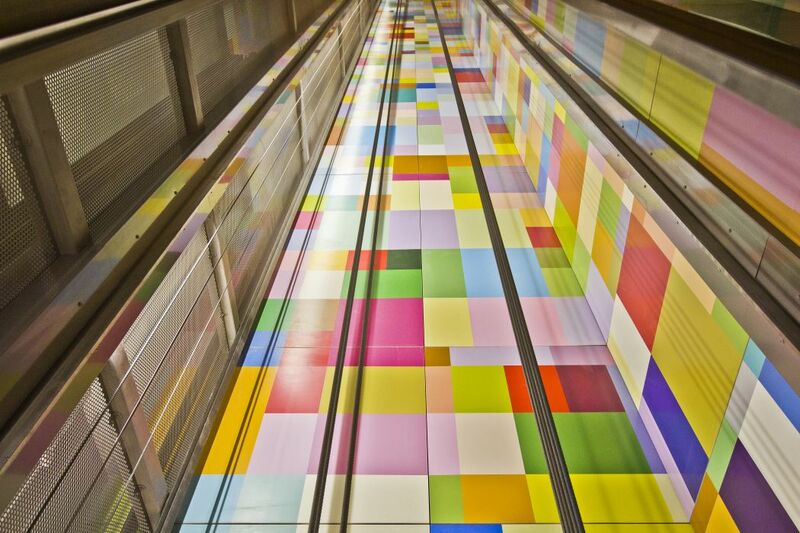 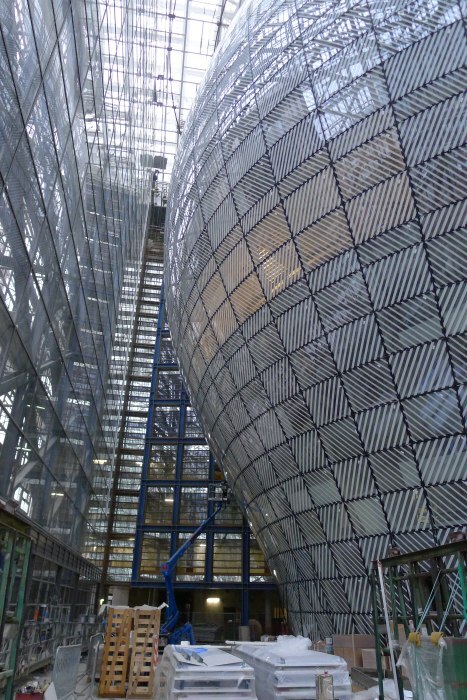 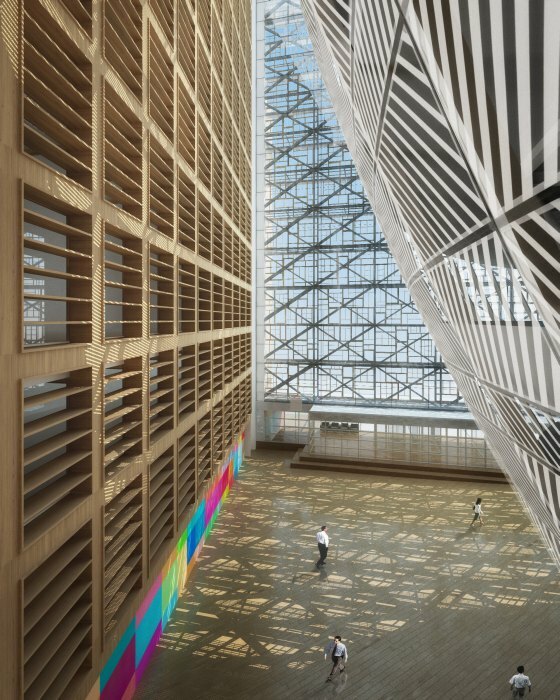 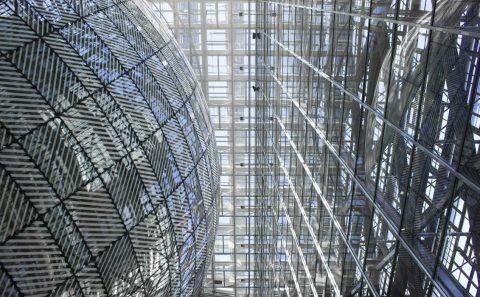 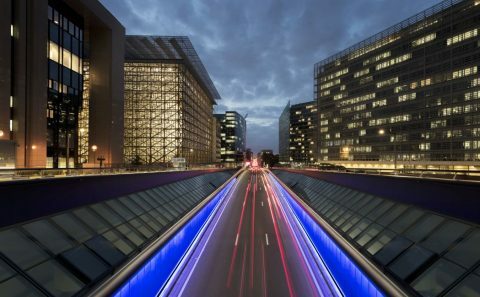 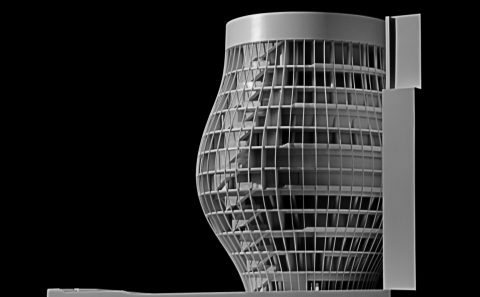 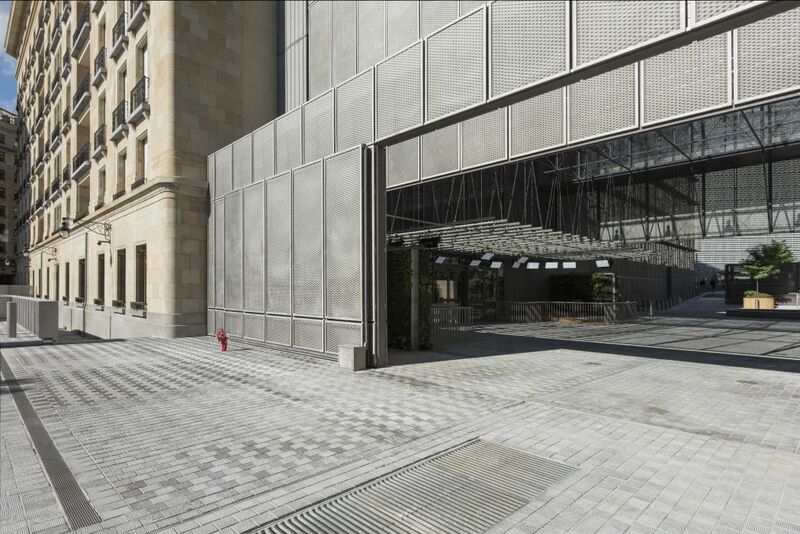 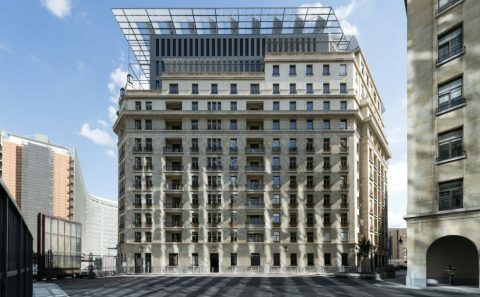 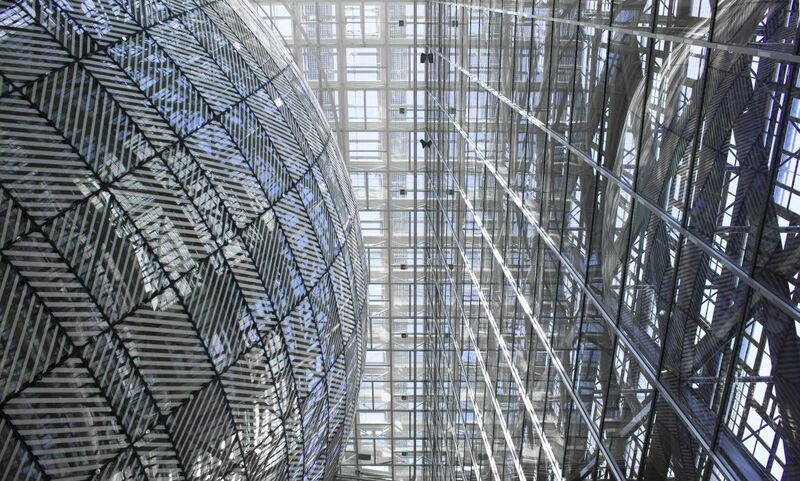 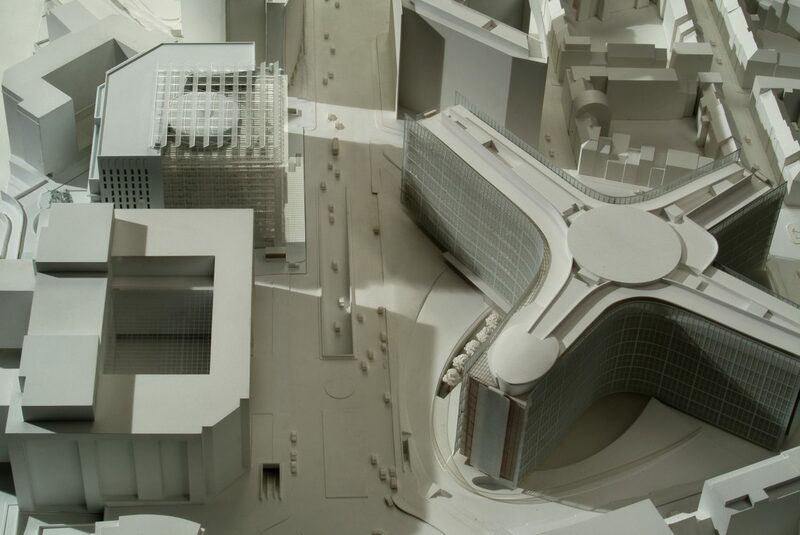 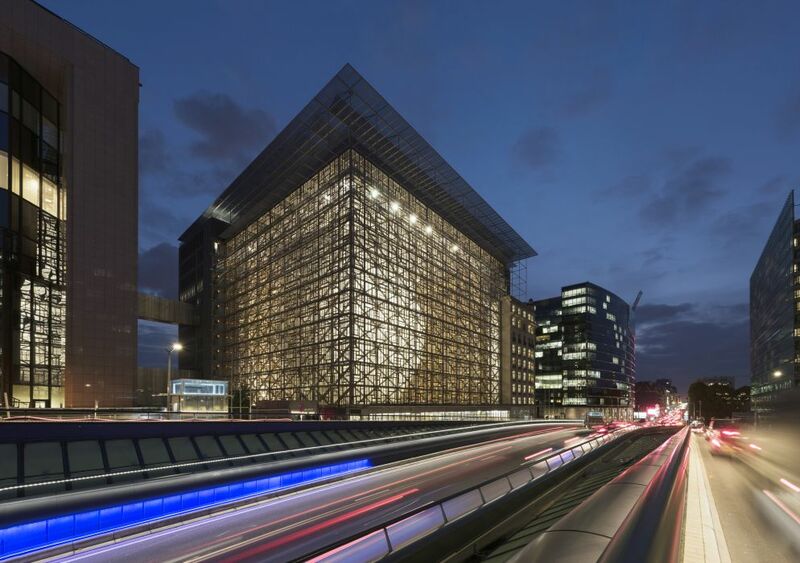 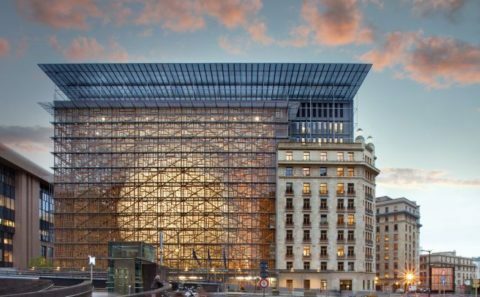 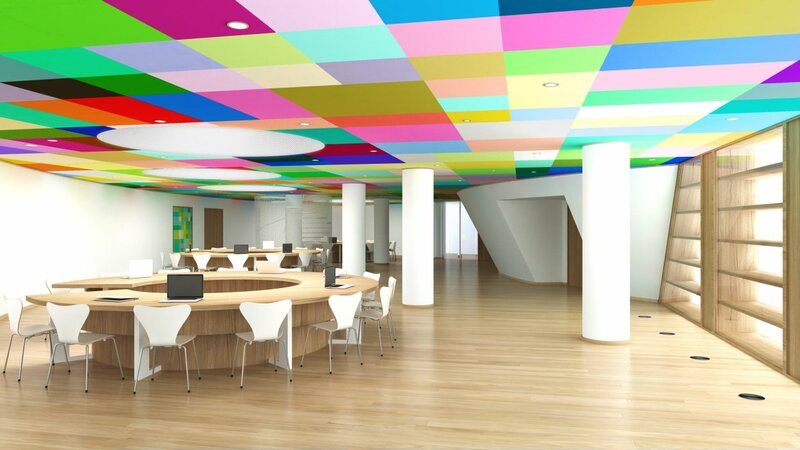 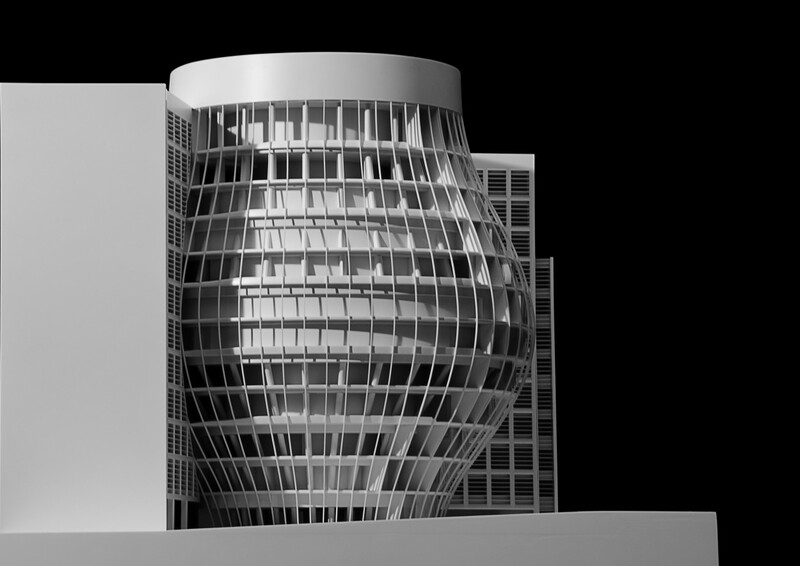 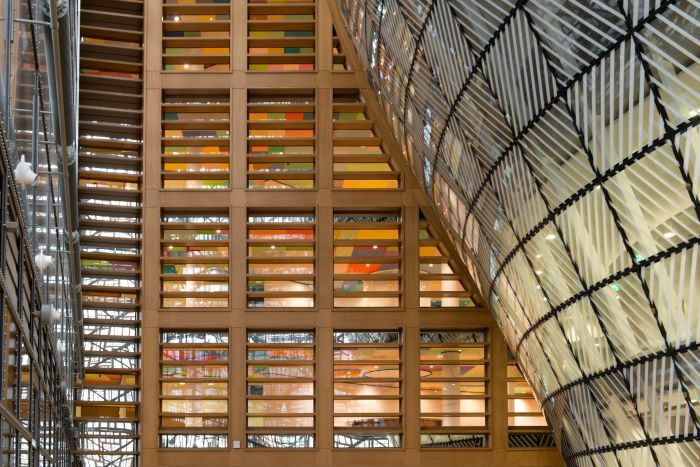 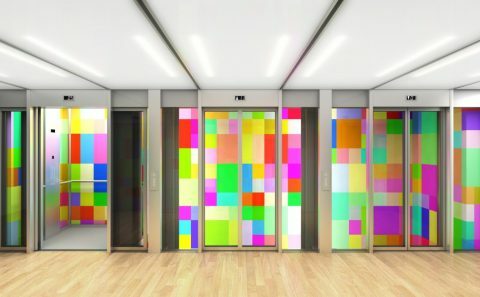 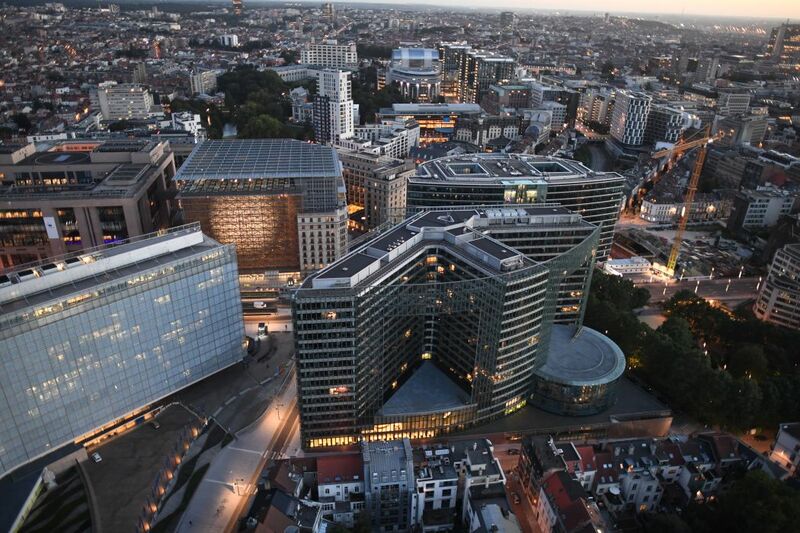 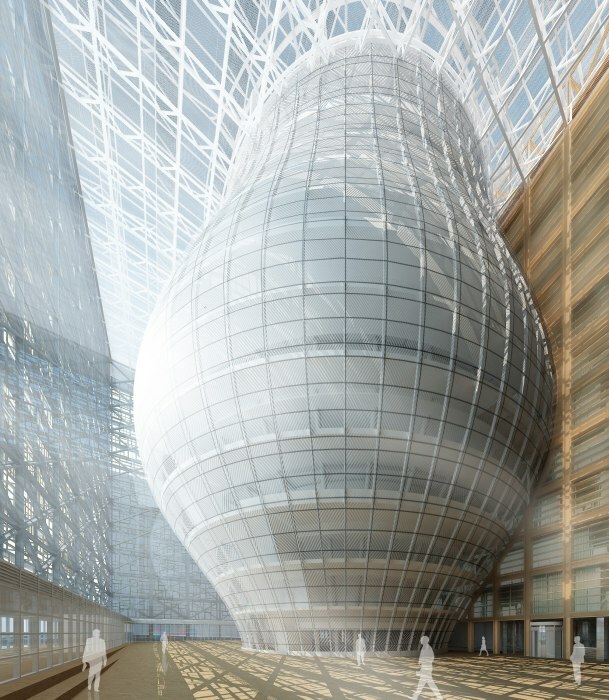 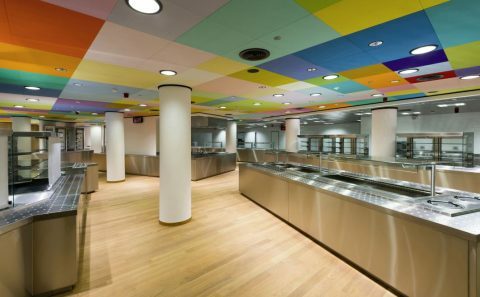 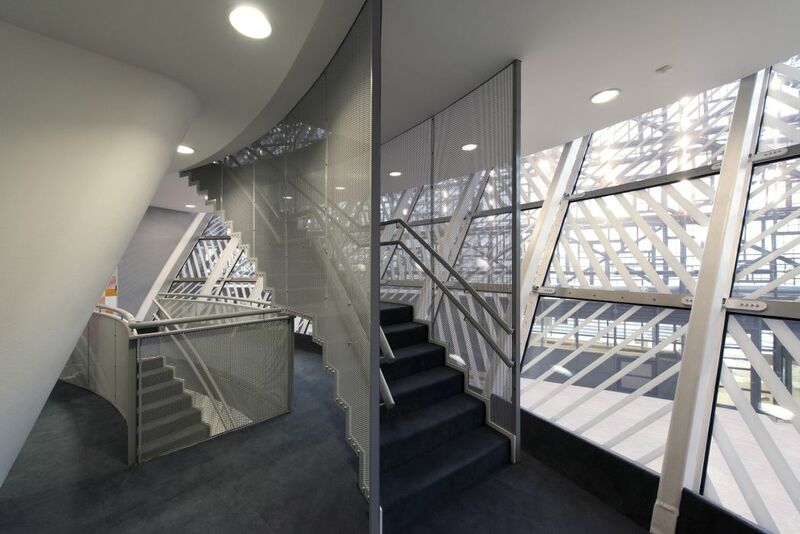 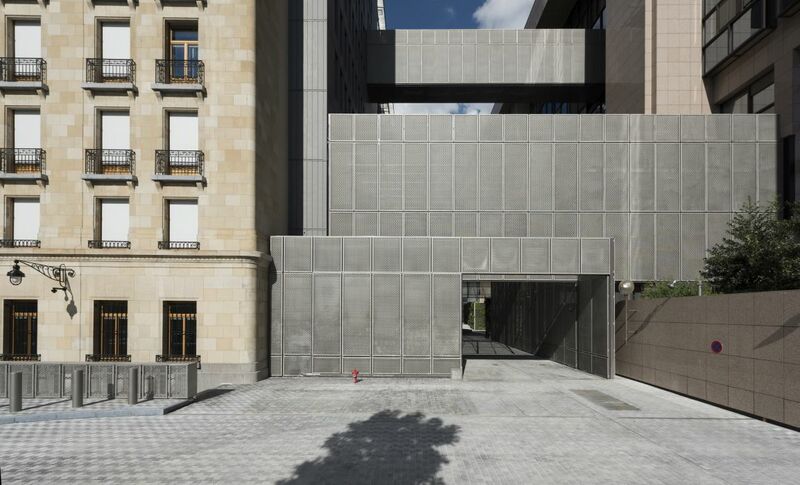 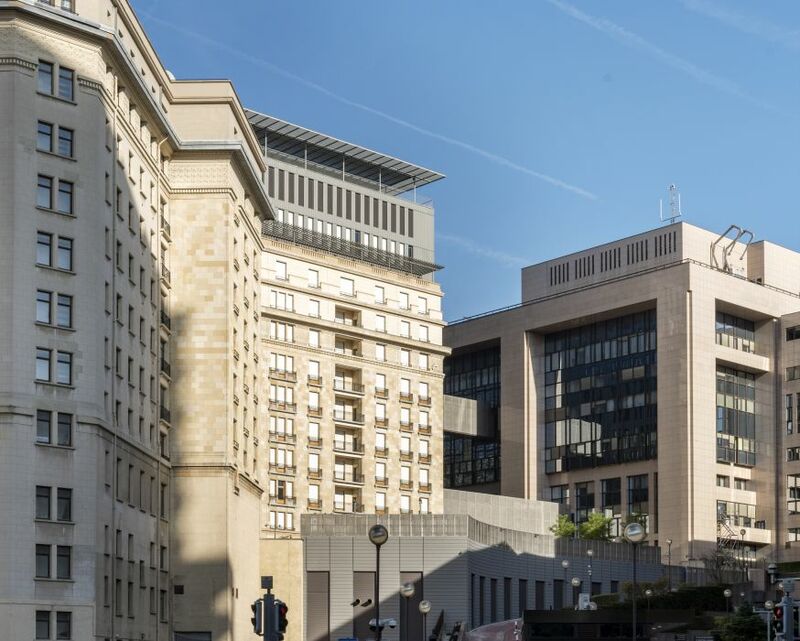 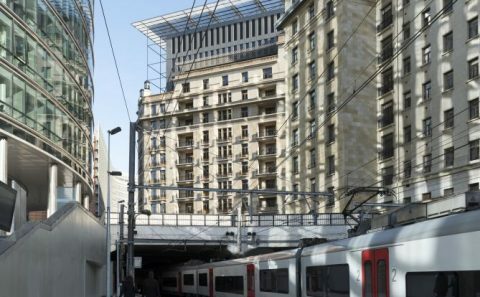 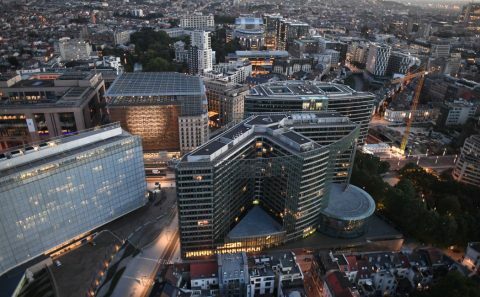 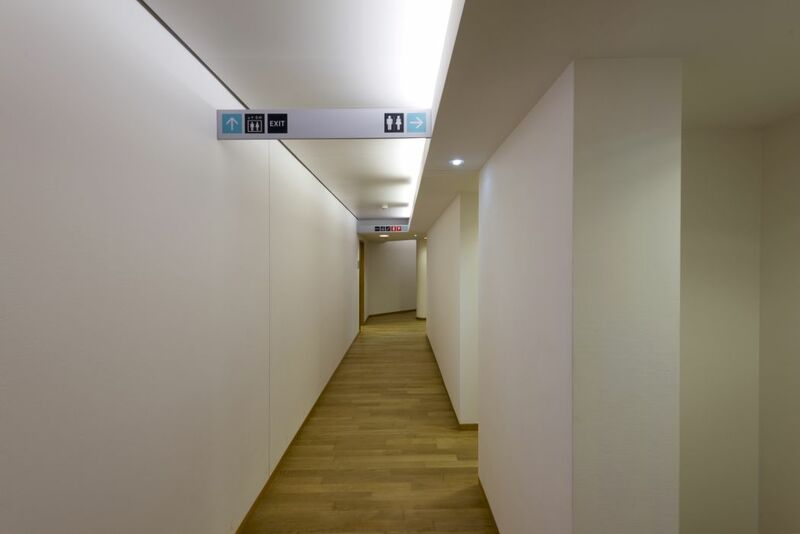 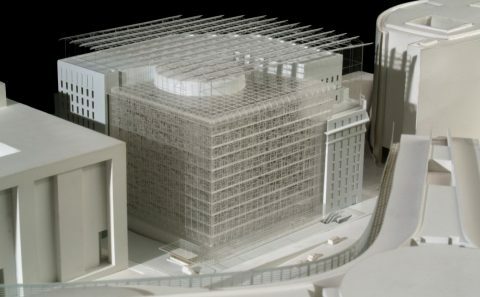 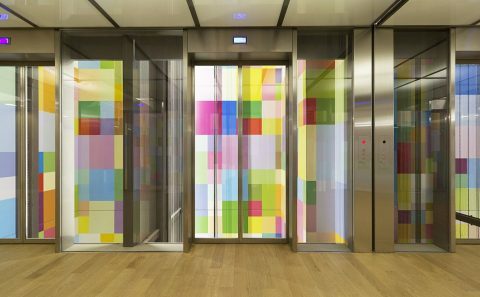 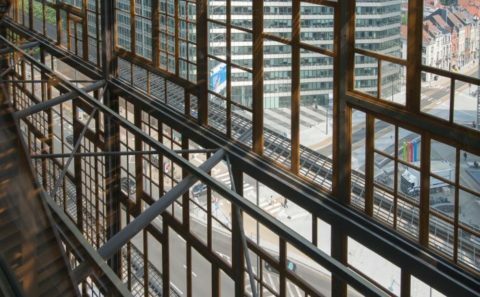 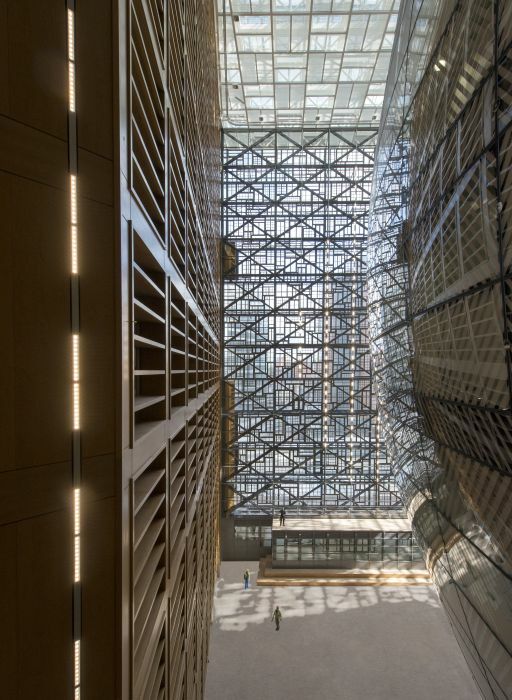 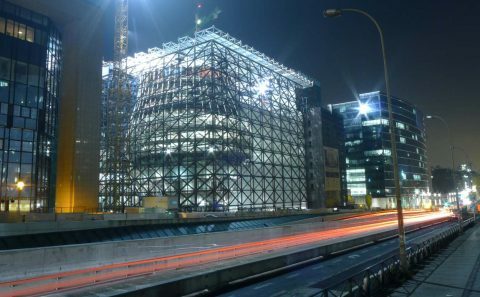 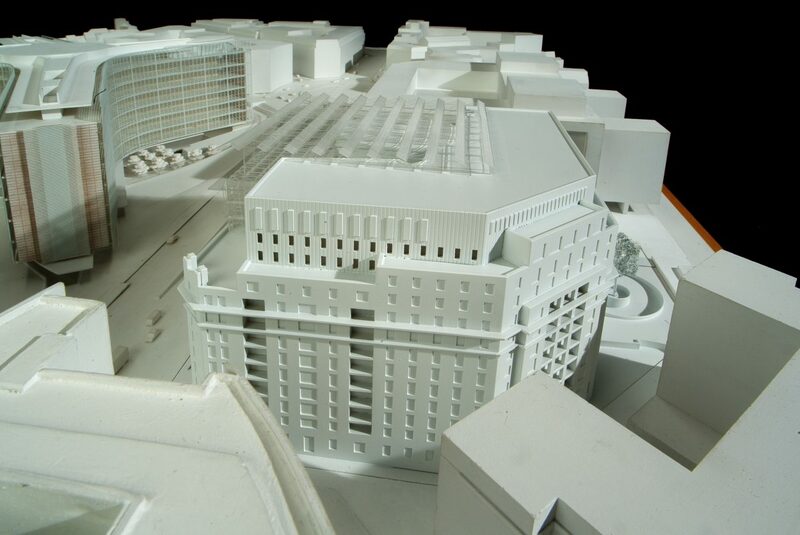 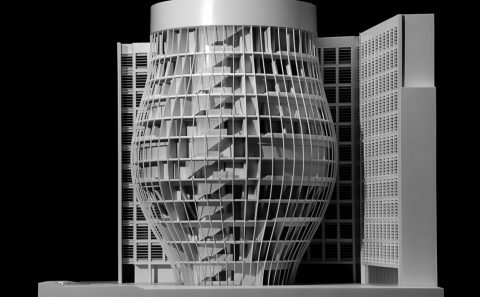 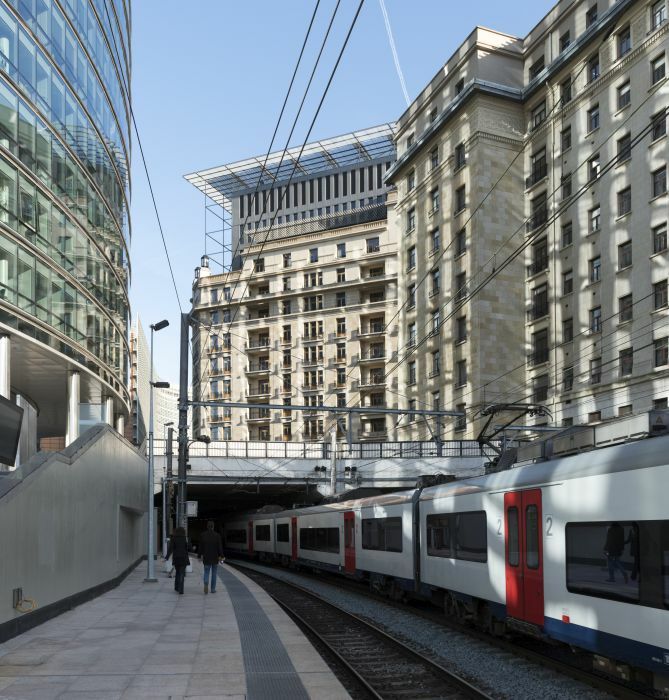 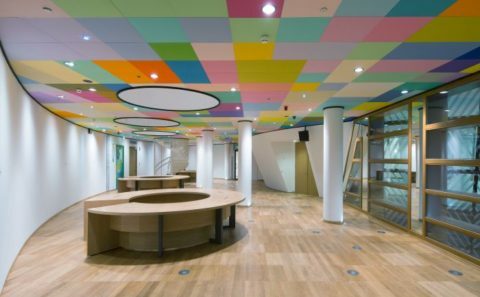 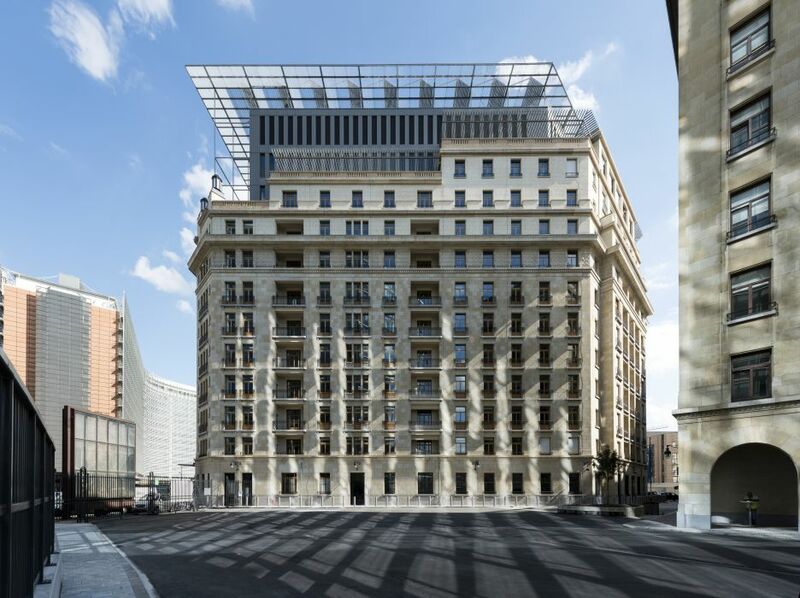 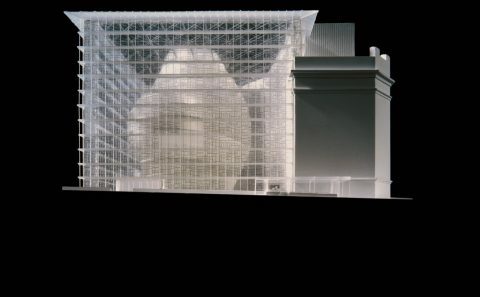 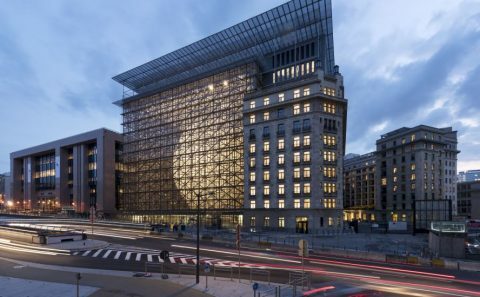 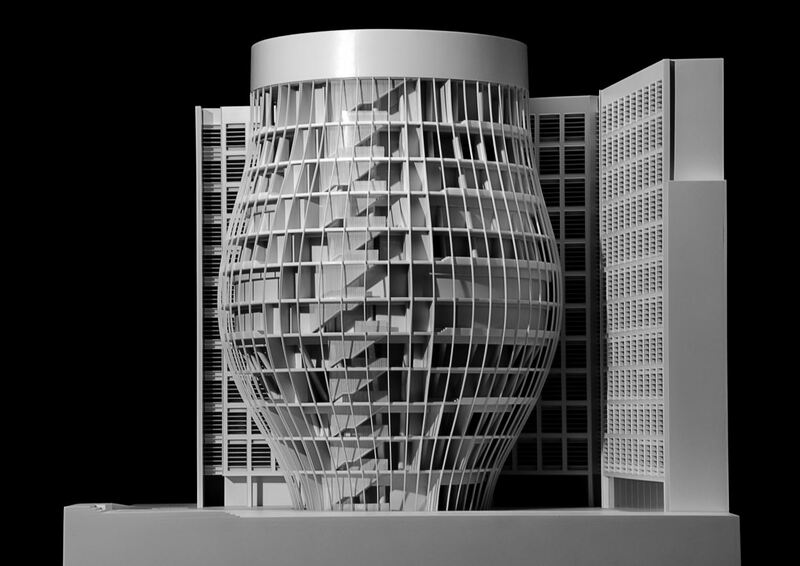 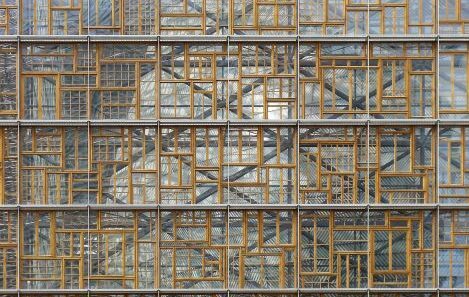 Rue de la Loi 175 1000 Brussels BELGIUM Philippe SAMYN and PARTNERS architects & engineers, LEAD and DESIGN PARTNER. 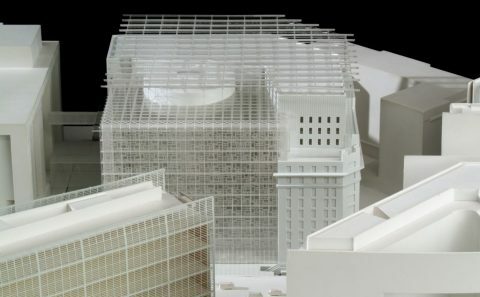 With Studio Valle Progettazioni architects, Buro Happold engineers. 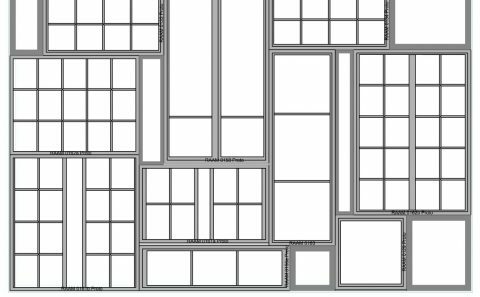 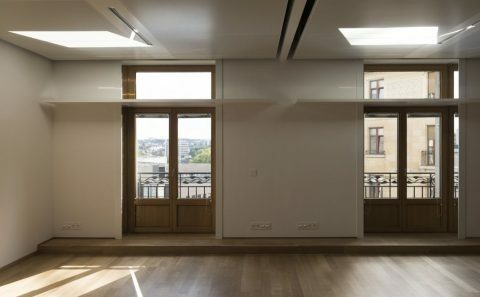 53.815 sqm. 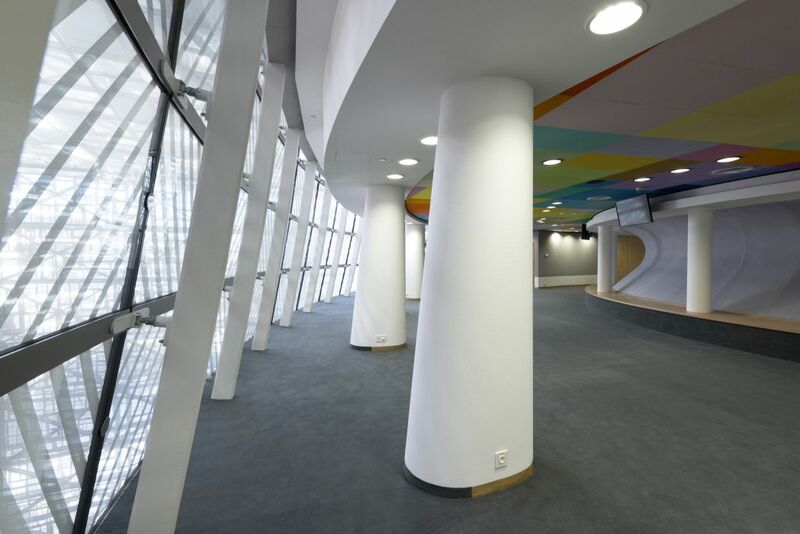 superstructure (office and conference rooms); 17.184 sqm. 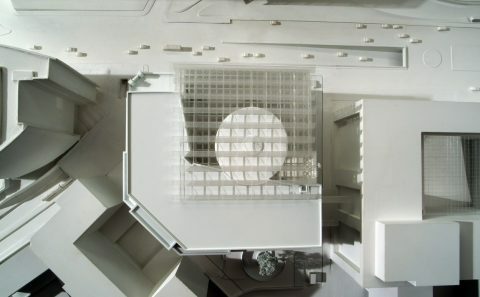 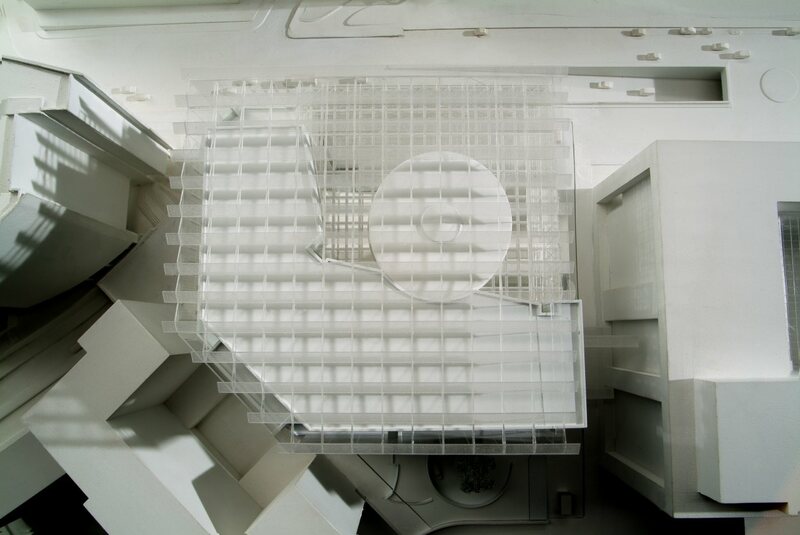 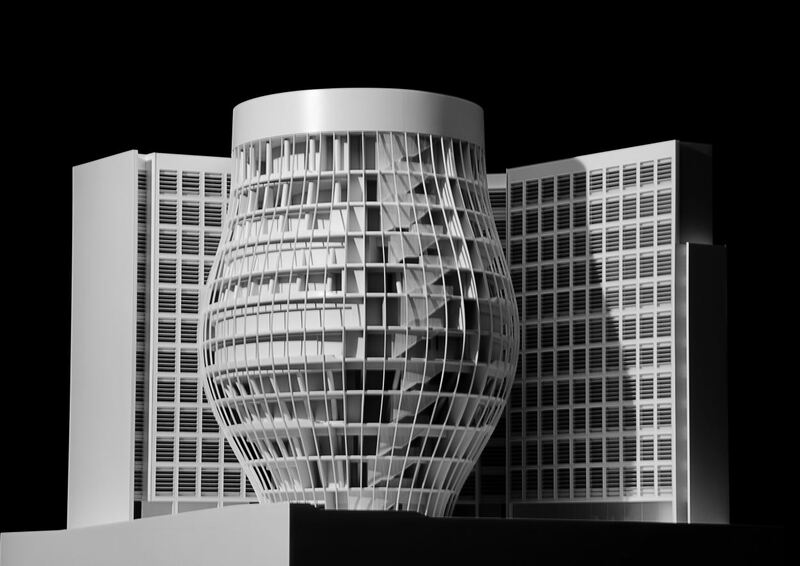 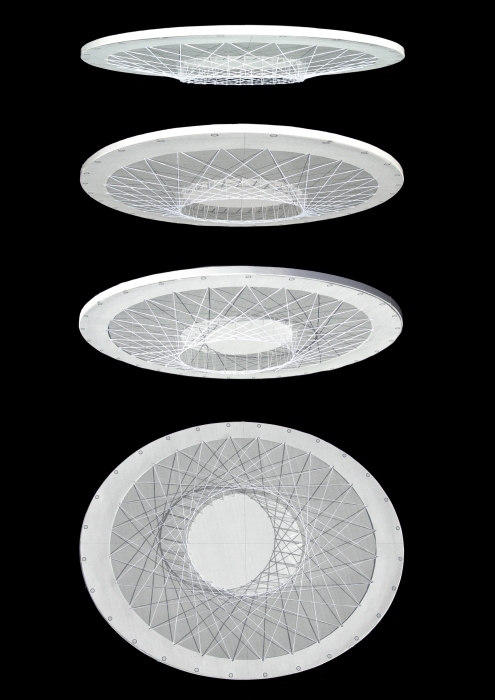 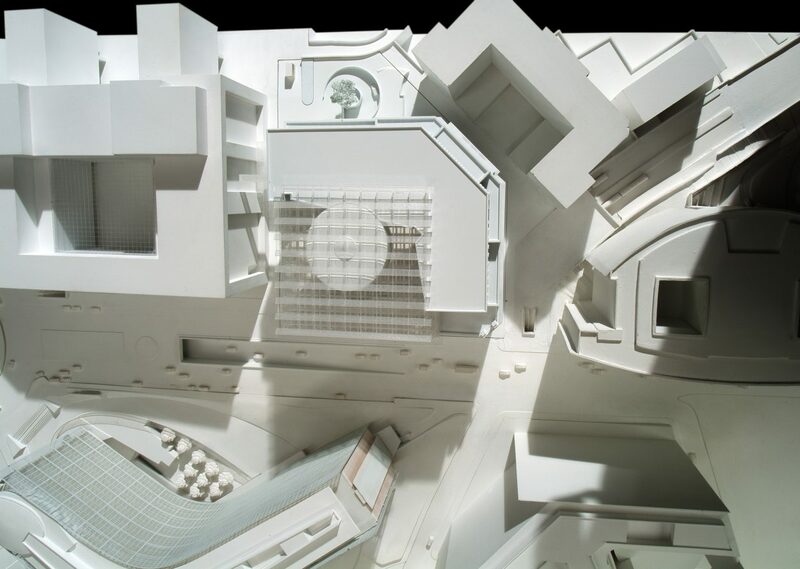 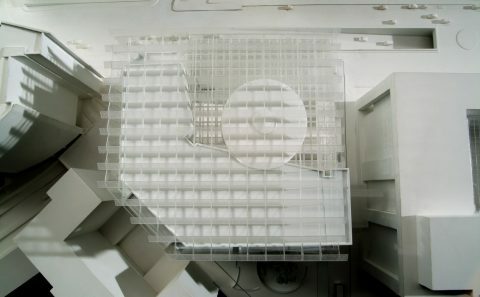 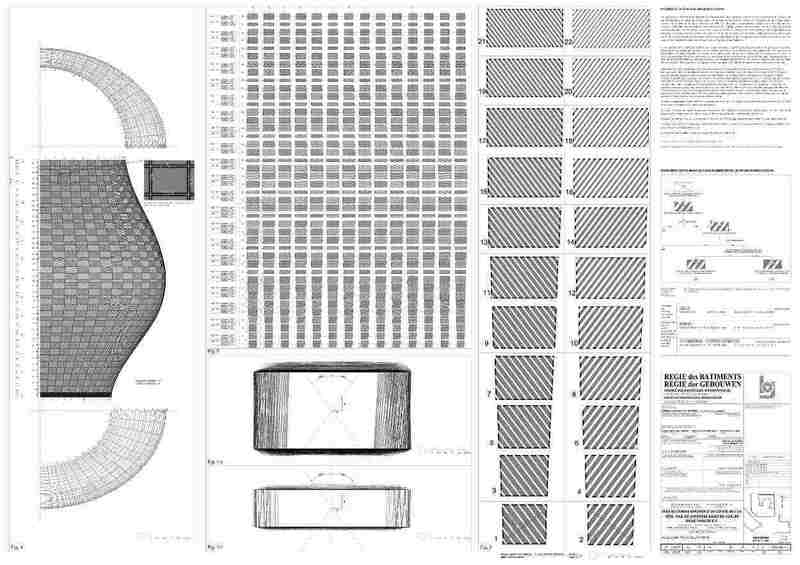 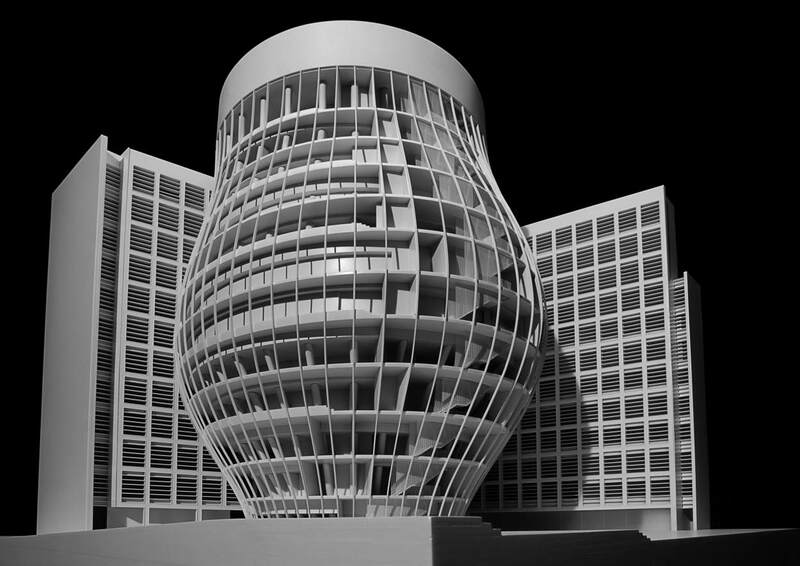 infrastructure · Architecture (with Studio Valle Progettazioni). 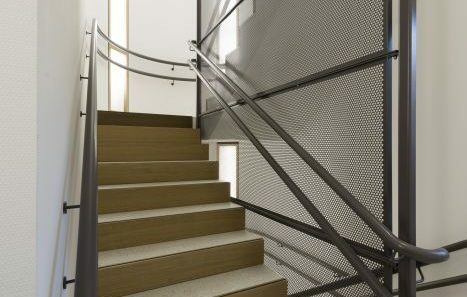 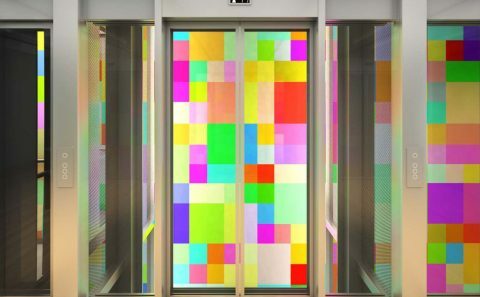 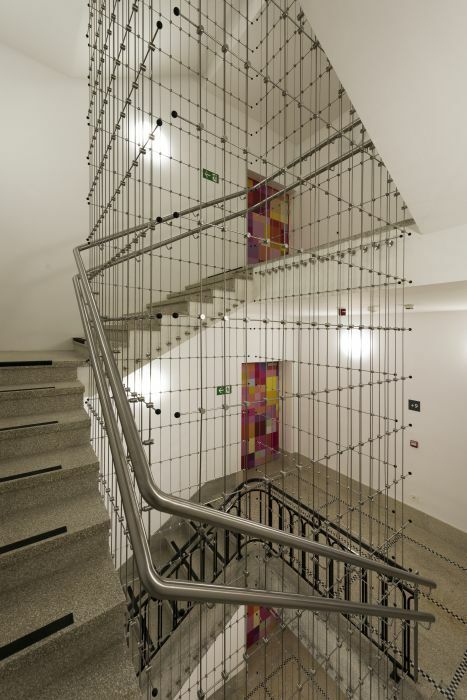 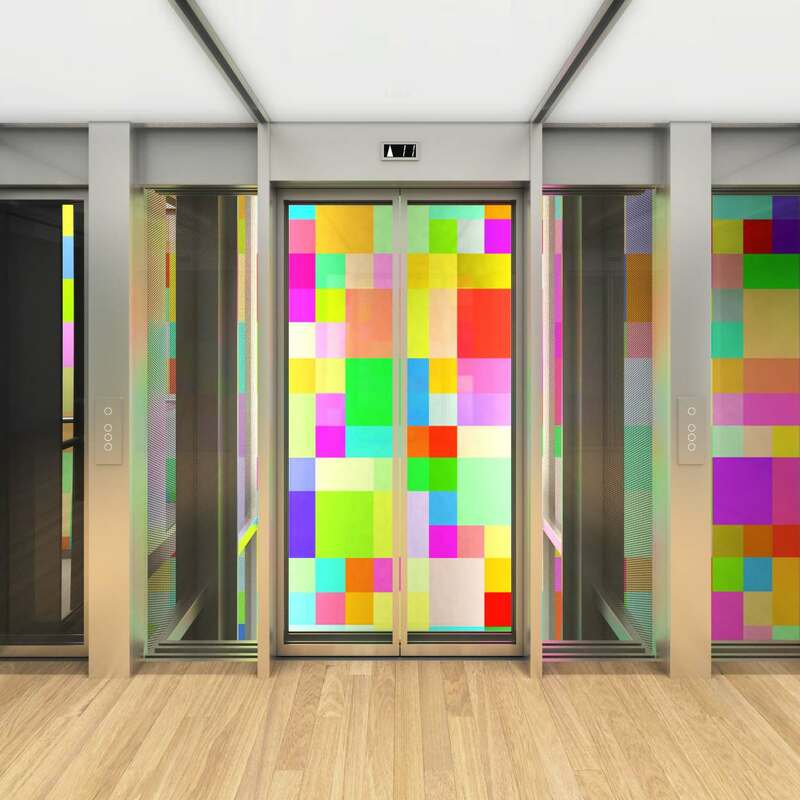 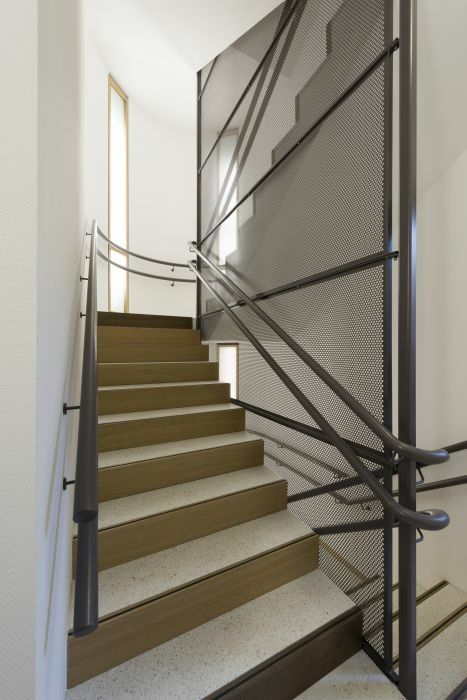 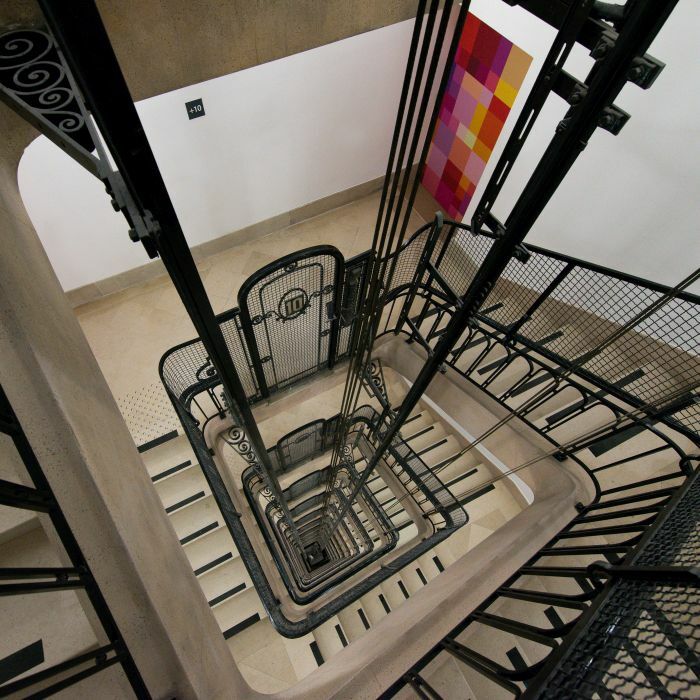 · Interior design (with Studio Valle Progettazioni). 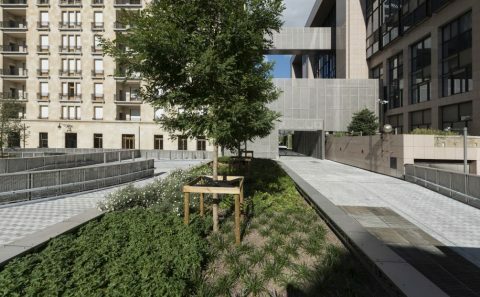 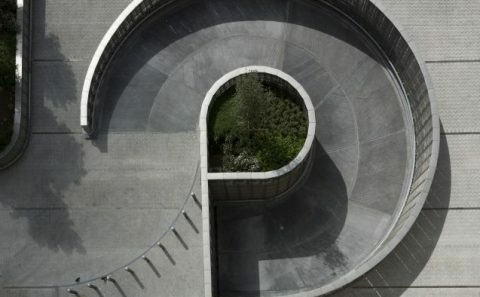 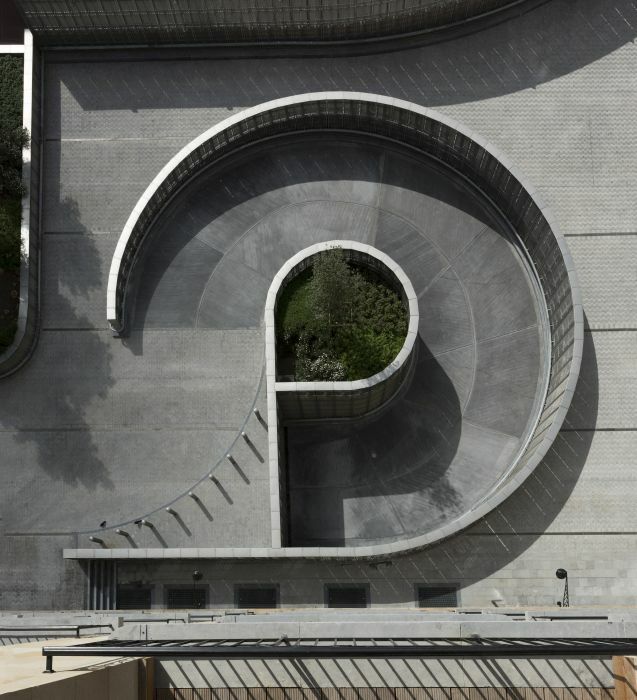 · Landscaping (with Studio Valle Progettazioni). 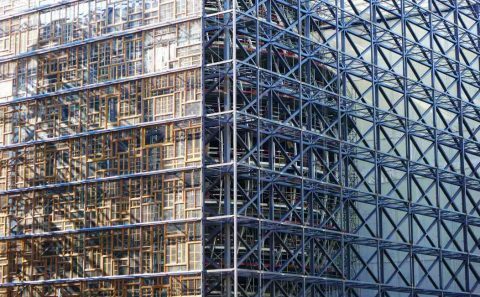 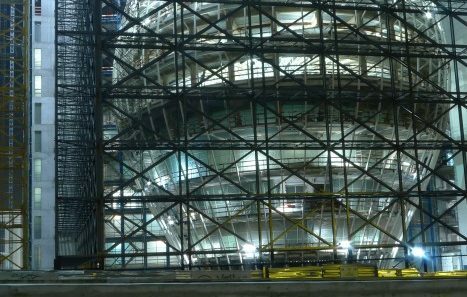 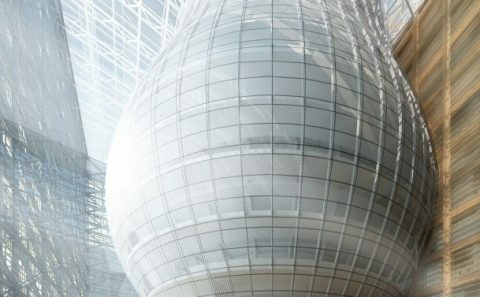 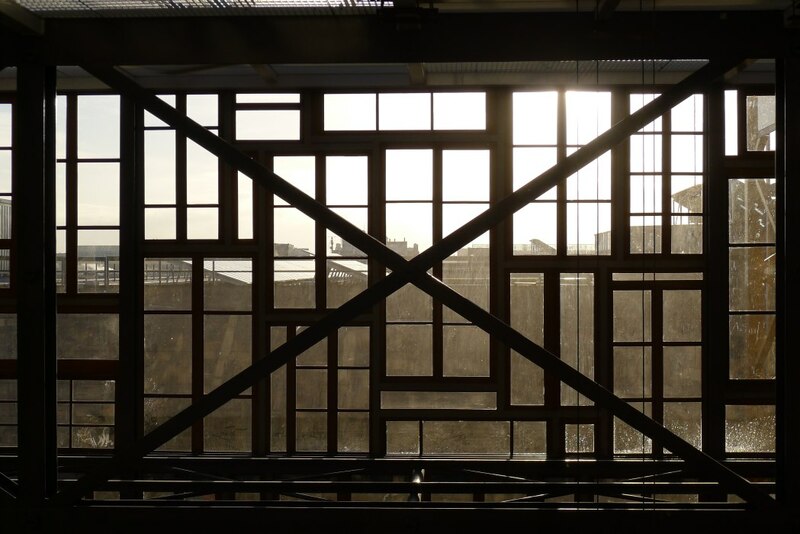 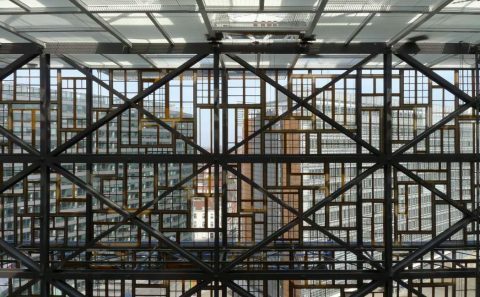 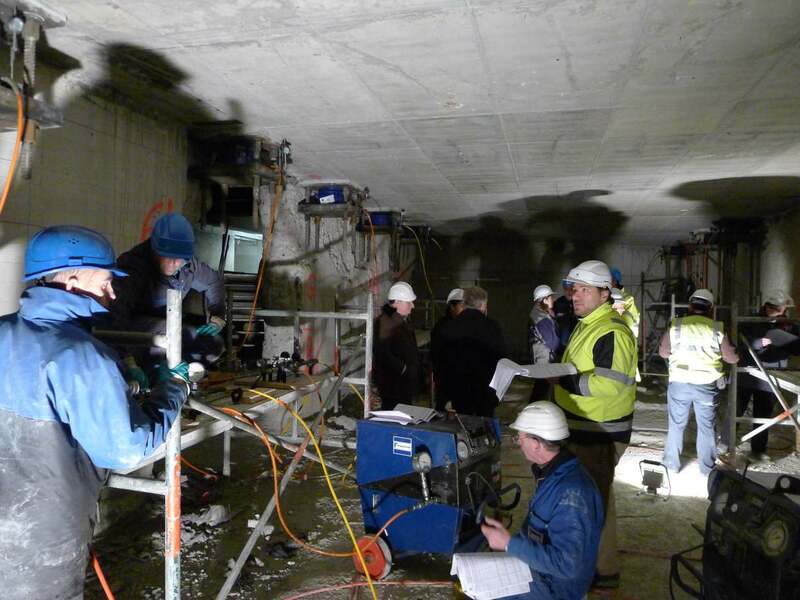 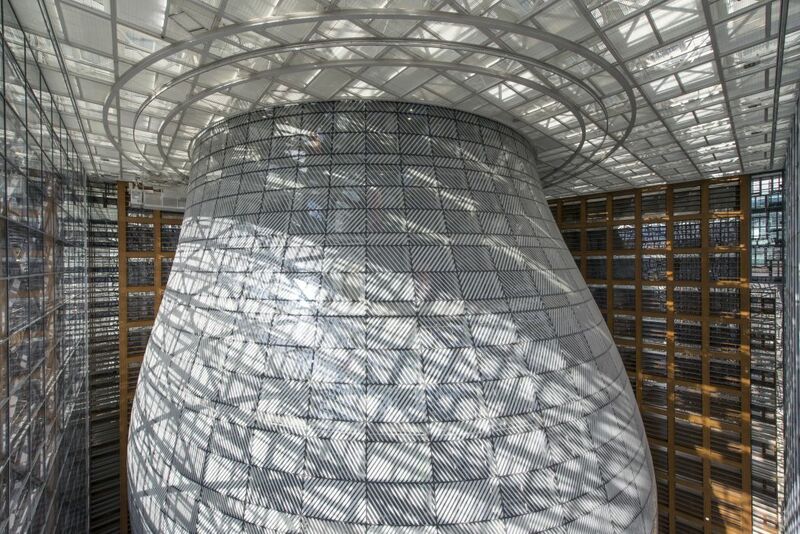 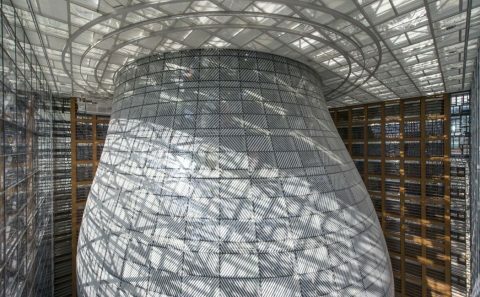 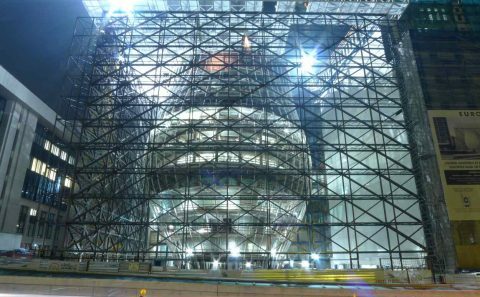 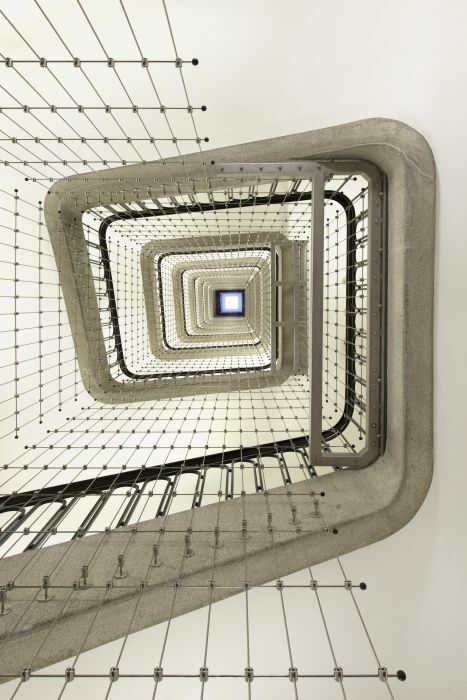 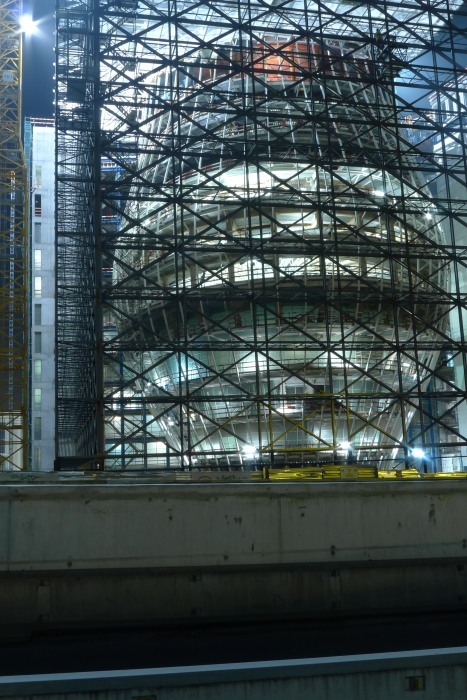 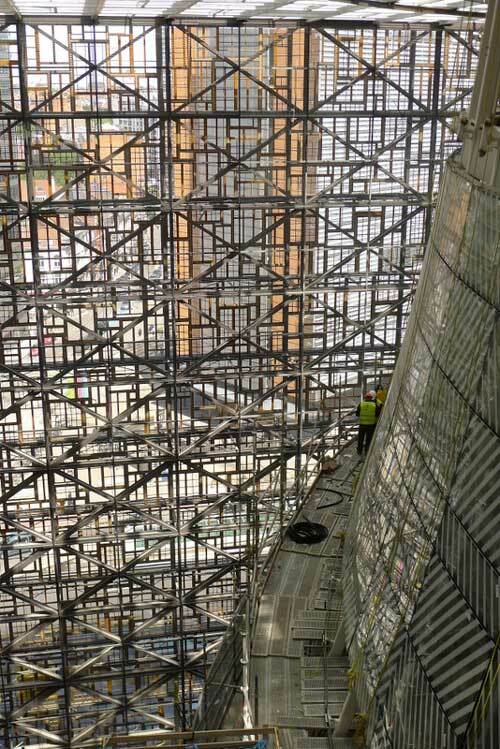 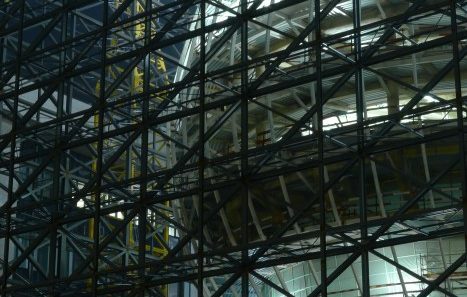 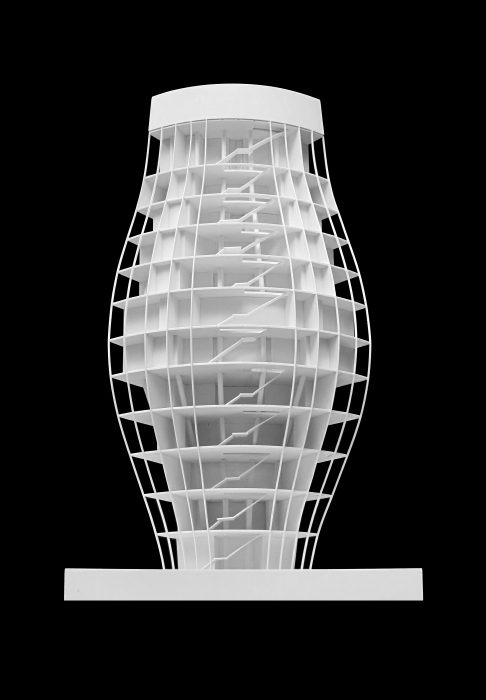 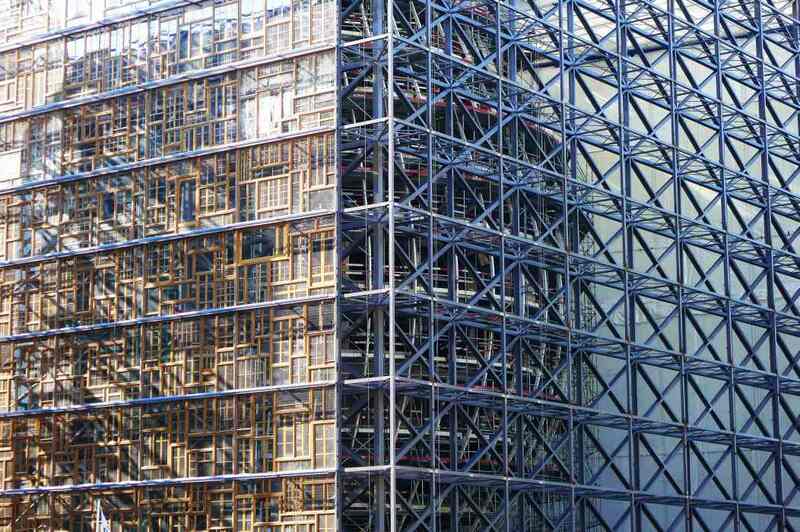 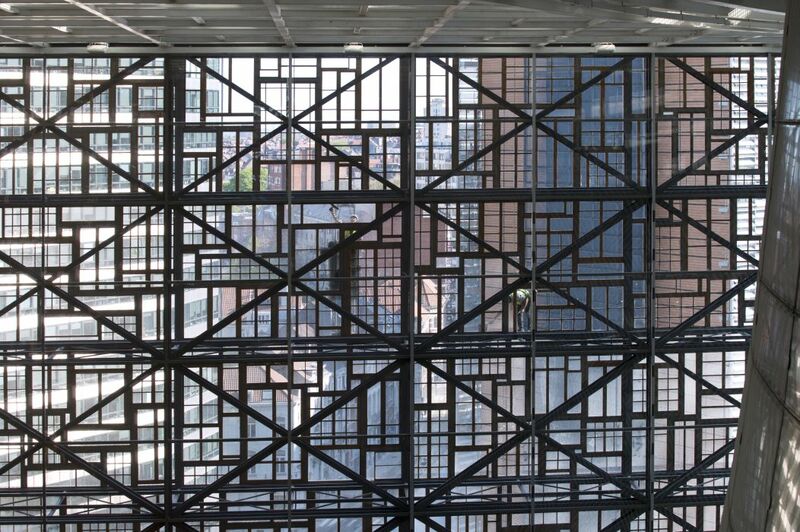 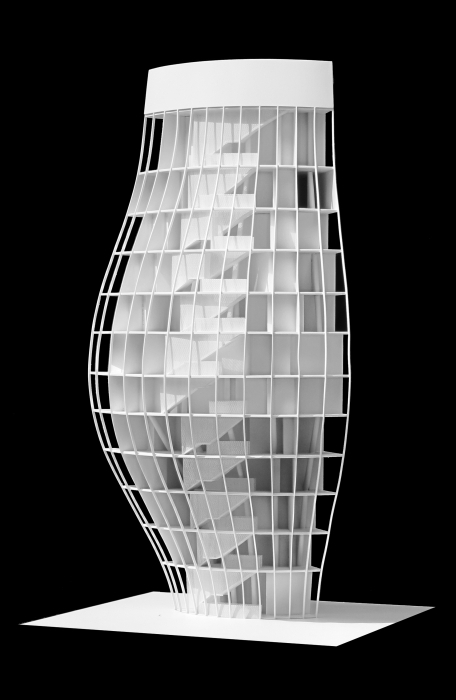 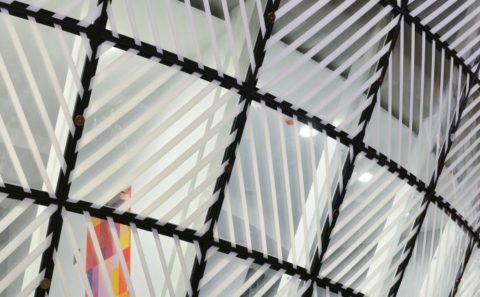 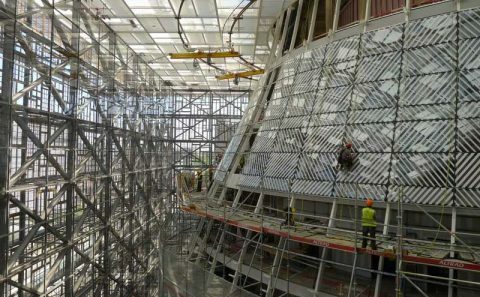 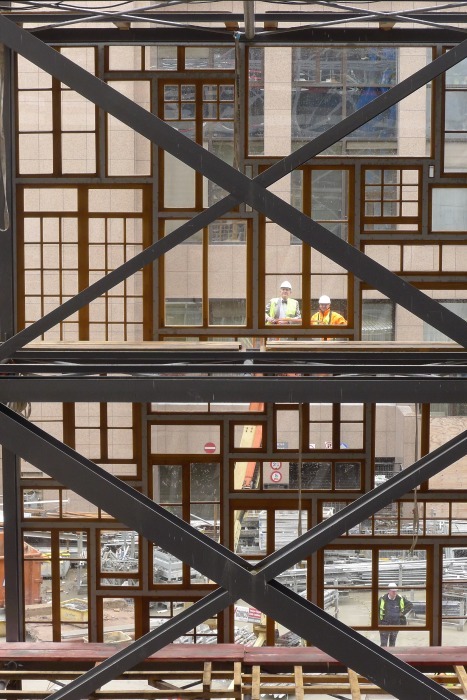 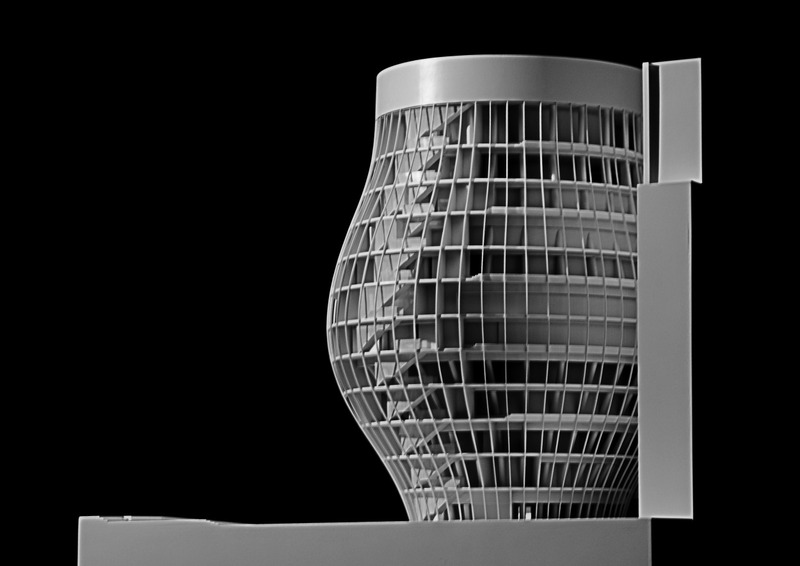 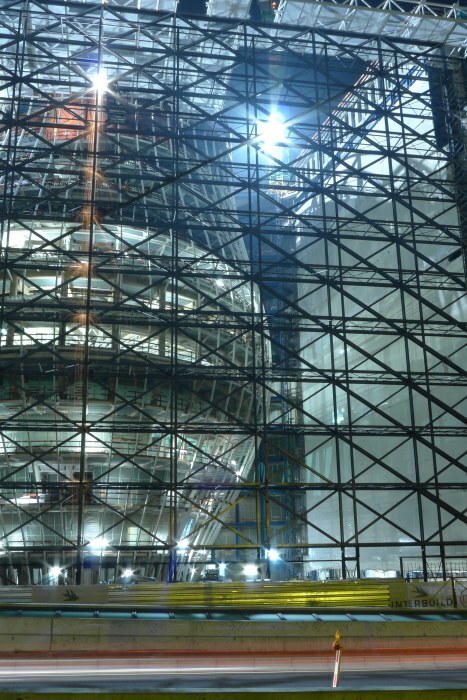 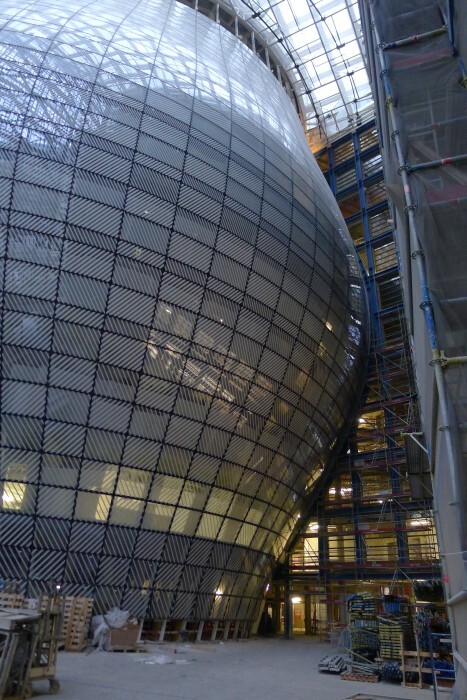 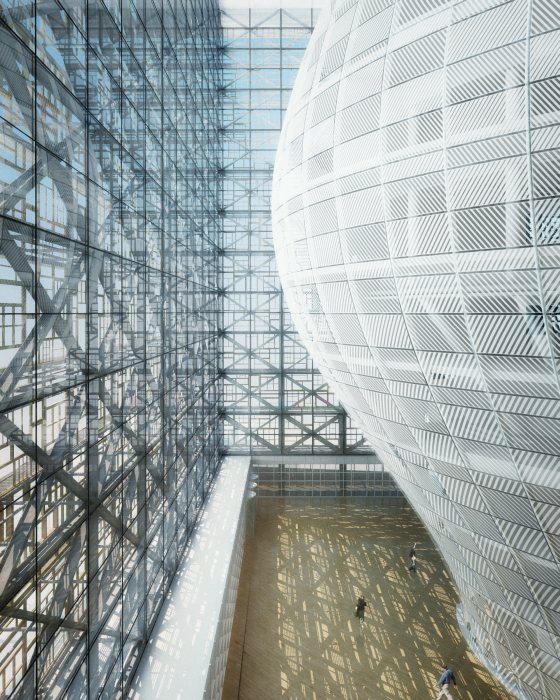 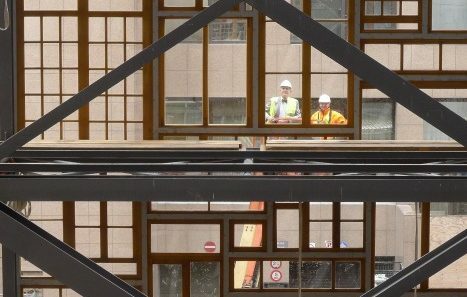 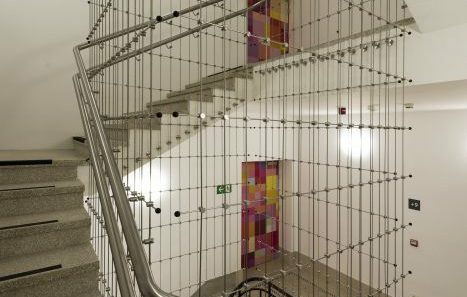 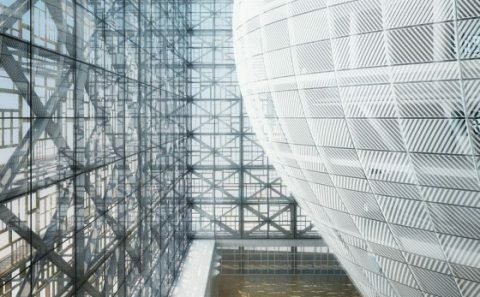 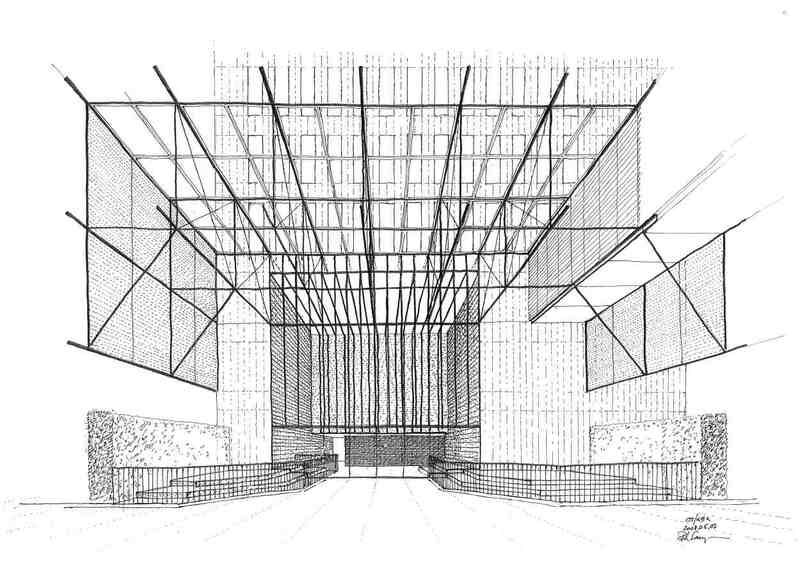 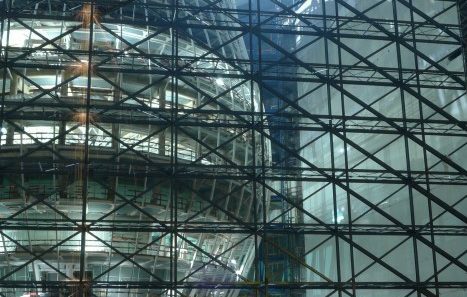 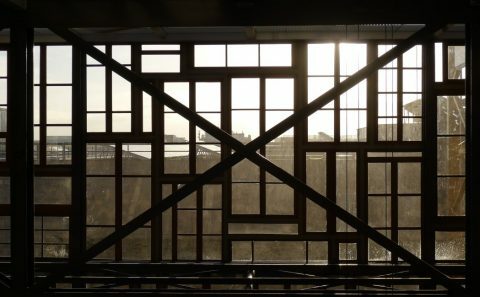 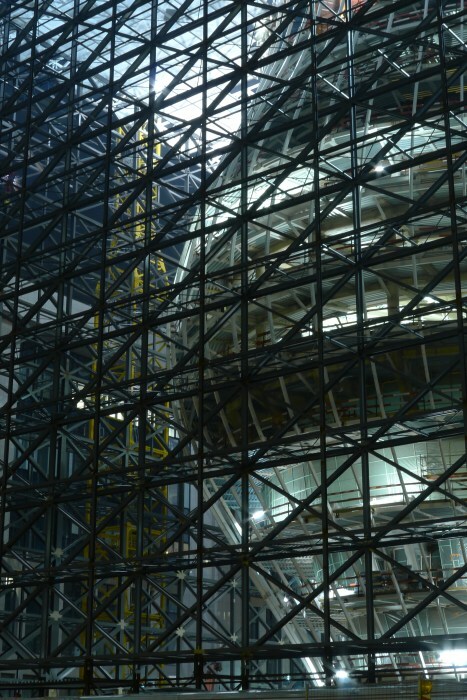 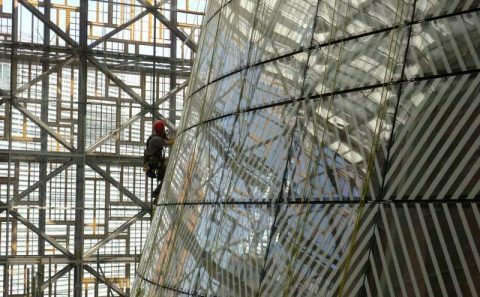 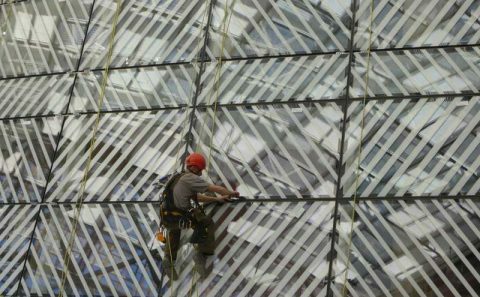 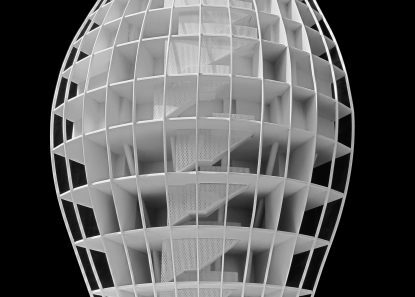 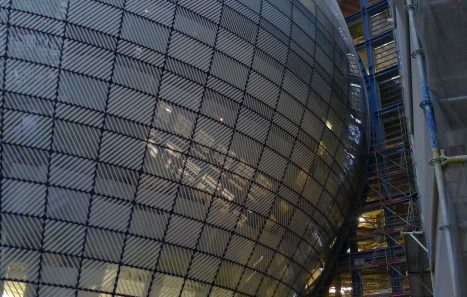 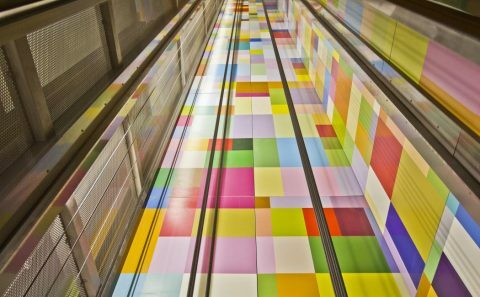 · Structural Engineering (with Buro Happold). 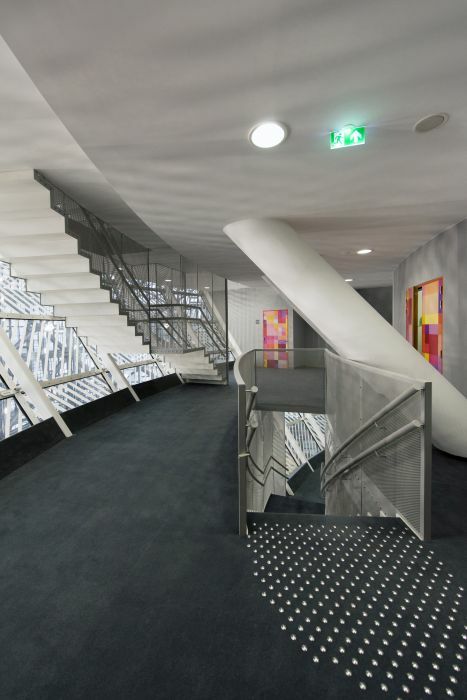 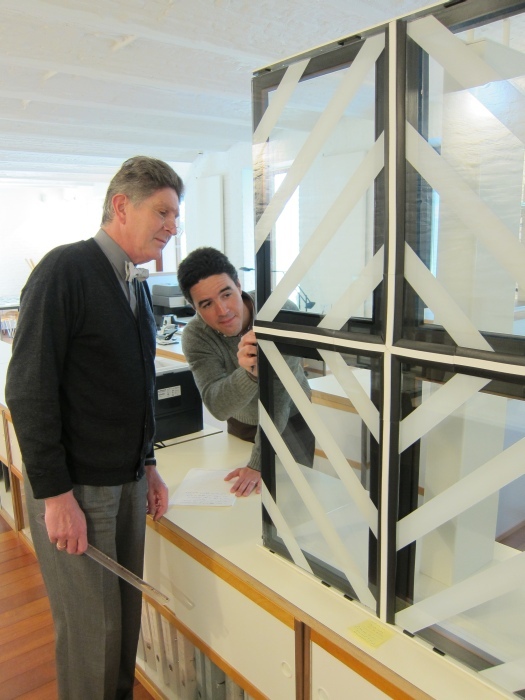 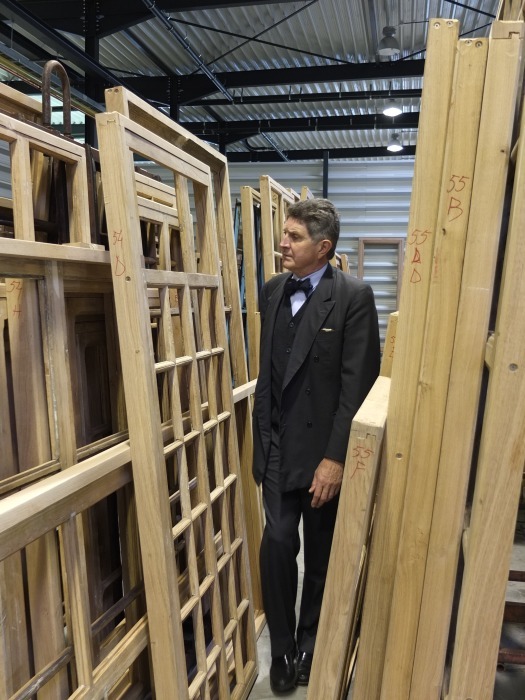 Lead Design Partner : Philippe Samyn. 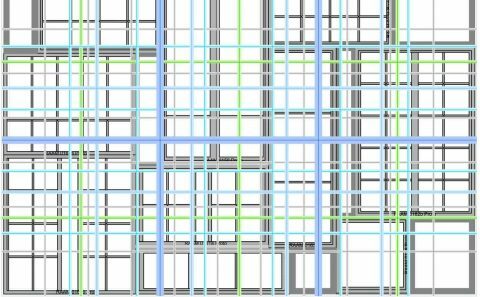 (2005-2016); (01-494). 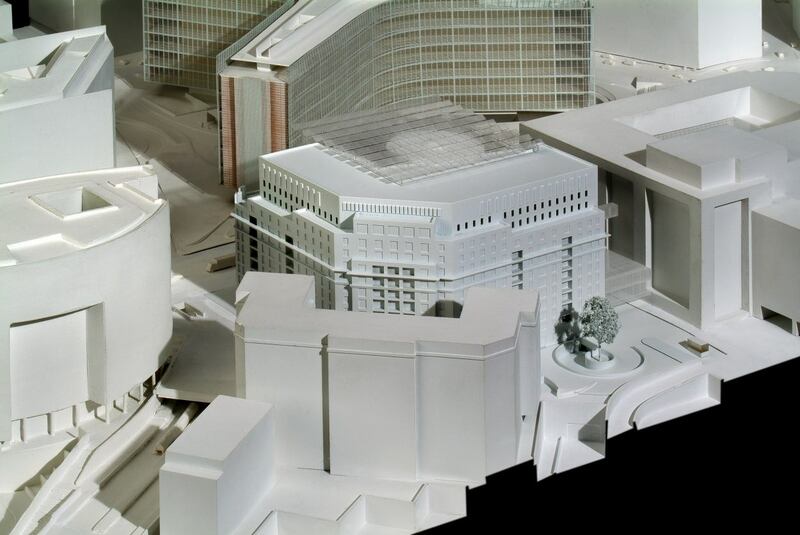 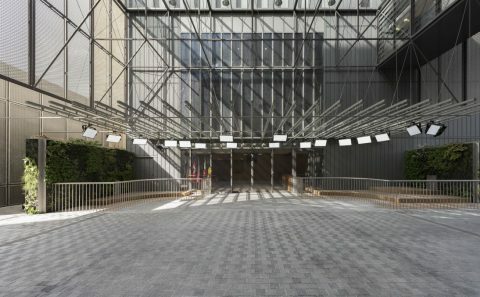 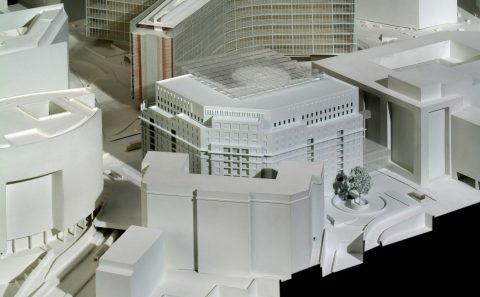 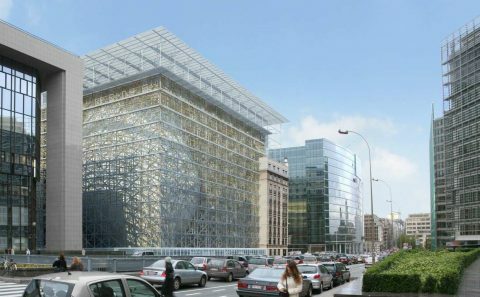 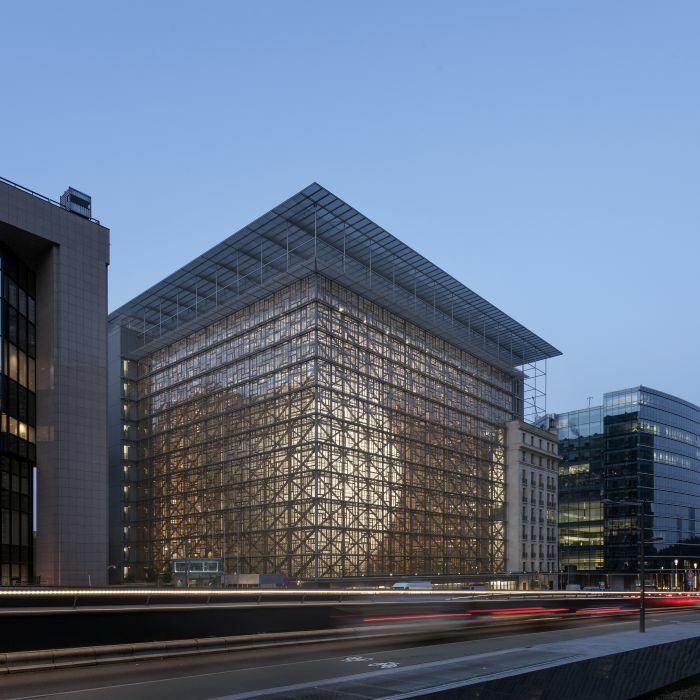 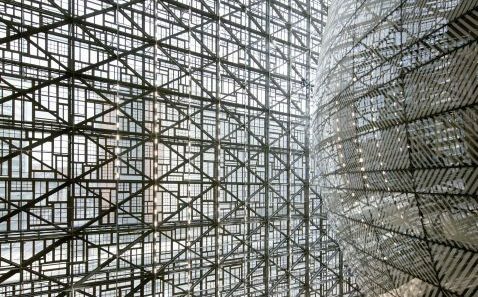 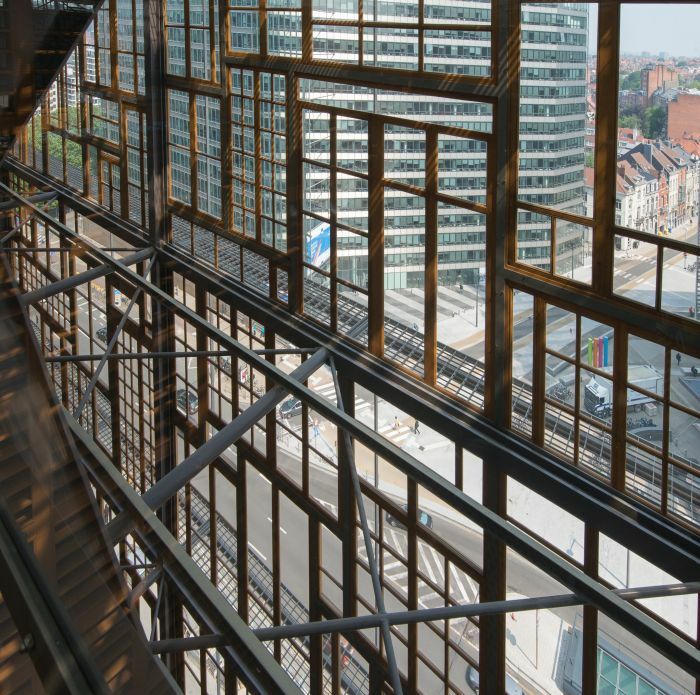 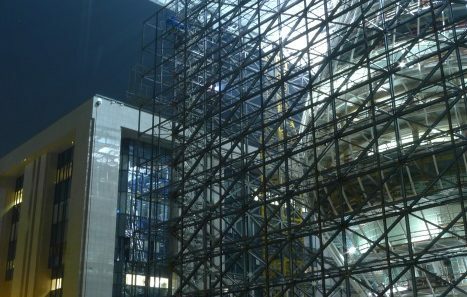 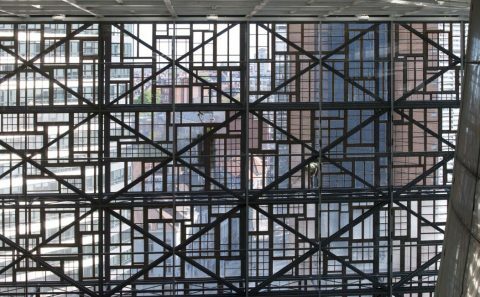 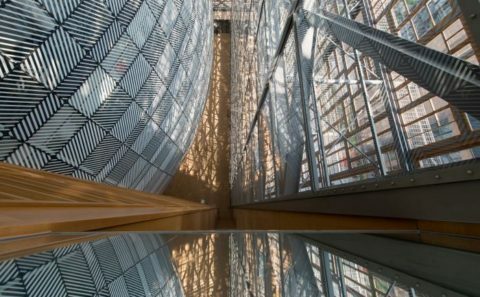 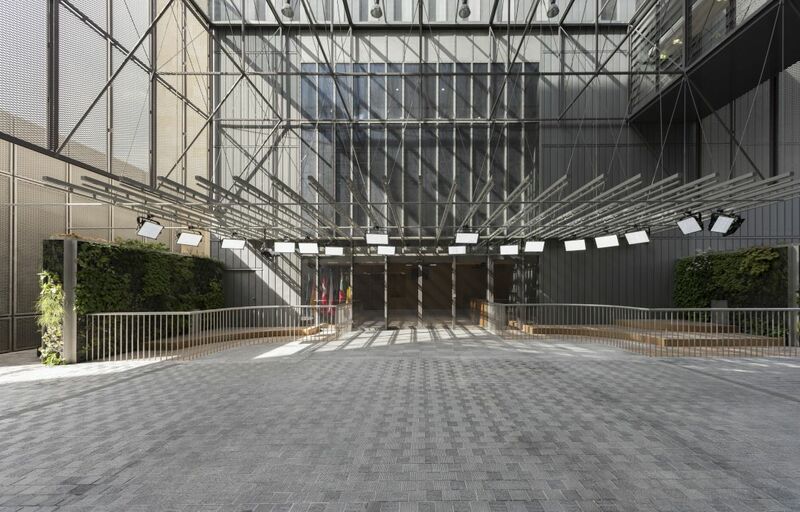 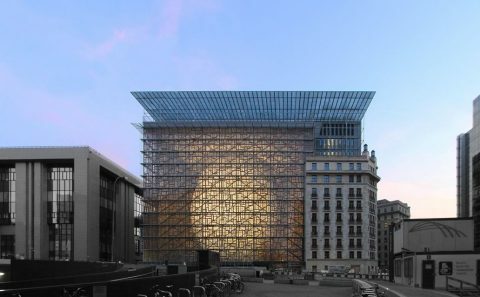 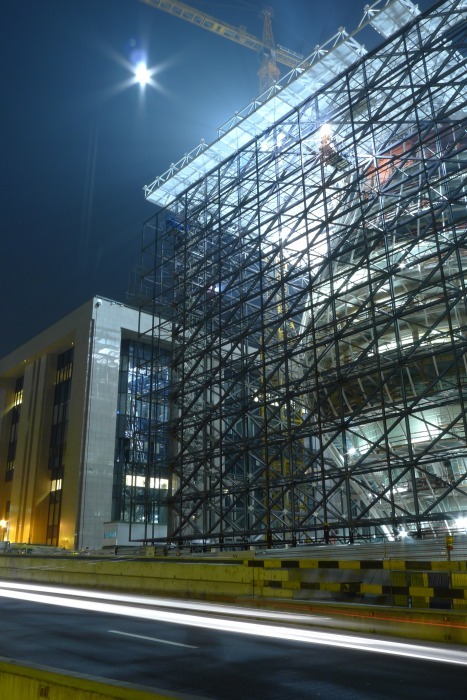 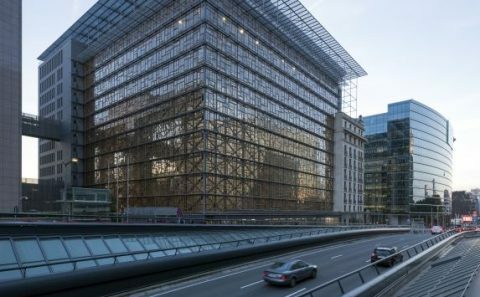 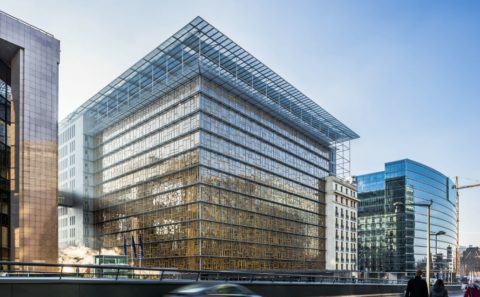 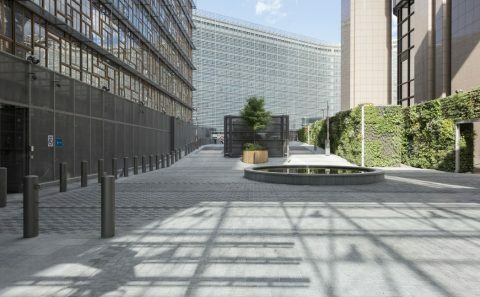 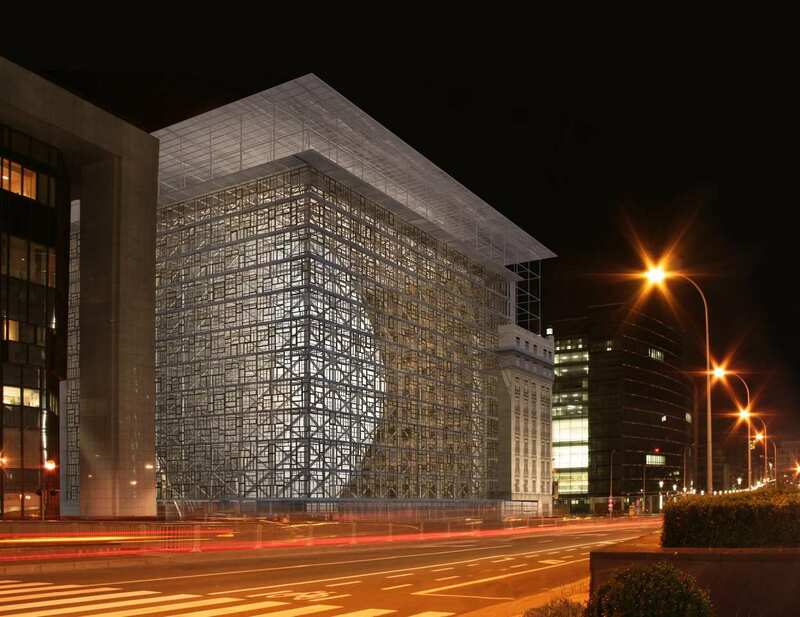 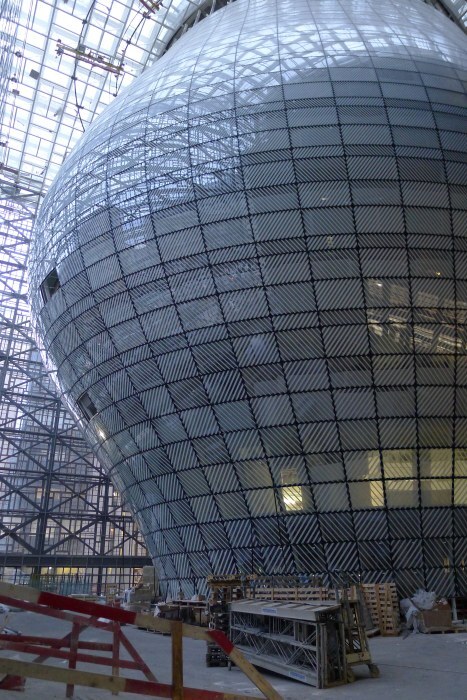 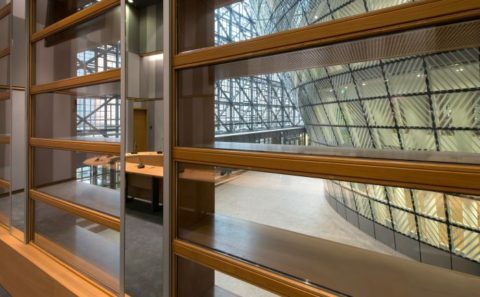 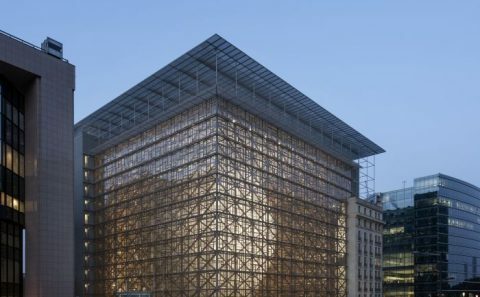 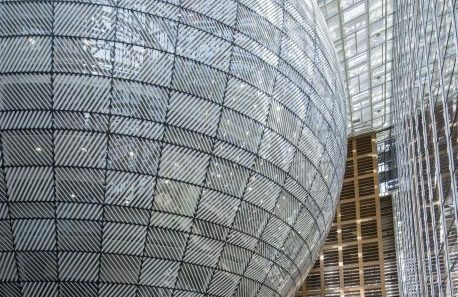 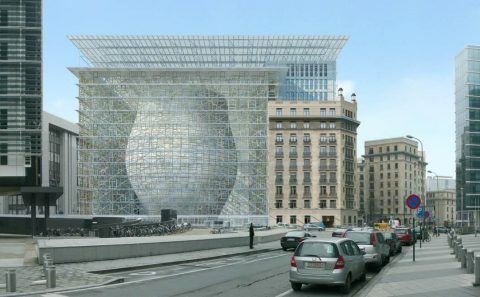 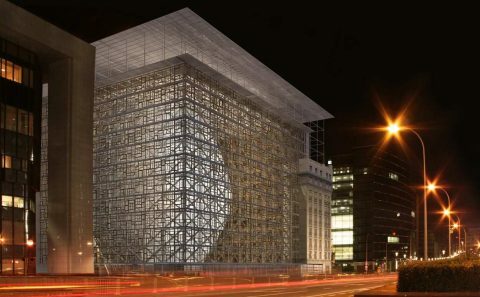 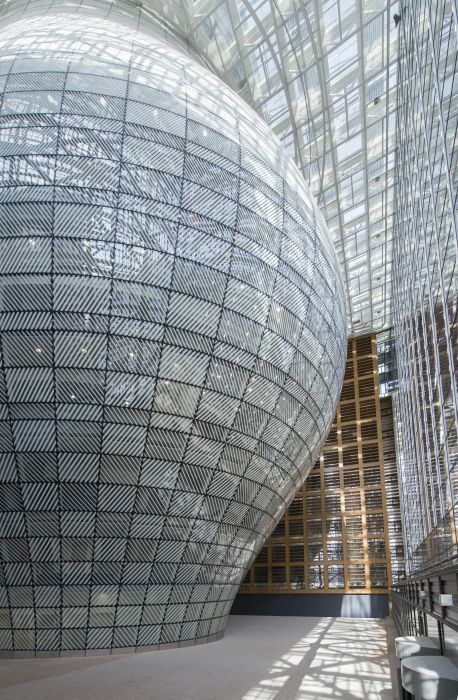 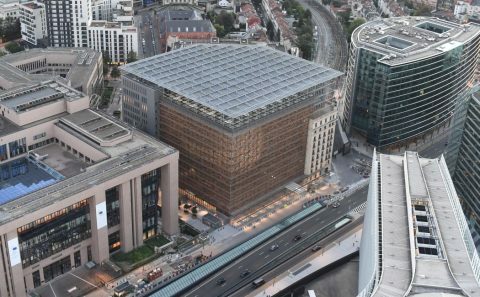 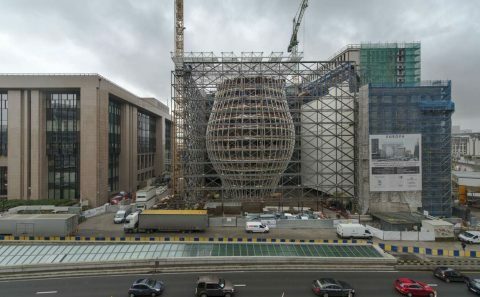 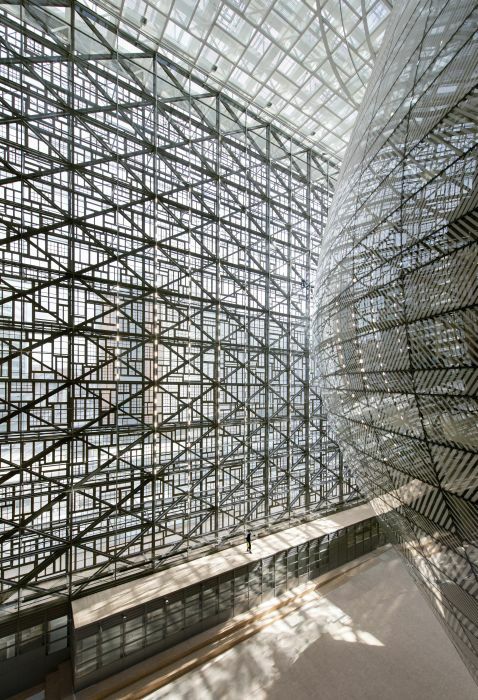 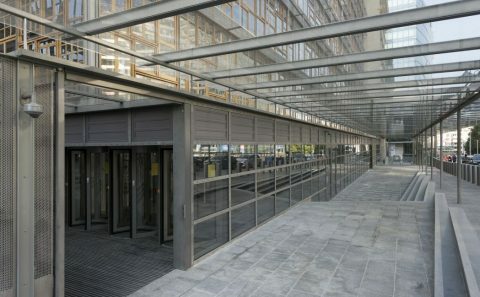 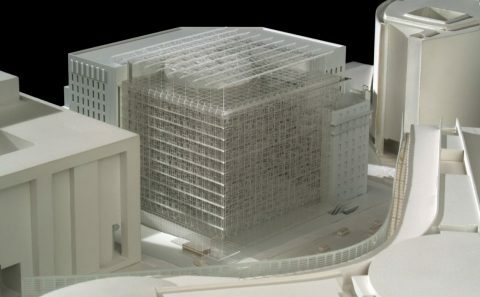 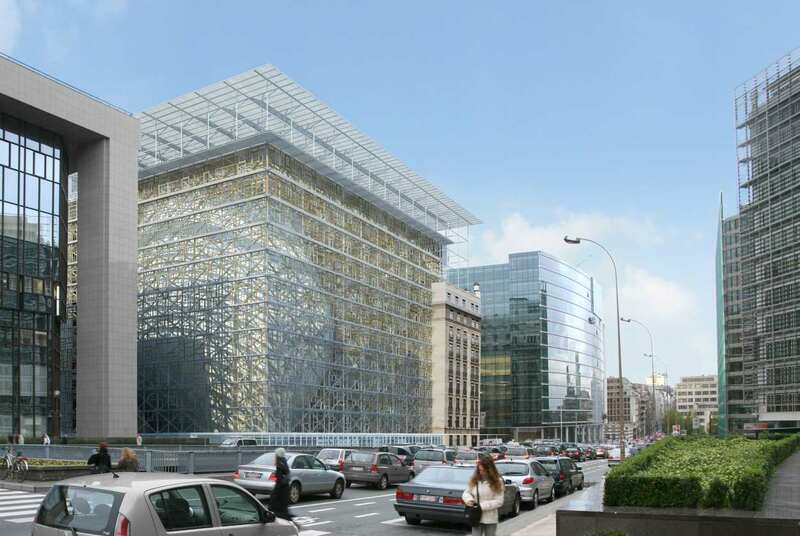 As a consequence of 2004 European enlargement, the Justus Lipsius building becomes too small for the EU Council1 (hereafter named the Council). 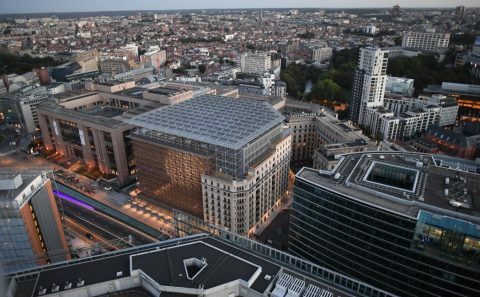 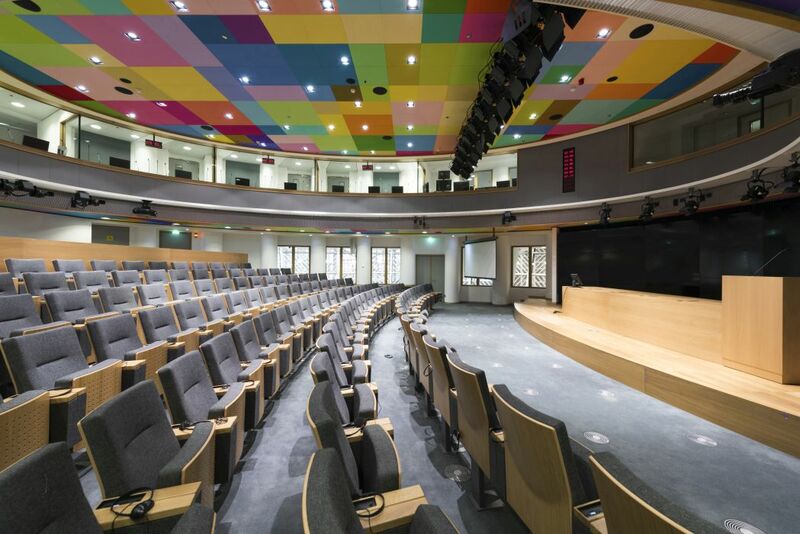 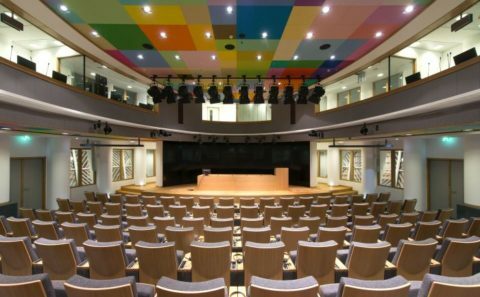 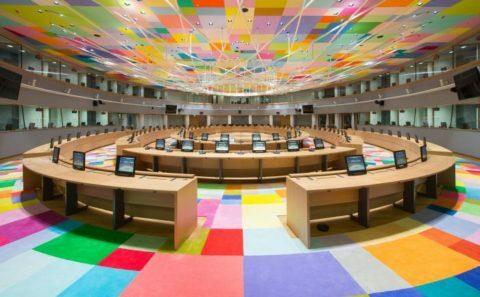 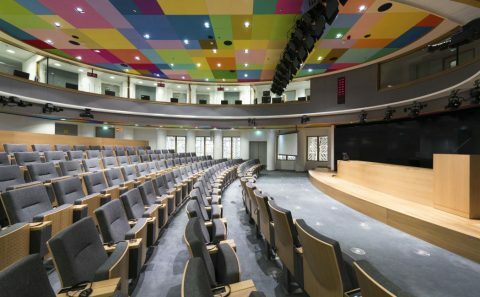 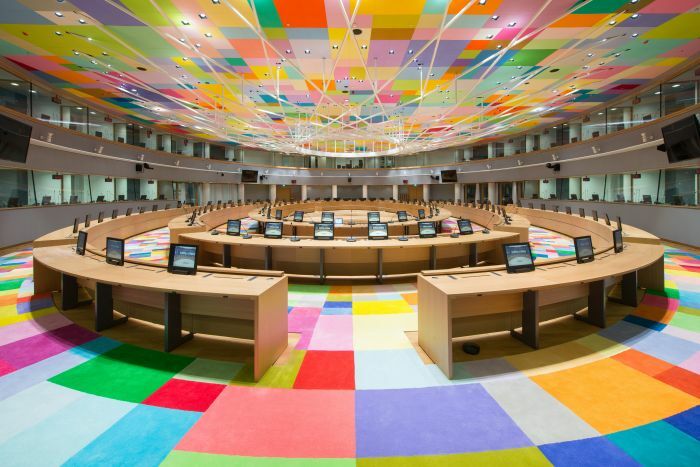 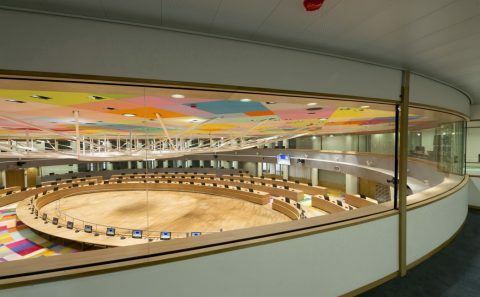 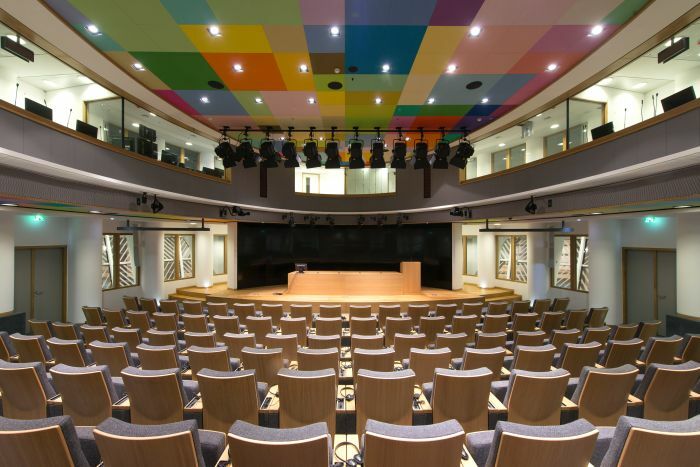 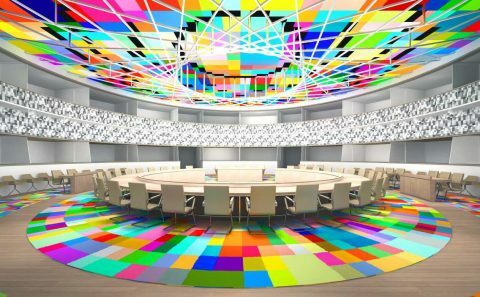 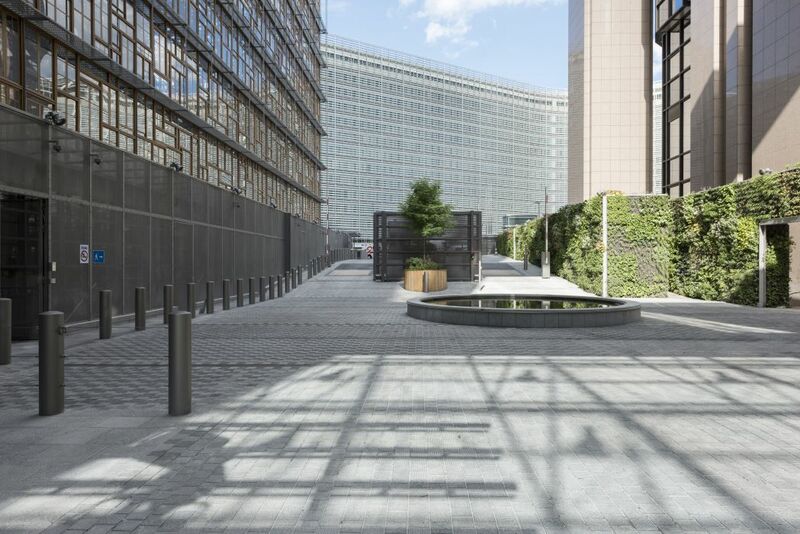 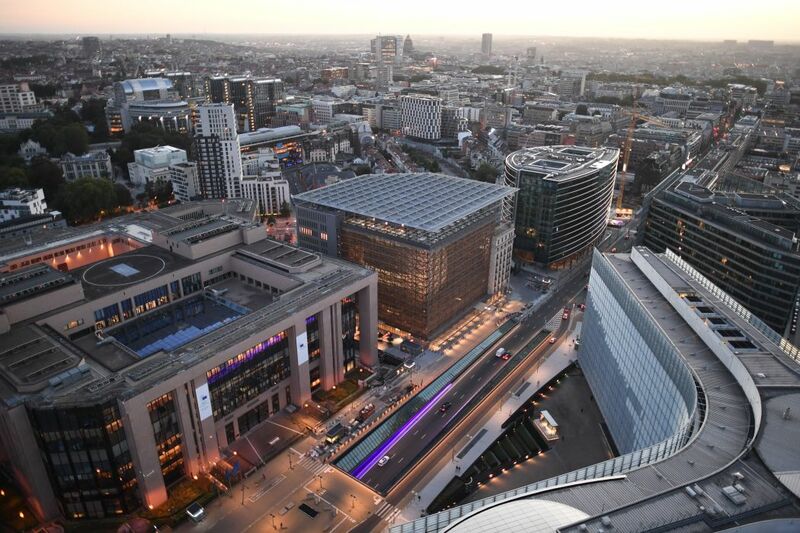 According to the treaty of Nice, adopted in 2001, all European Council2 sessions are held in Brussels, which also generates new real estate needs. 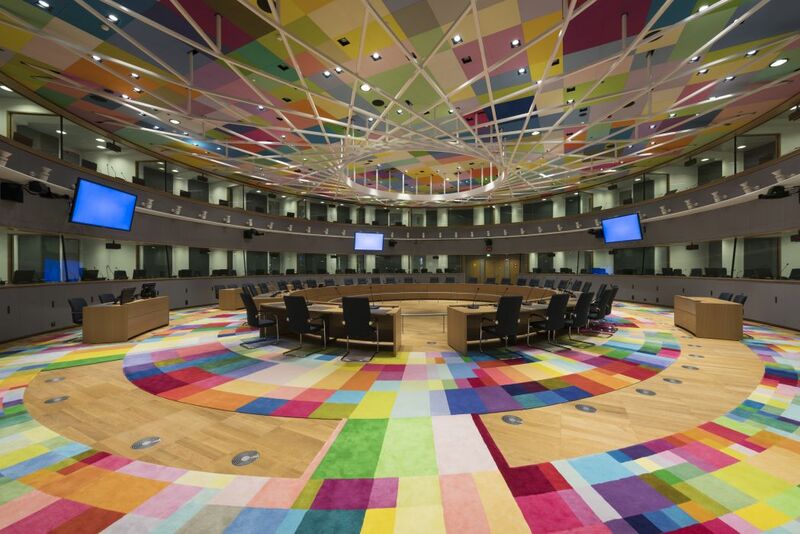 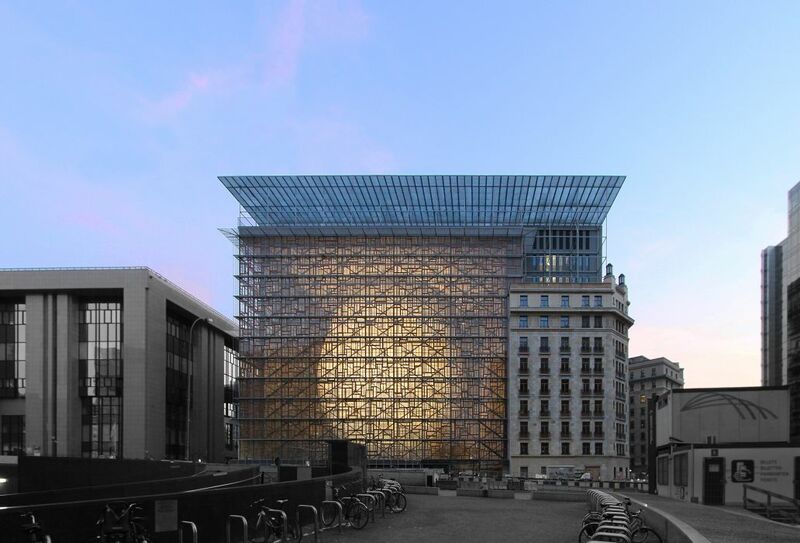 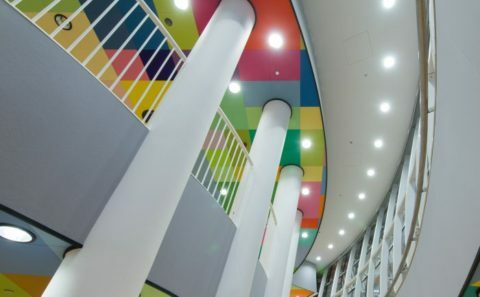 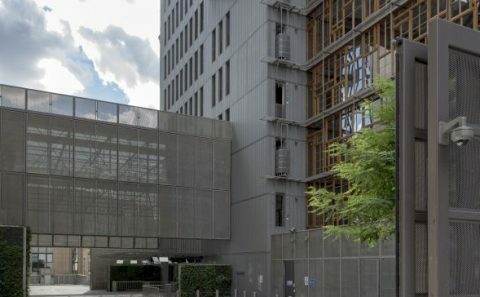 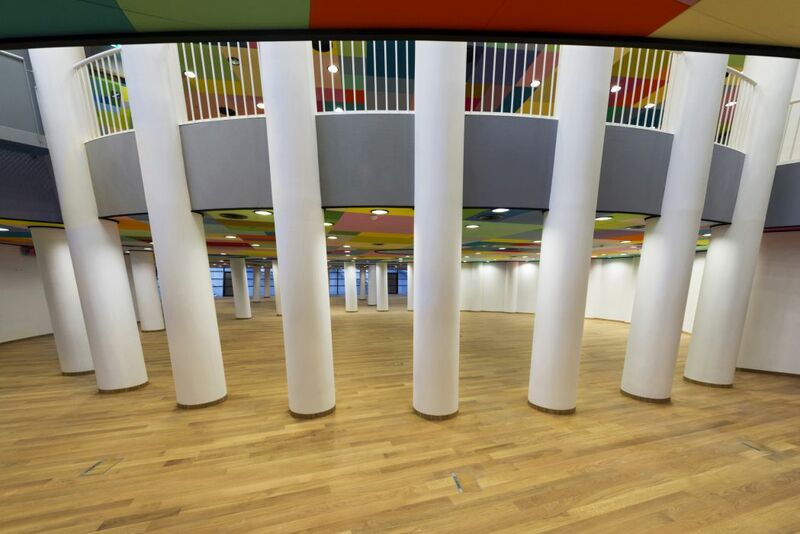 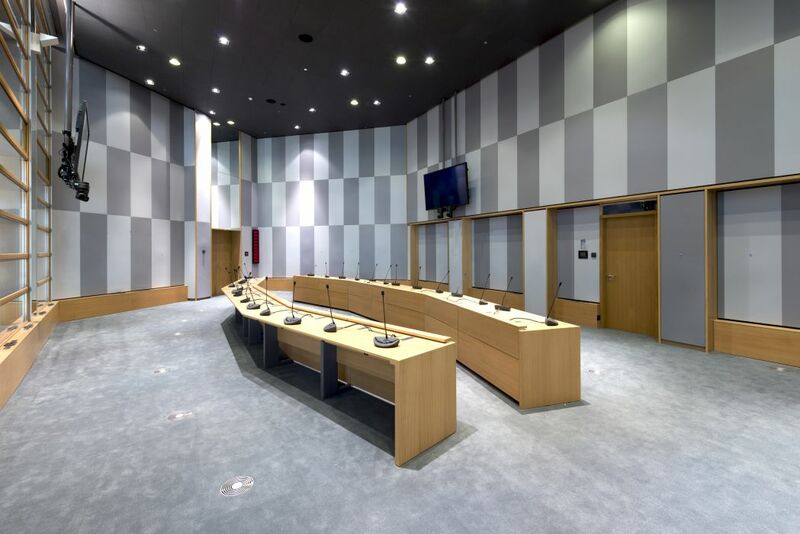 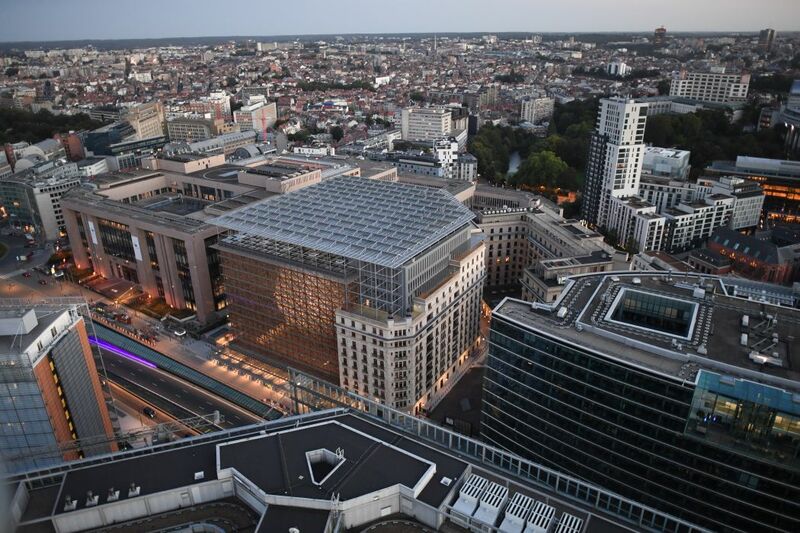 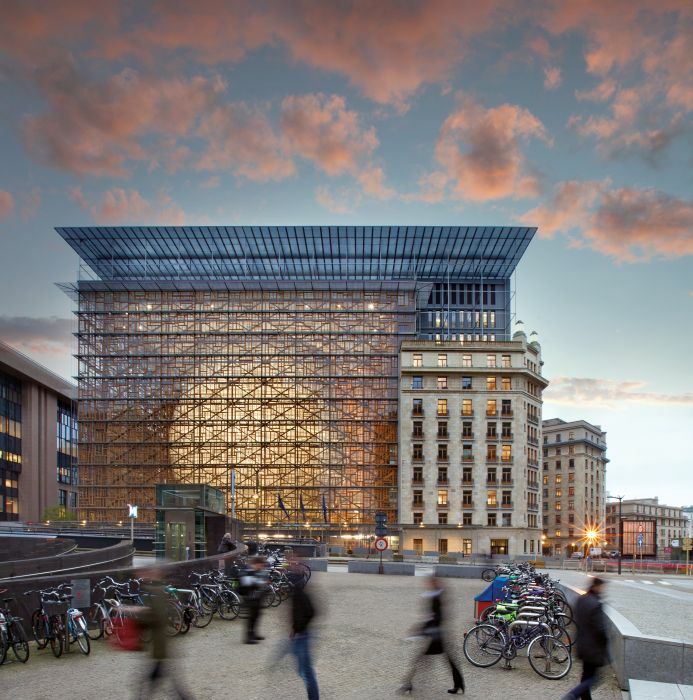 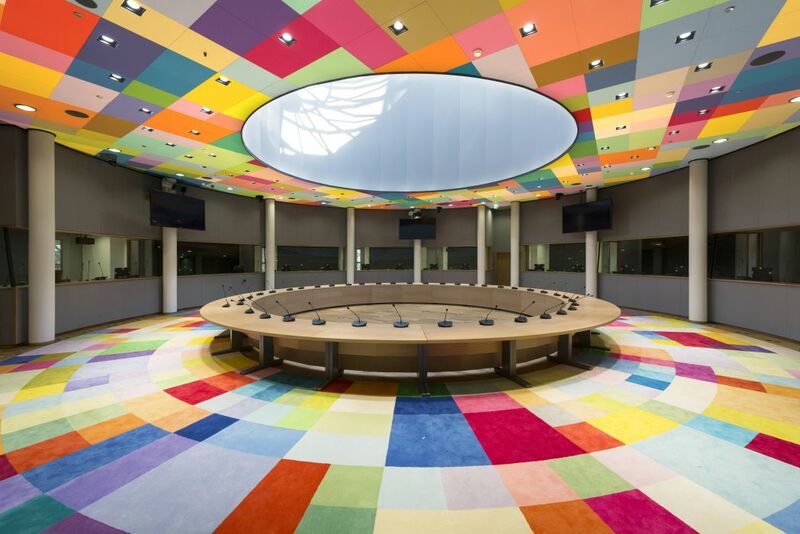 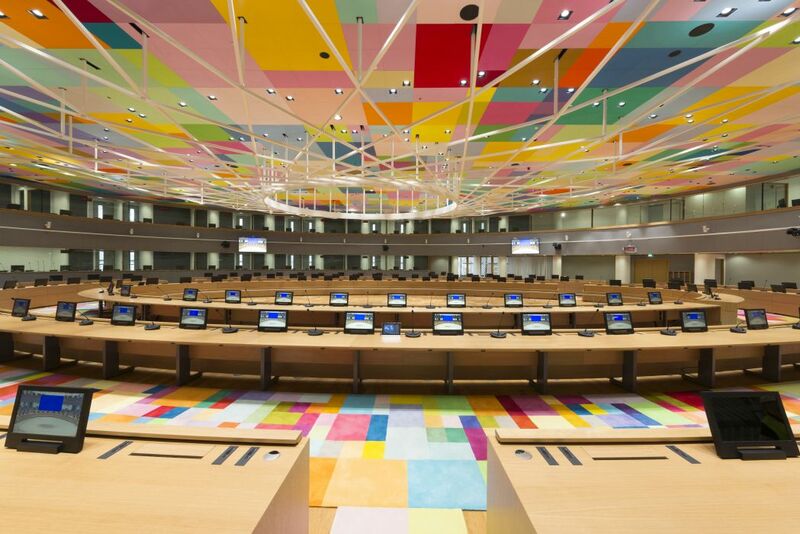 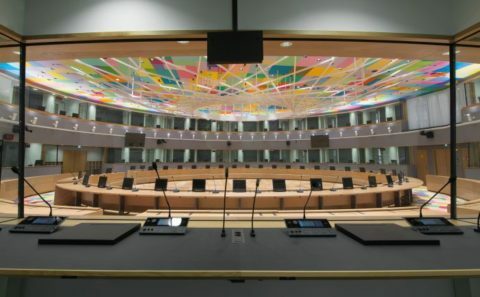 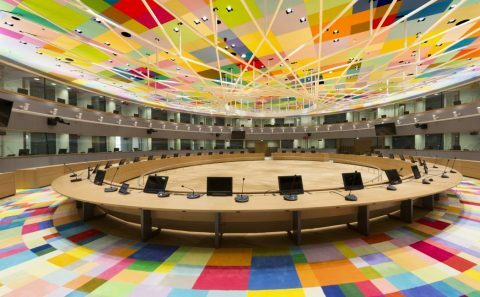 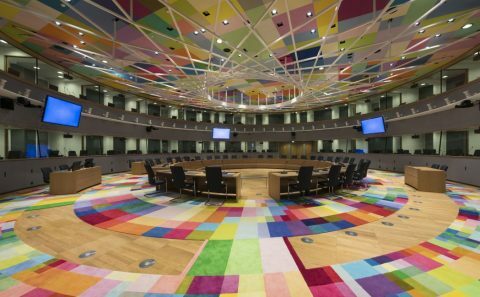 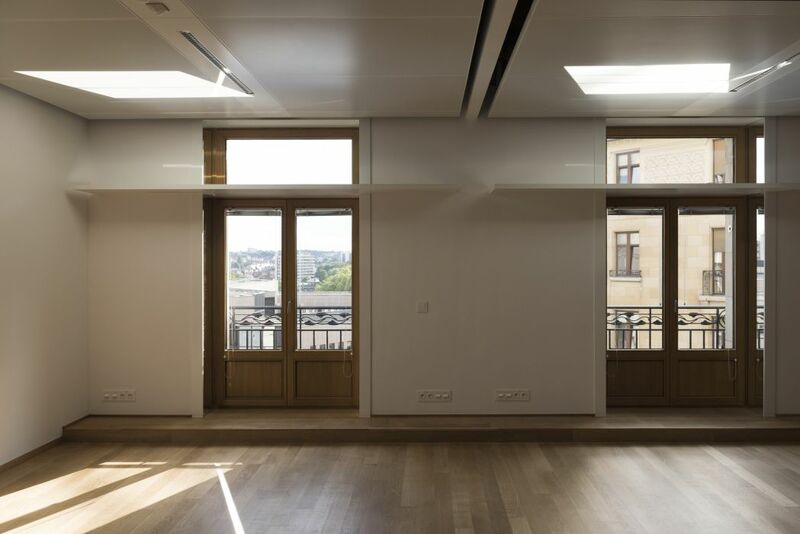 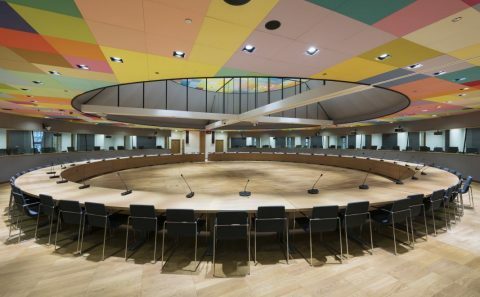 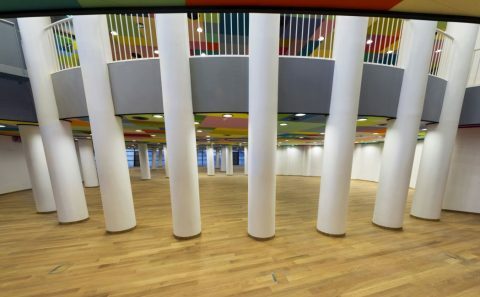 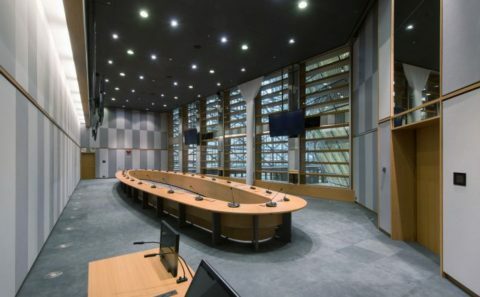 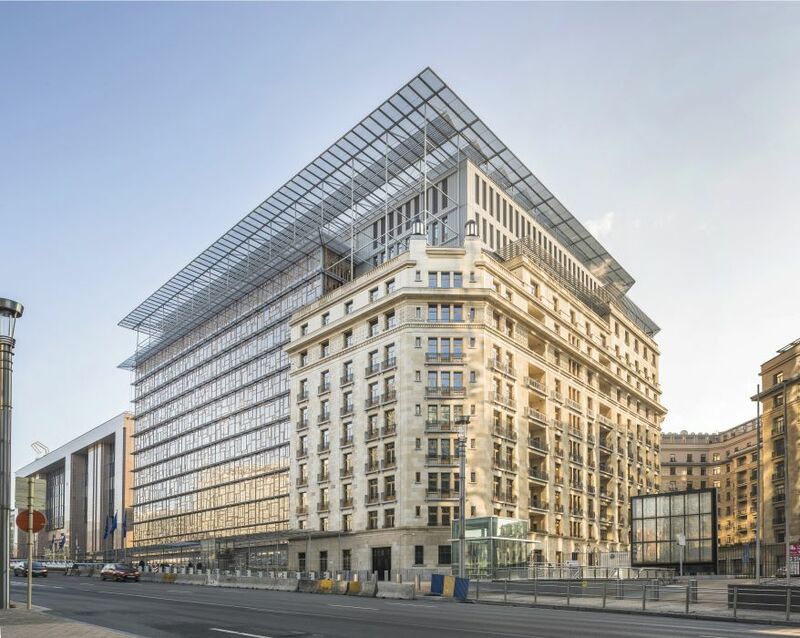 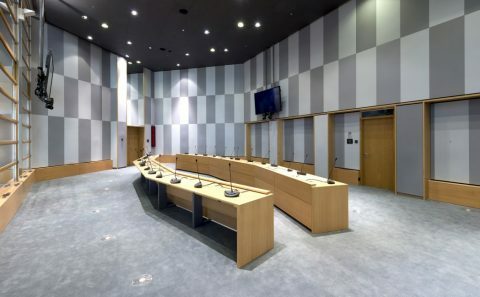 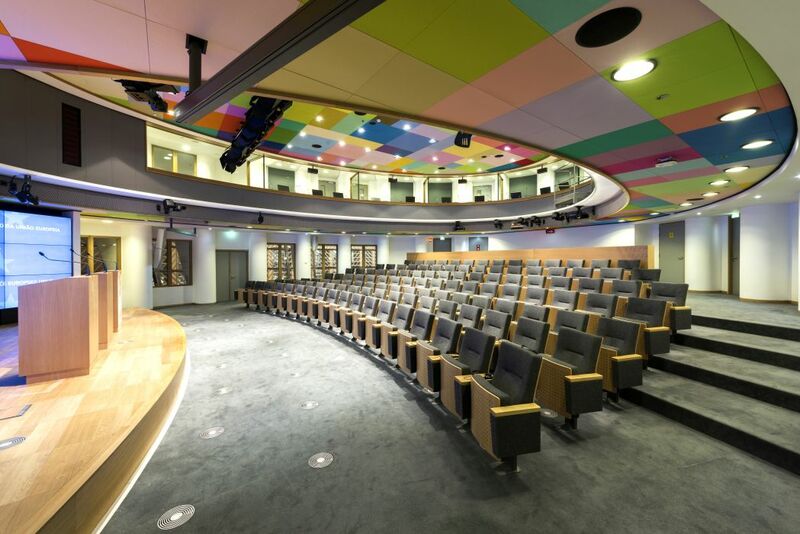 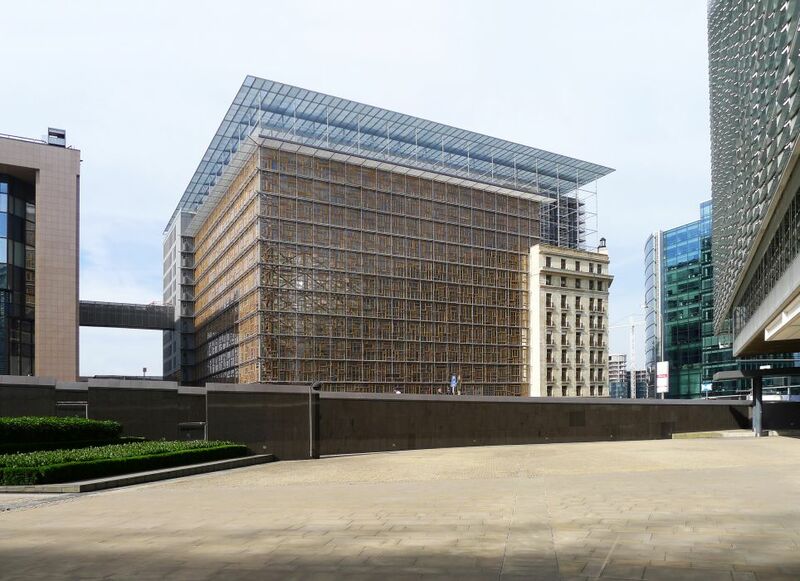 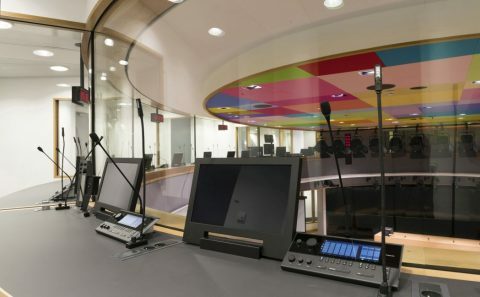 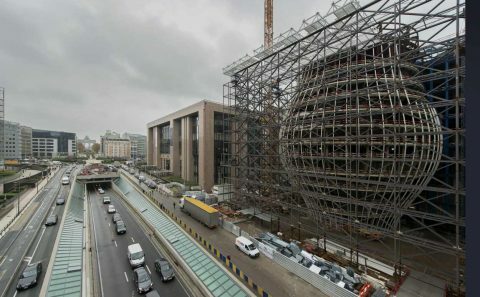 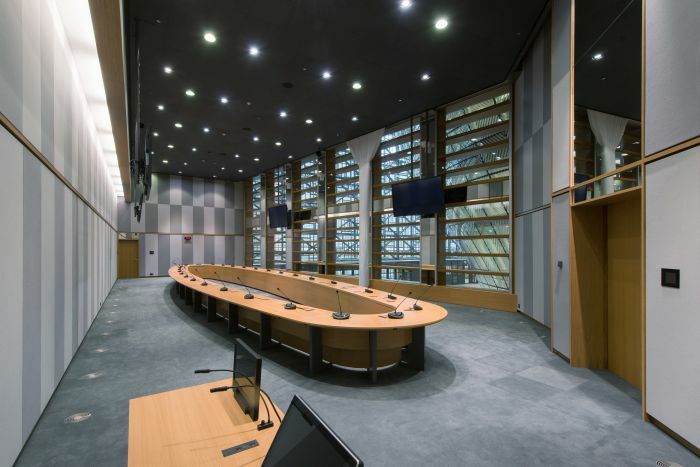 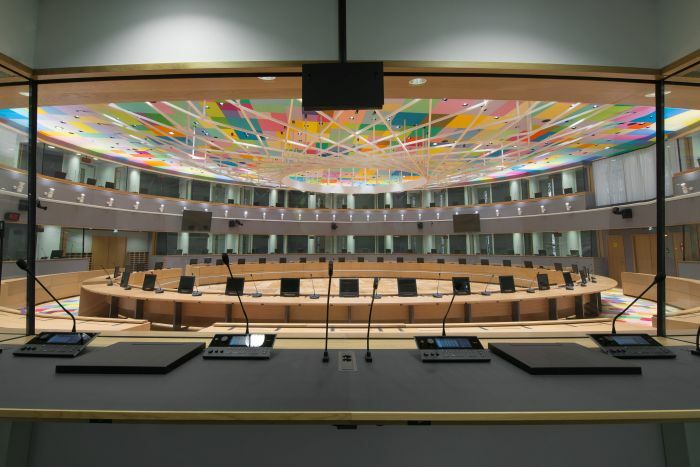 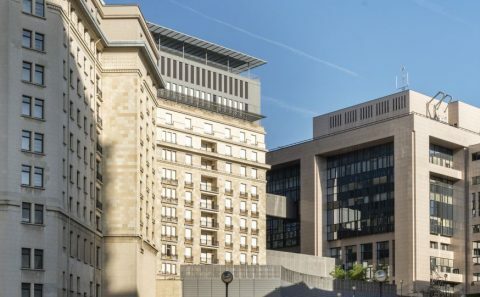 In order to respond to those, the Belgian State offered the Council to cede block A from the complex “Residence Palace” to make it the future seat of both the European Council and the Council, once this building renovated and adapted to its future owners’ needs. 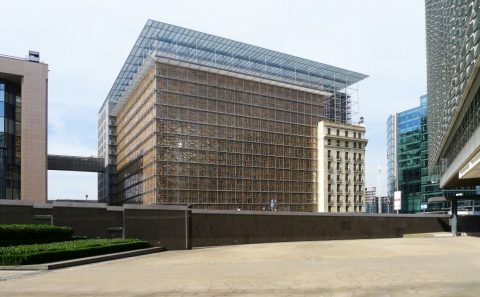 In other words, the Residence Palace needs to be reorganized to accommodate European Council’s quarterly sessions and EU Council’s bi-weekly ones, as well as other important conferences. 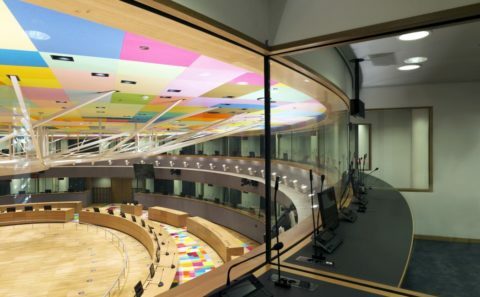 It must also include rooms for the Presidency and other high level leaders, rooms for Member States delegates and the General Secretary of the Council, as well as international press representatives. 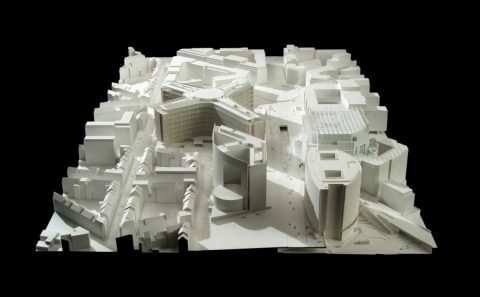 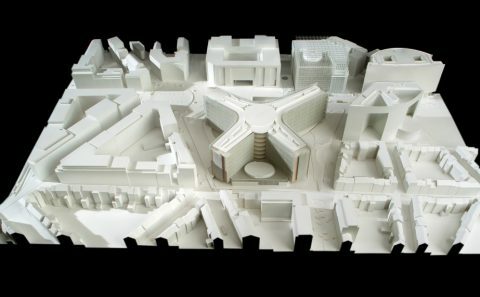 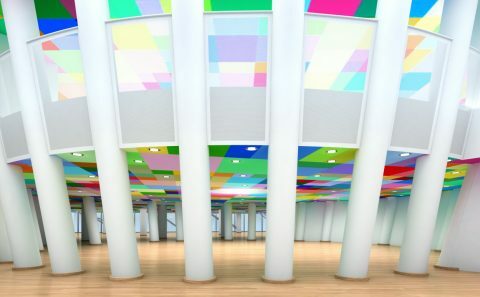 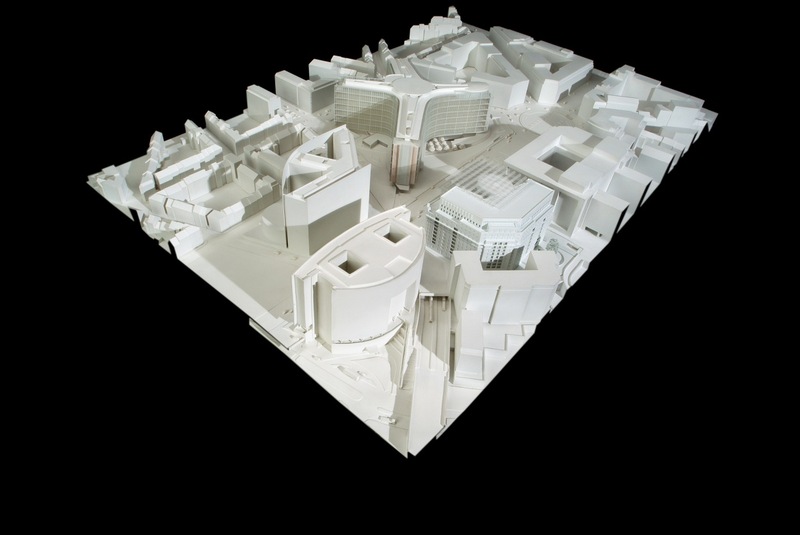 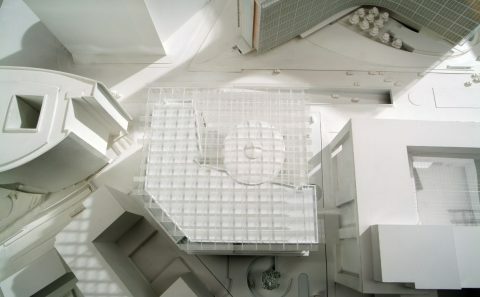 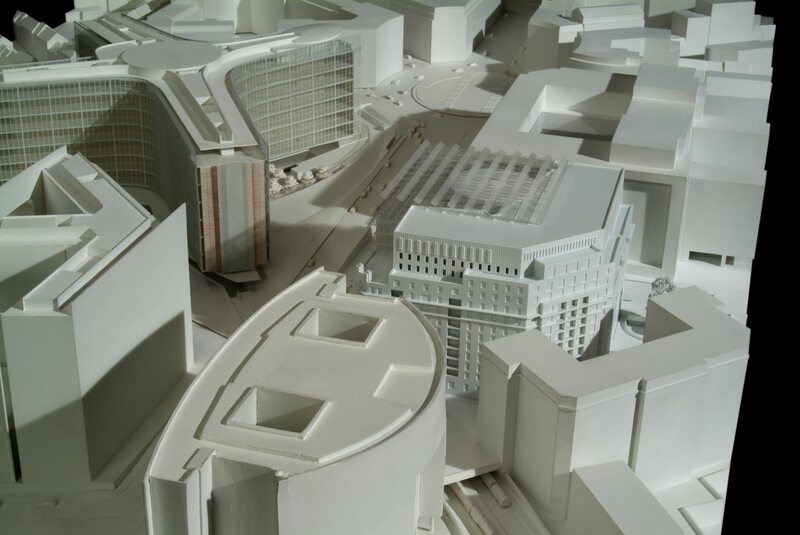 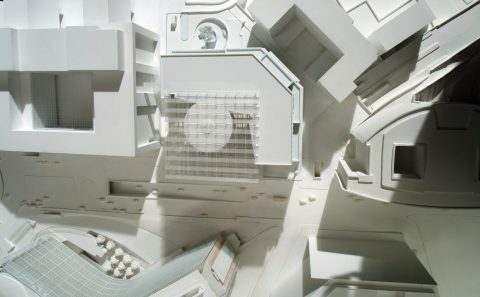 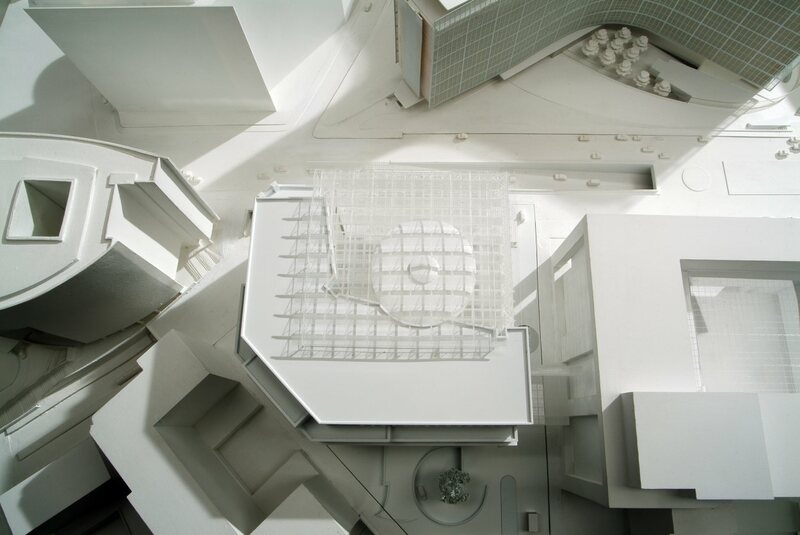 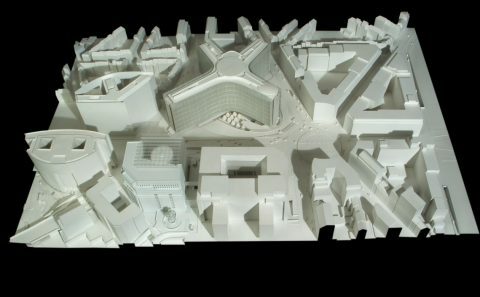 In this perspective, the Council launches in August 2004 a European architecture and project competition and selects, in January 2005, 25 teams of designers in cooperation with the Belgian Buildings Agency. 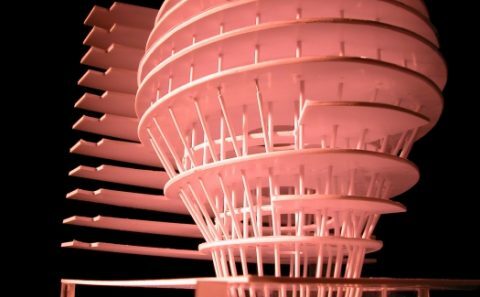 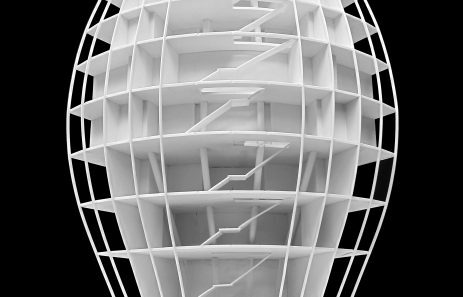 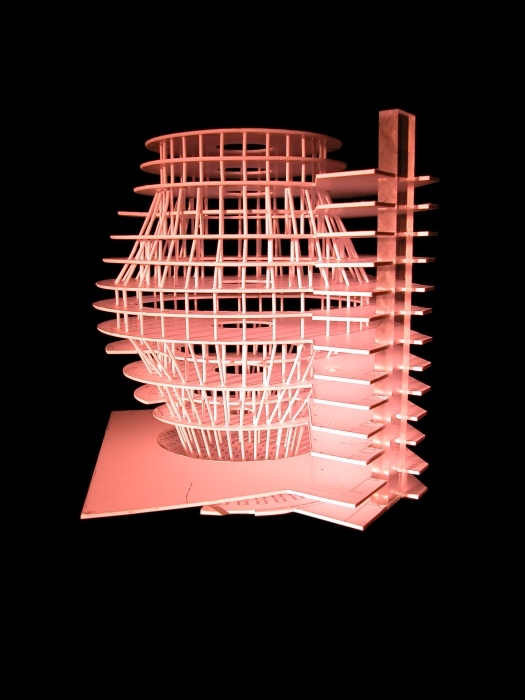 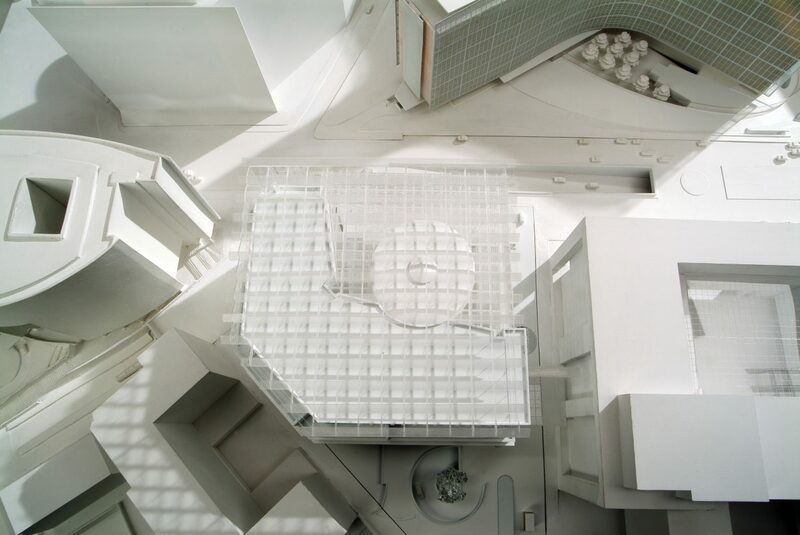 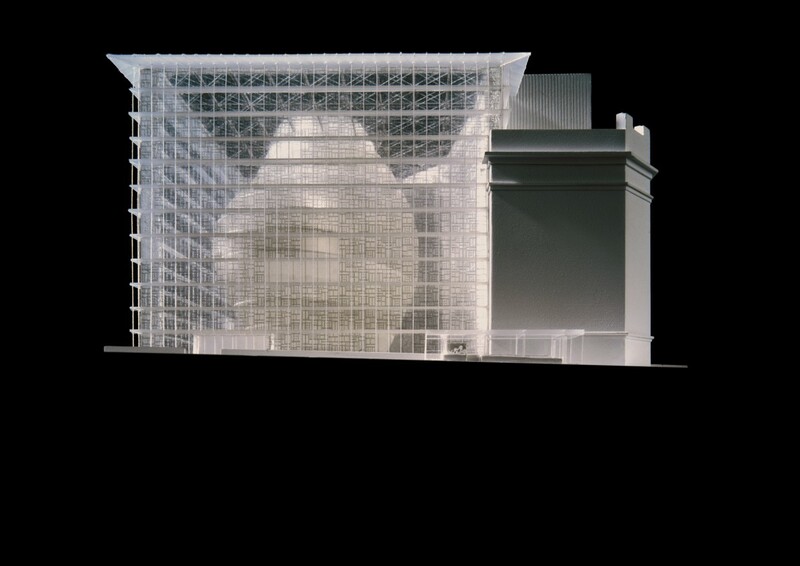 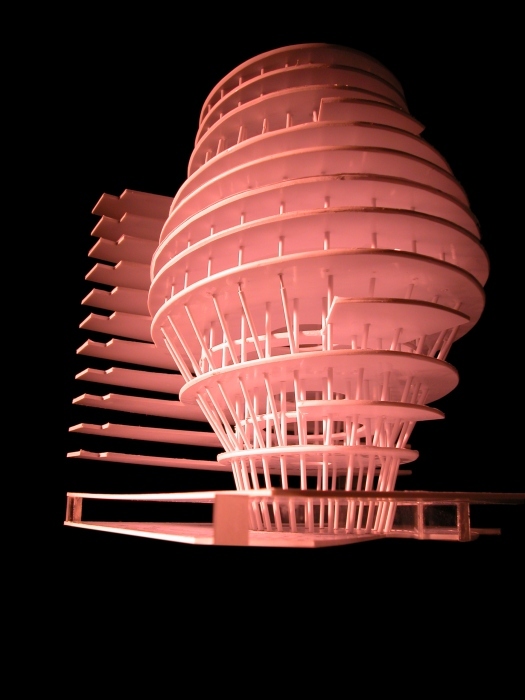 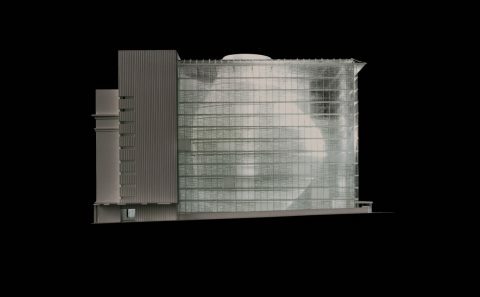 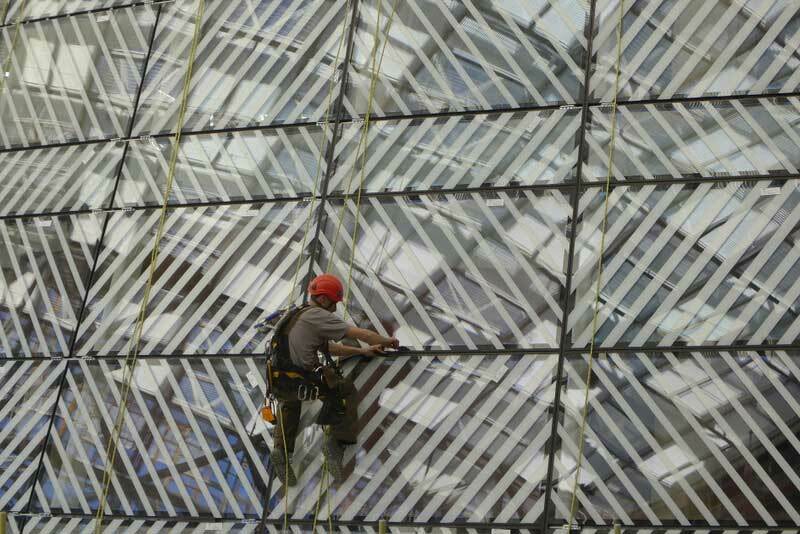 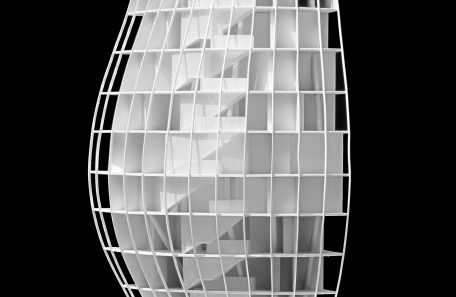 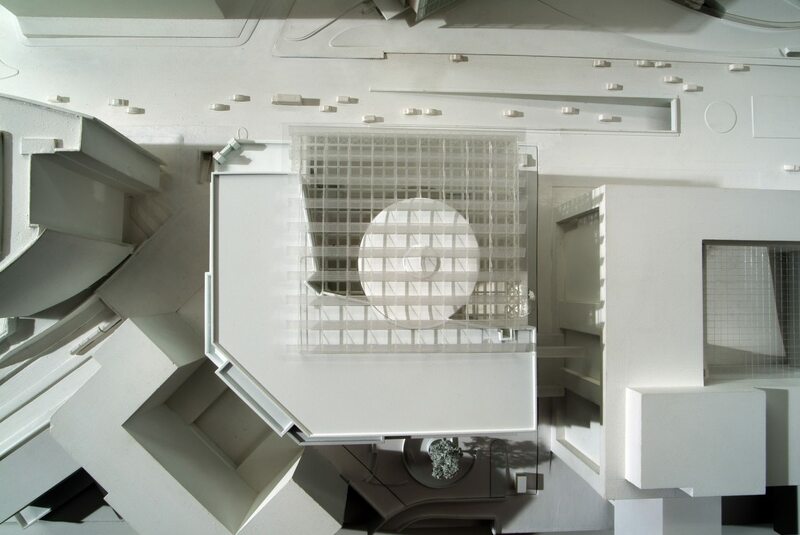 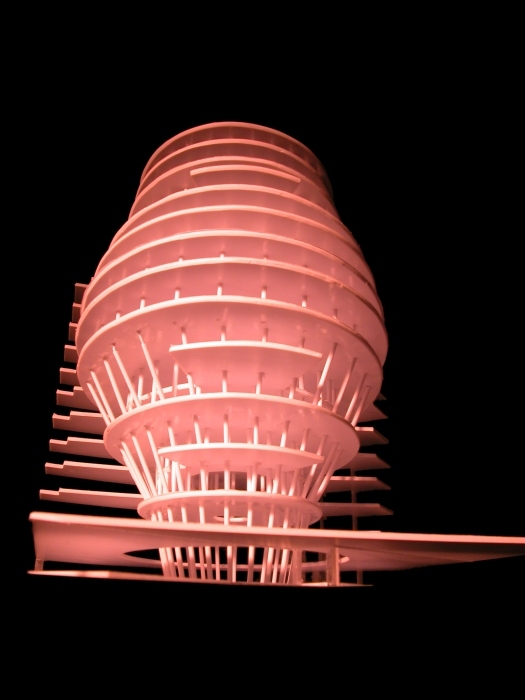 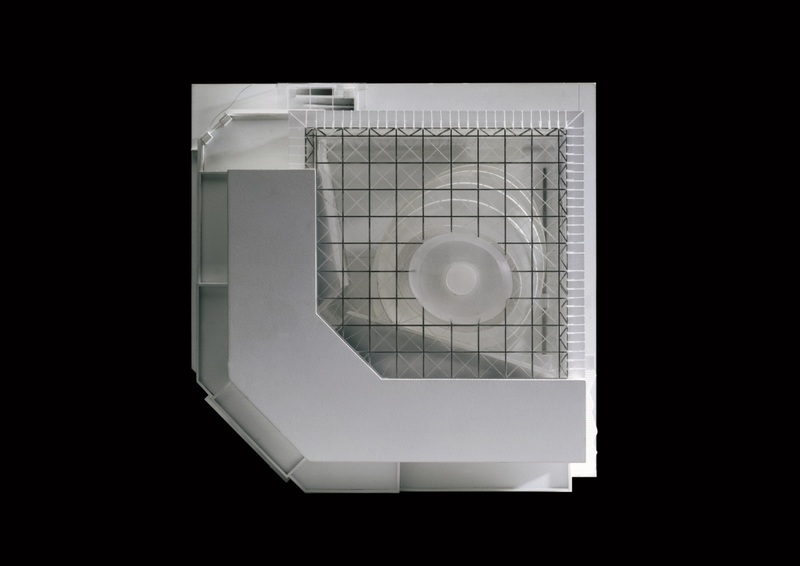 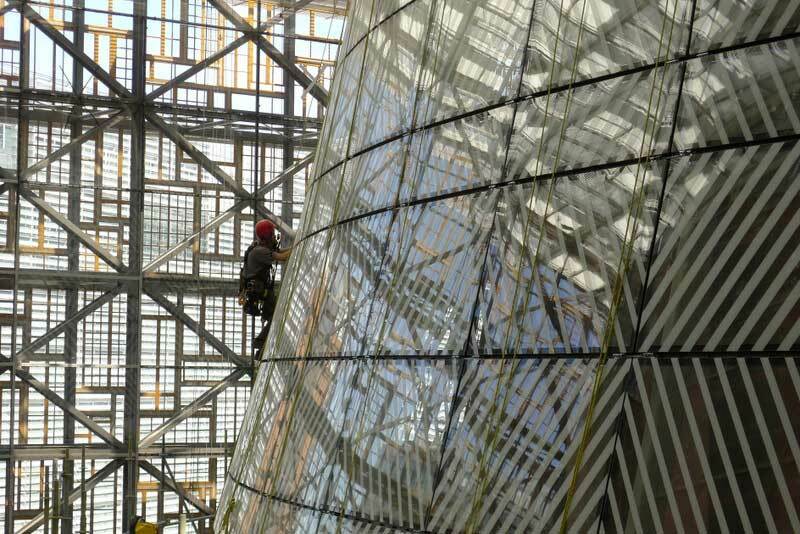 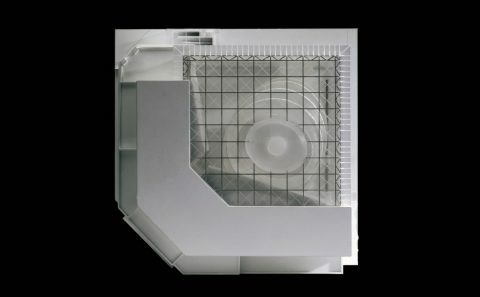 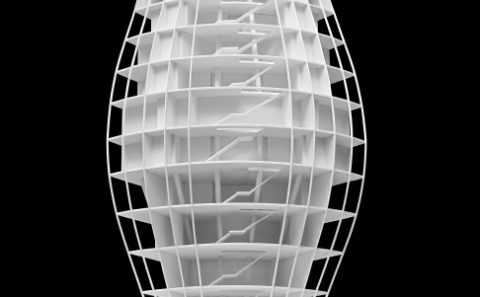 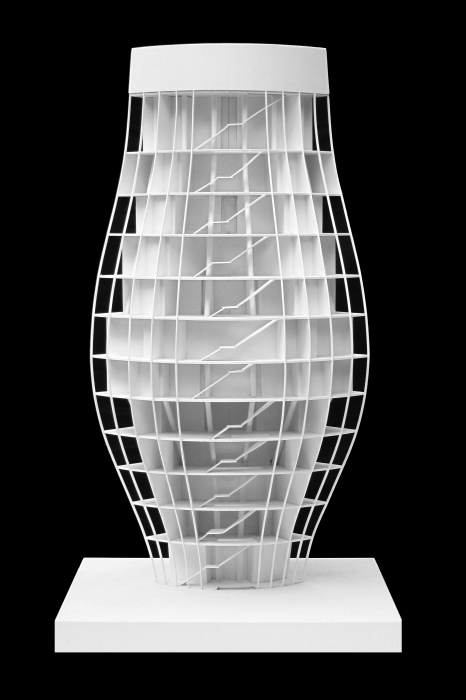 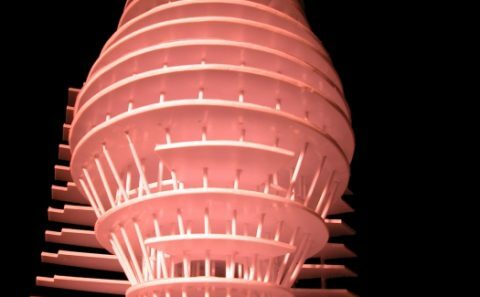 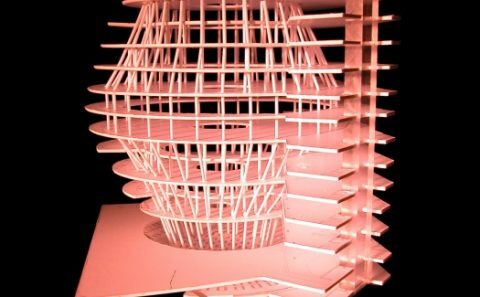 On September 2nd 2005, the team of architects and engineers composed of Philippe SAMYN and PARTNERS (Lead and Design Partner), with STUDIO VALLE PROGETTAZIONI and BURO HAPPOLD is designated laureate of a 6 competitors final that takes place from June to September 2005. 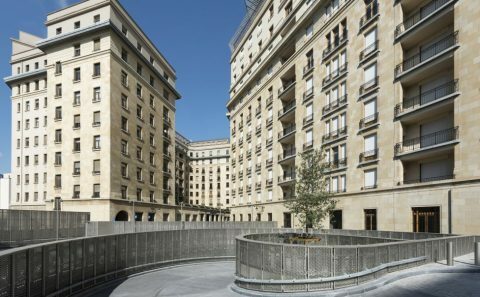 The Residence Palace was built between 1922 and 1927 at the initiative of the financier Lucien Kasin and designed by the Swiss architect Michel Polak. 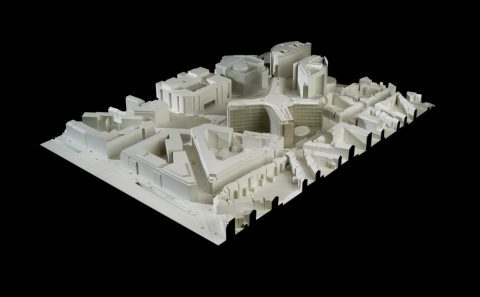 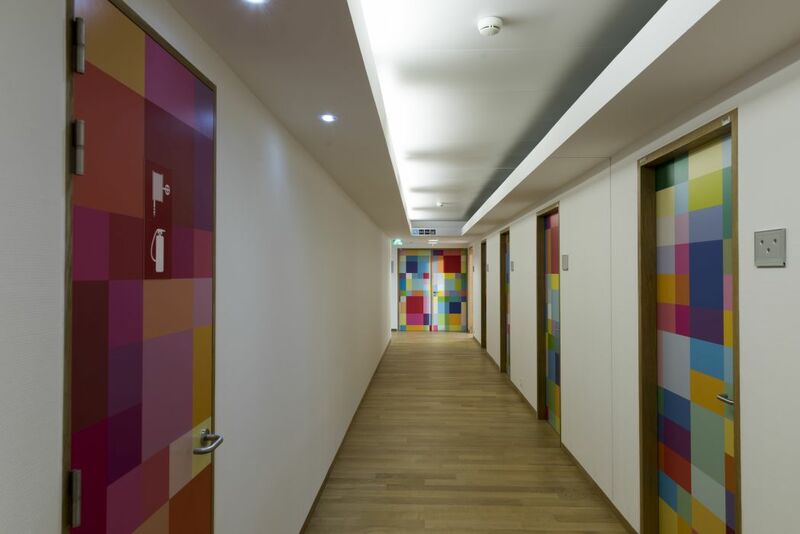 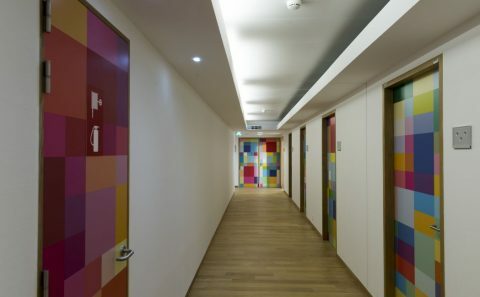 The complex is a collective housing experiment under the form of luxurious service flats located next to the city centre. 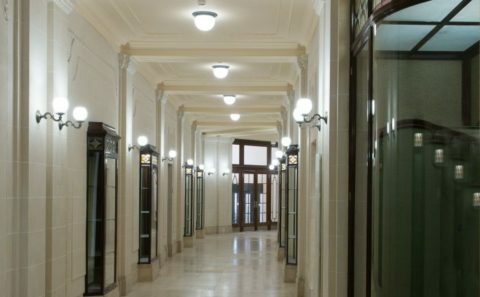 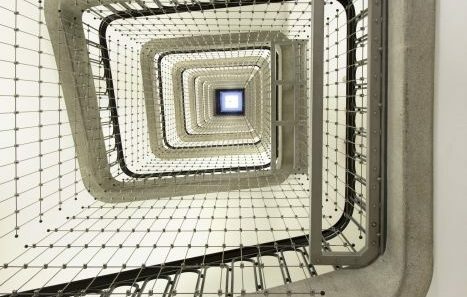 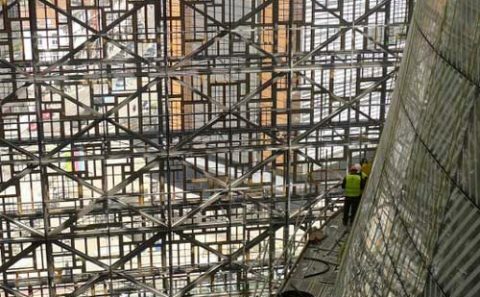 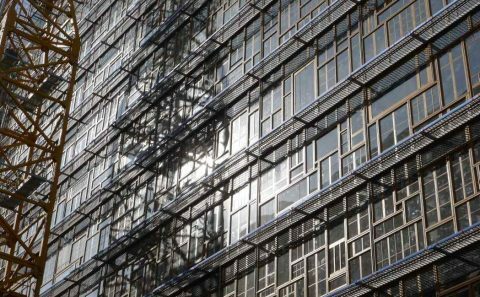 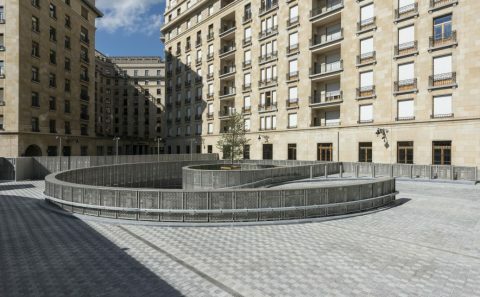 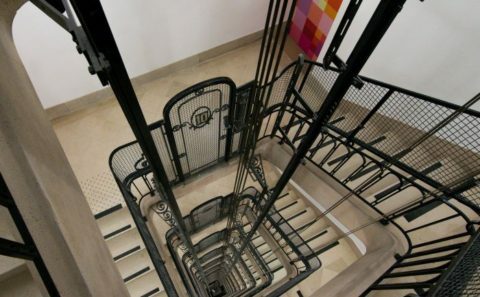 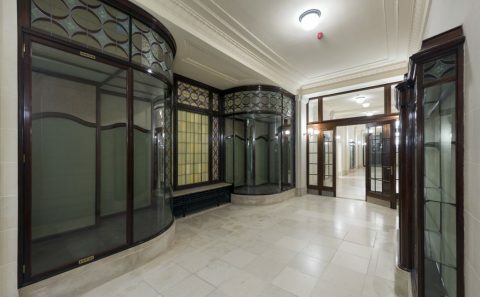 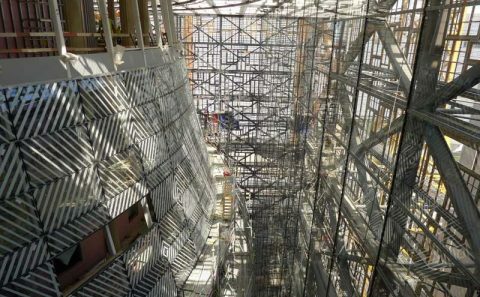 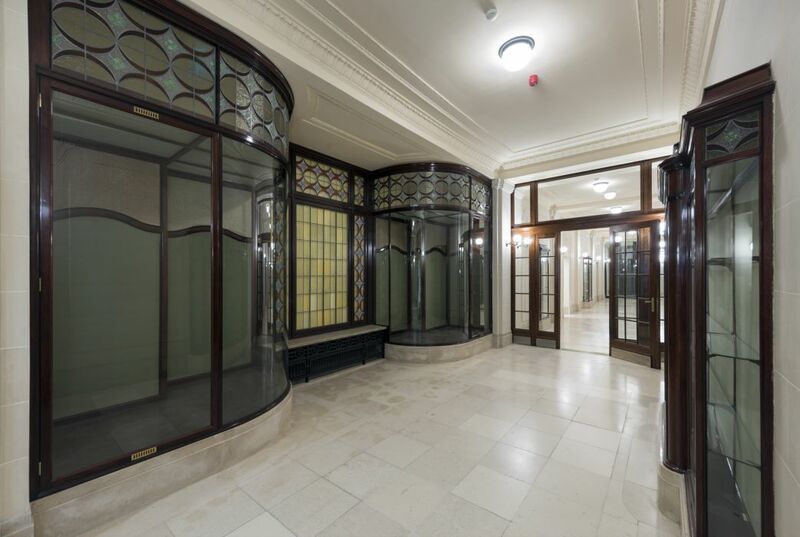 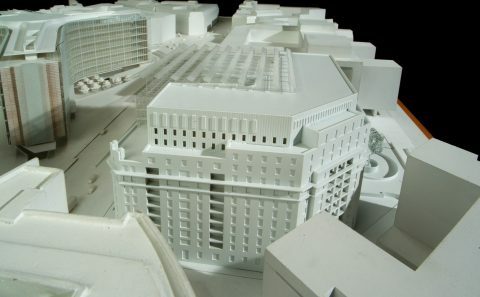 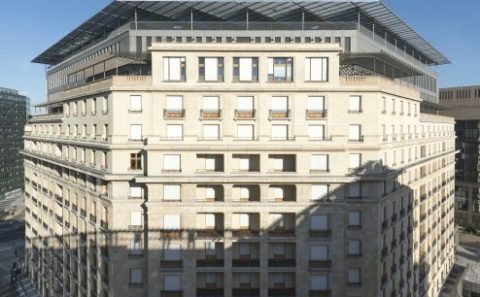 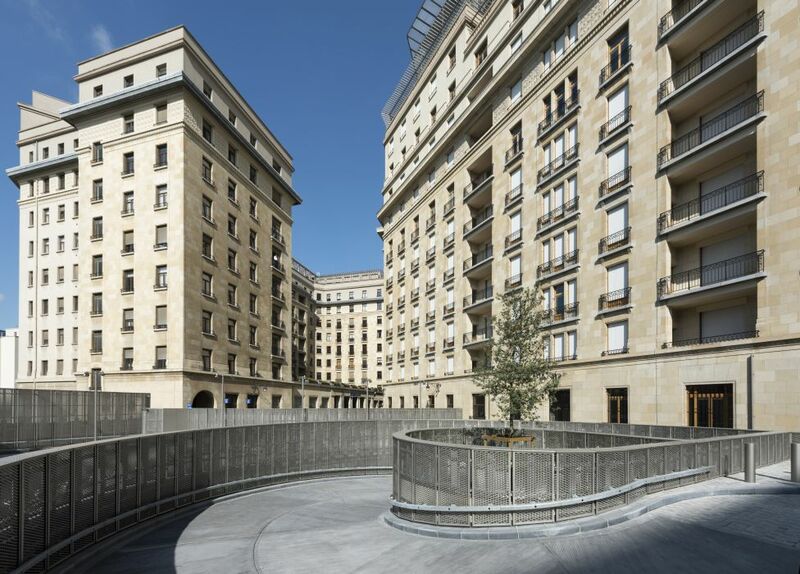 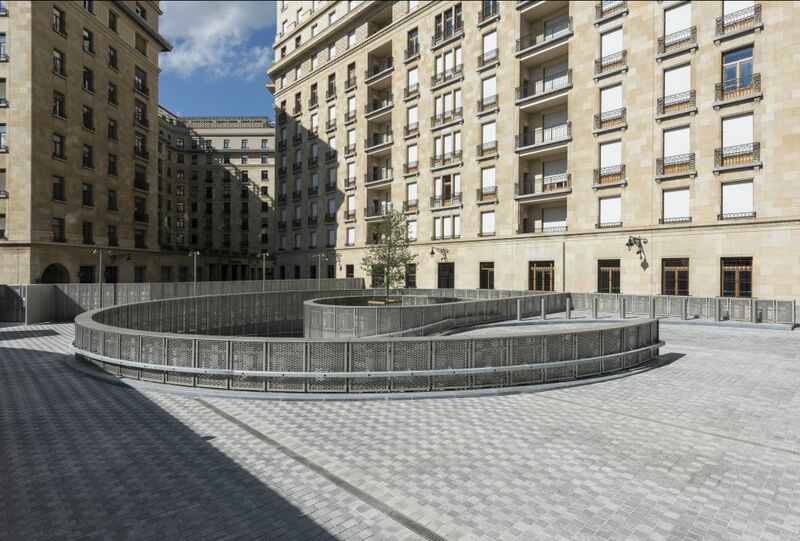 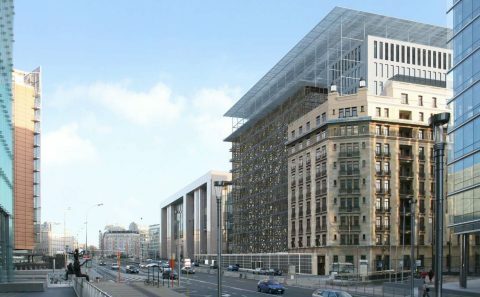 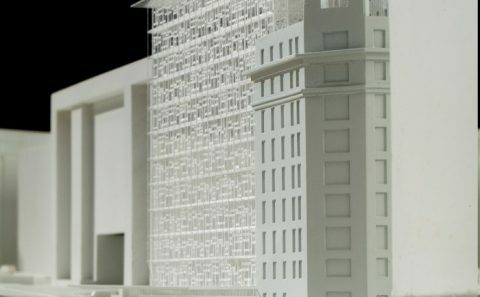 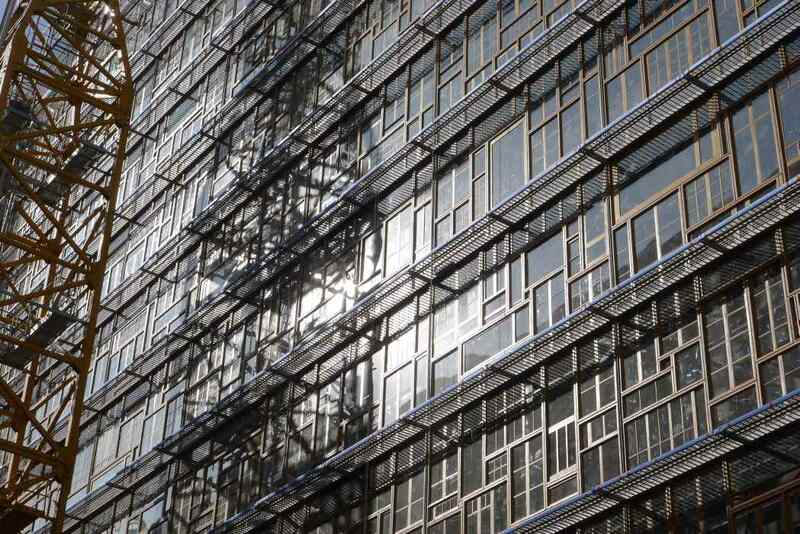 The project will only have a short commercial success and after World War II, the art deco building is converted into ministerial offices by the Belgian State. 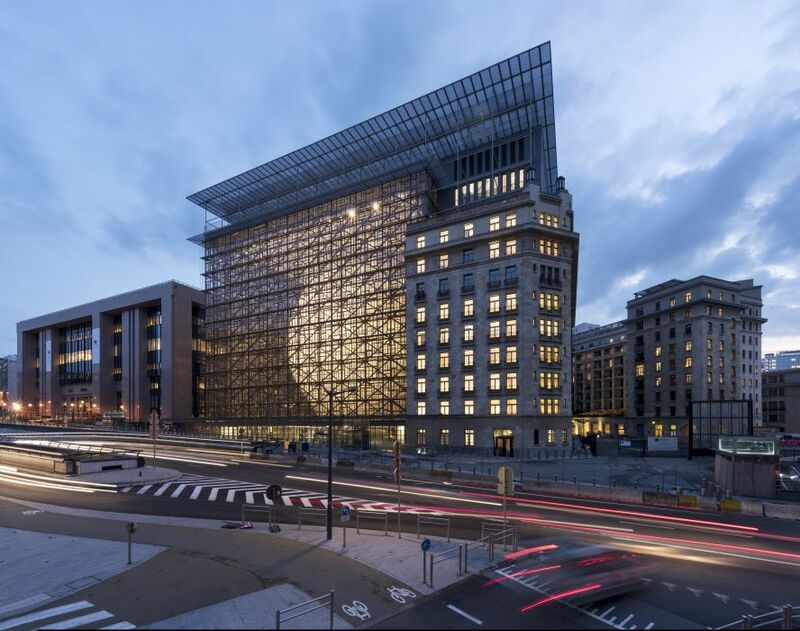 An extension with a new facade was built in the years ’60, behind the original building in front of the rue de la Loi – Wetstraat. 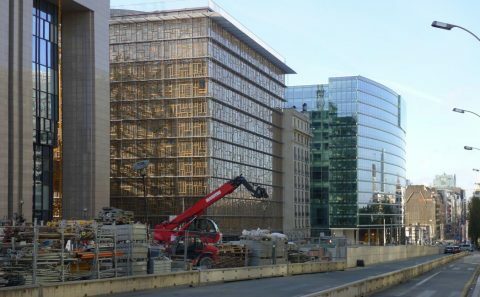 Later in the years ’80, the Eastern wing is demolished in order to erect the Justus Lipsius building, current seat of the Council. 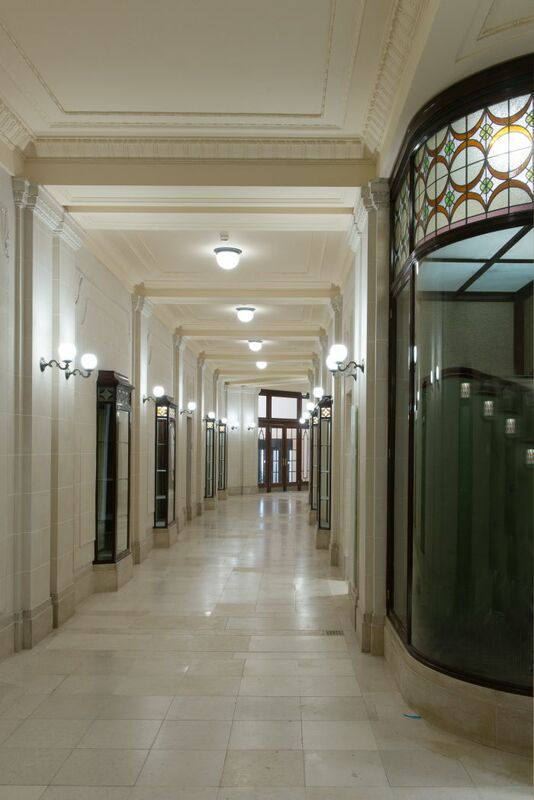 The original facades, as well as the entrance halls and the corridors on the ground floor are today listed as part of the Belgian cultural heritage. 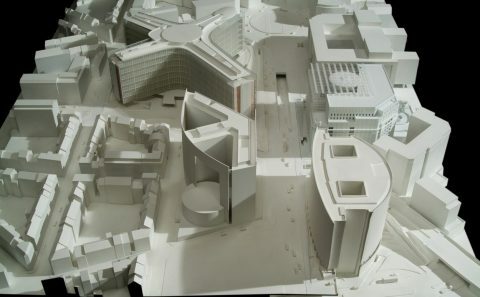 According to urban planning regulations, the building is extended on the North-East side by two new facades to transform its current “L” shape into a “cube”. 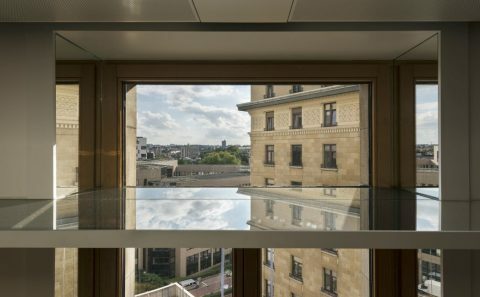 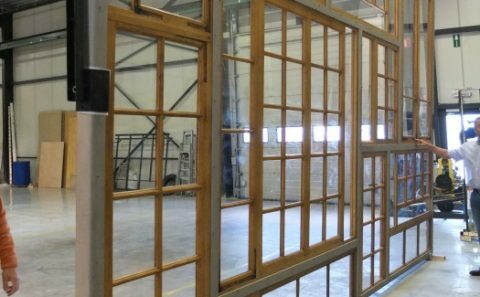 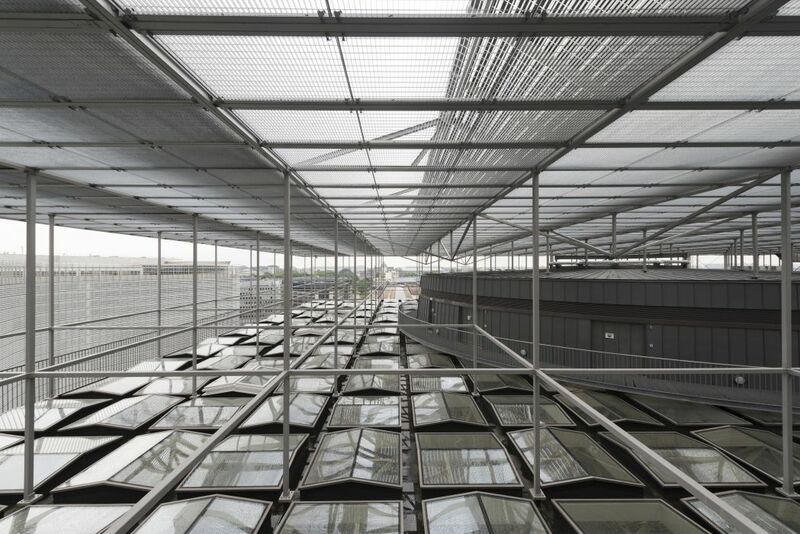 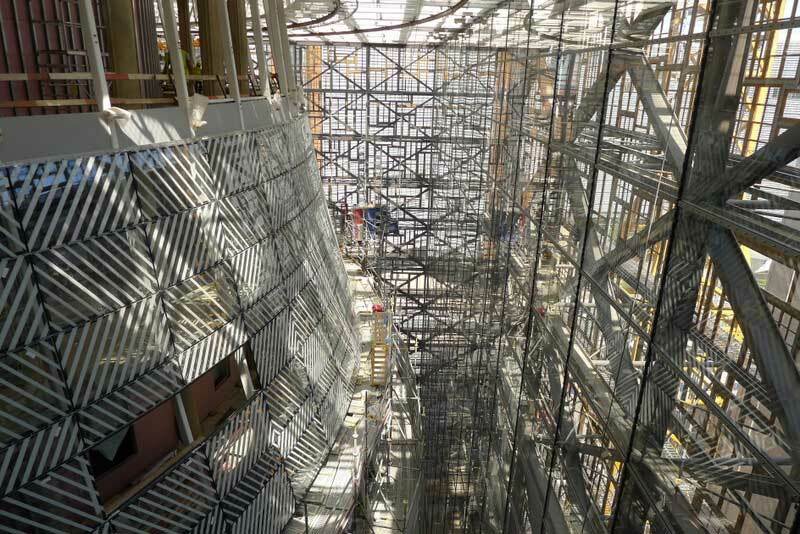 This outer area is converted into a glass atrium protecting from the urban dust. 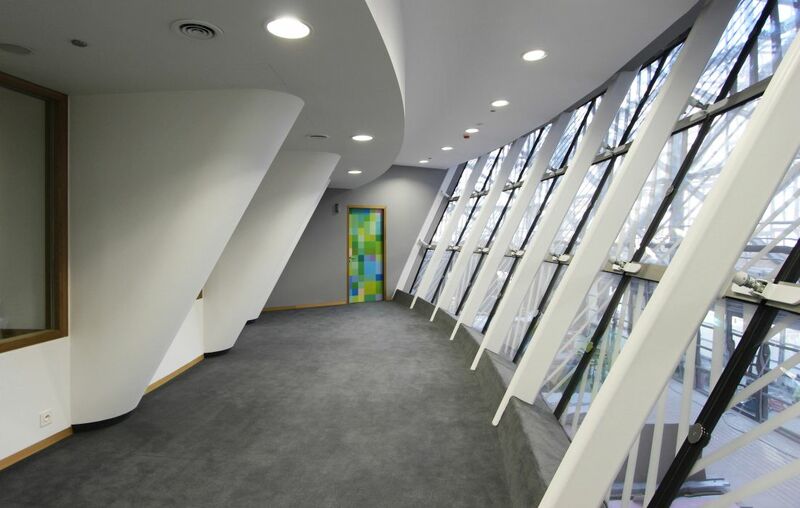 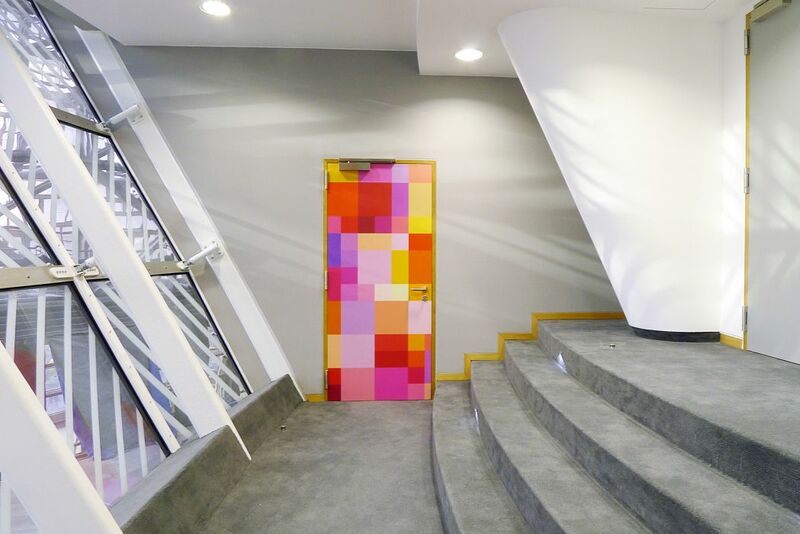 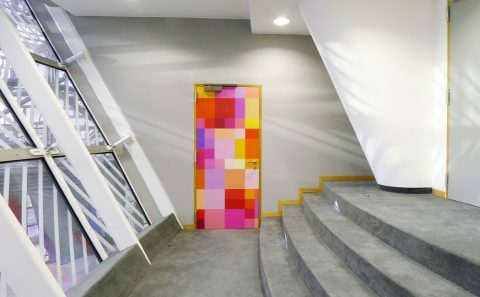 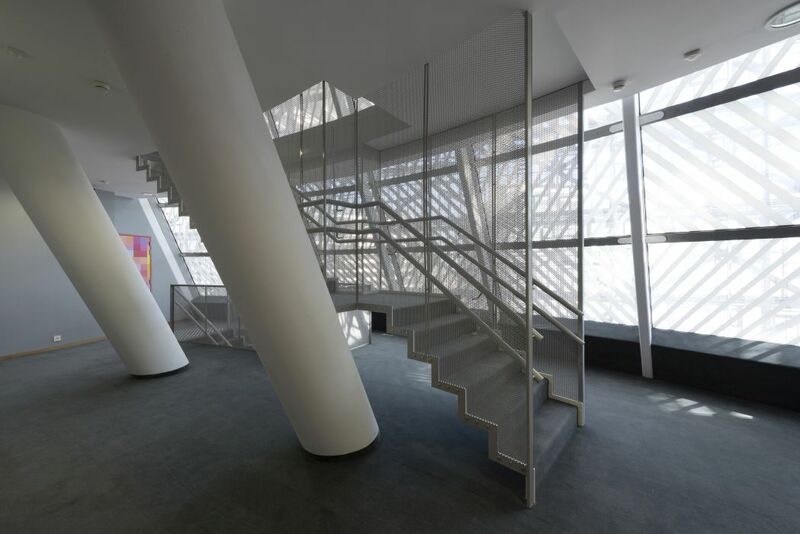 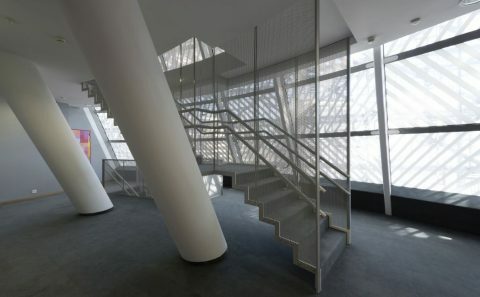 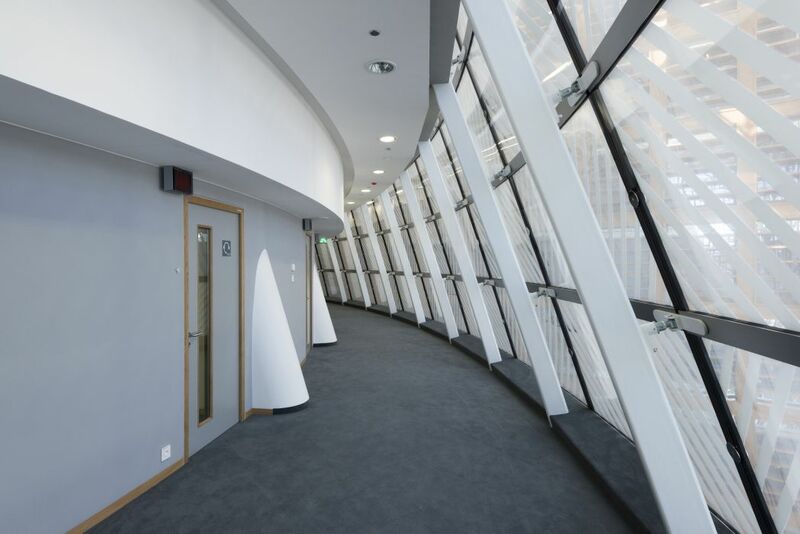 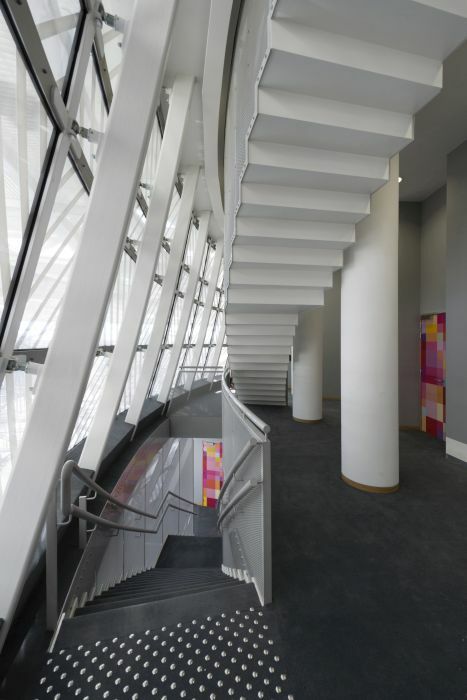 It covers the principal entrance as well as a new lantern-shaped volume incorporating the conference rooms. 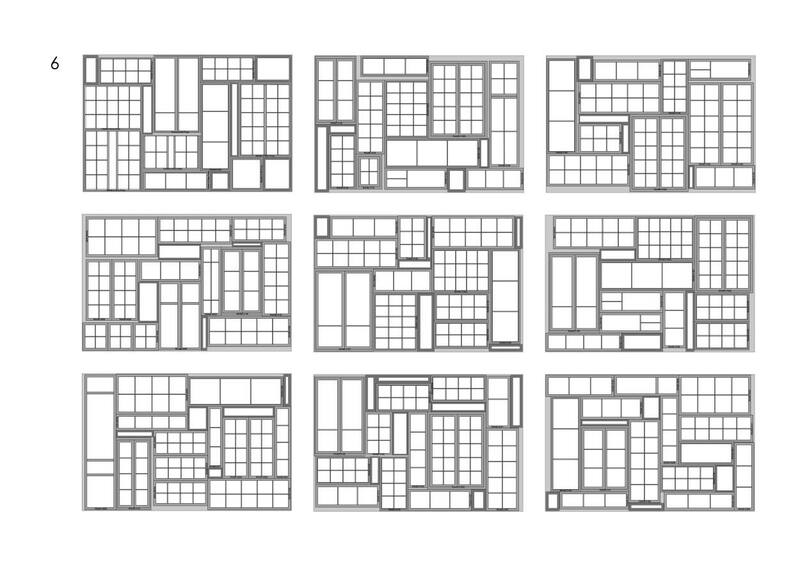 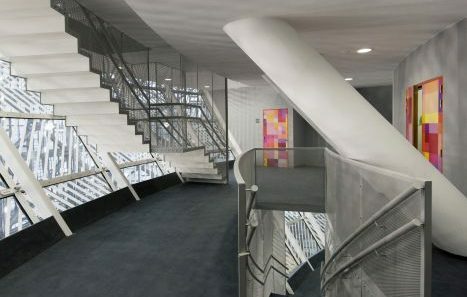 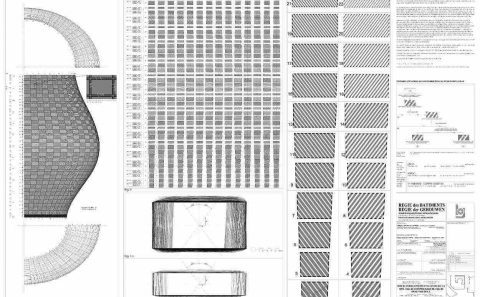 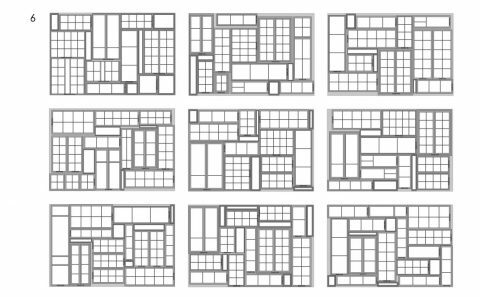 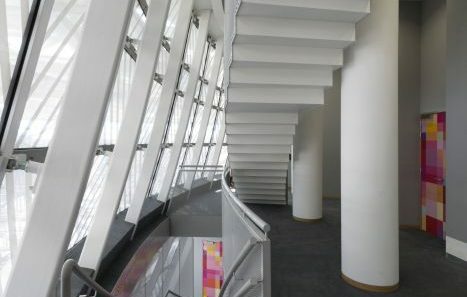 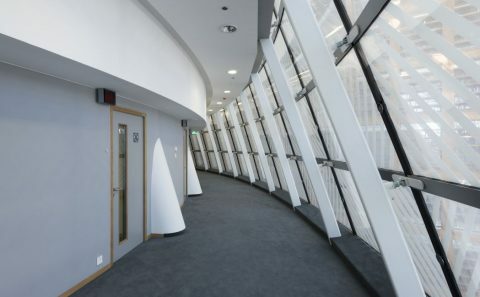 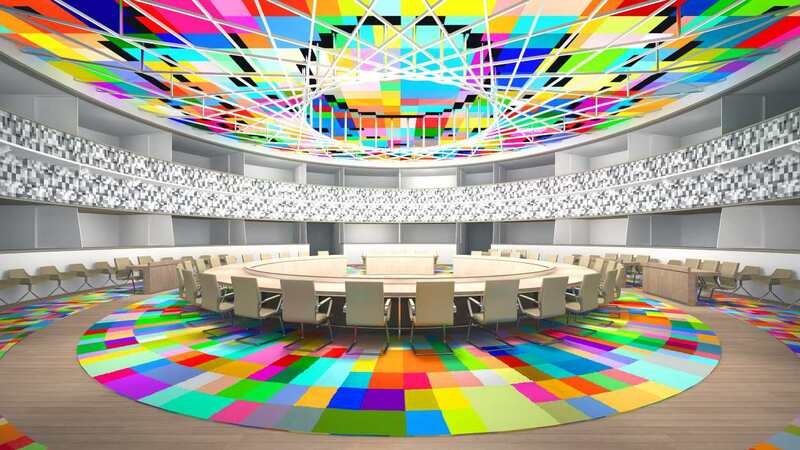 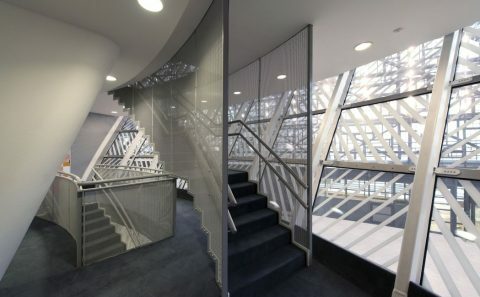 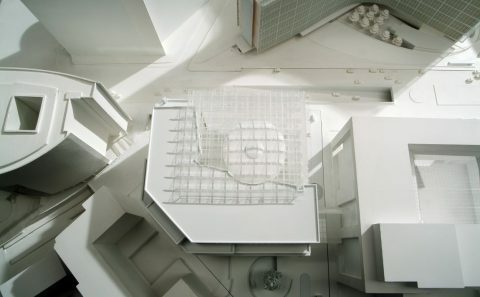 The shape of this volume follows the minimal required surface for each type of room, as for example the press room (level +1), the smallest 50-persons dining room (level +11), the largest meeting room enabling 250 persons meetings (level +5), other meeting rooms (level +3, +7) and finally the largest dining room for official diners (level +9). 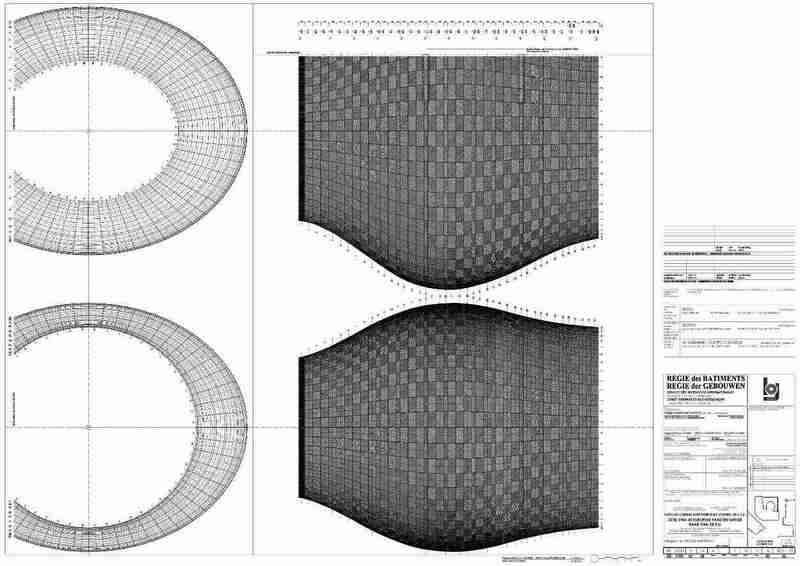 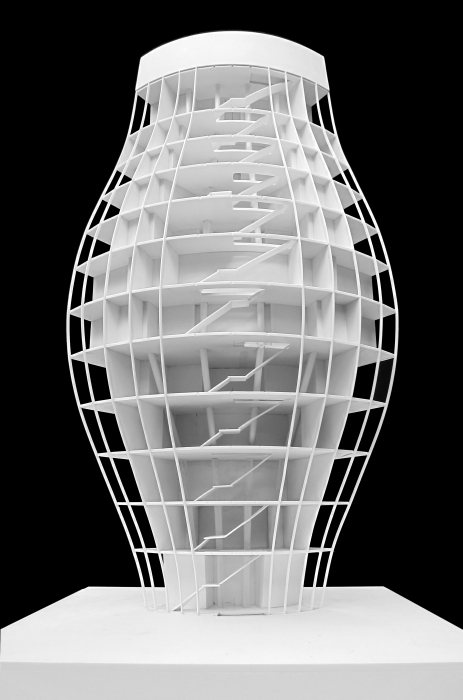 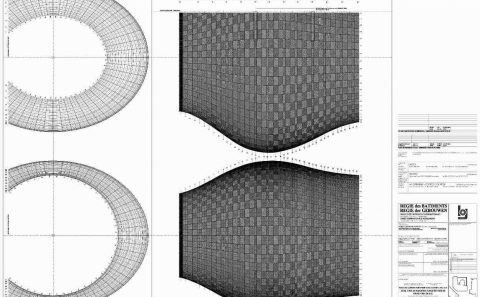 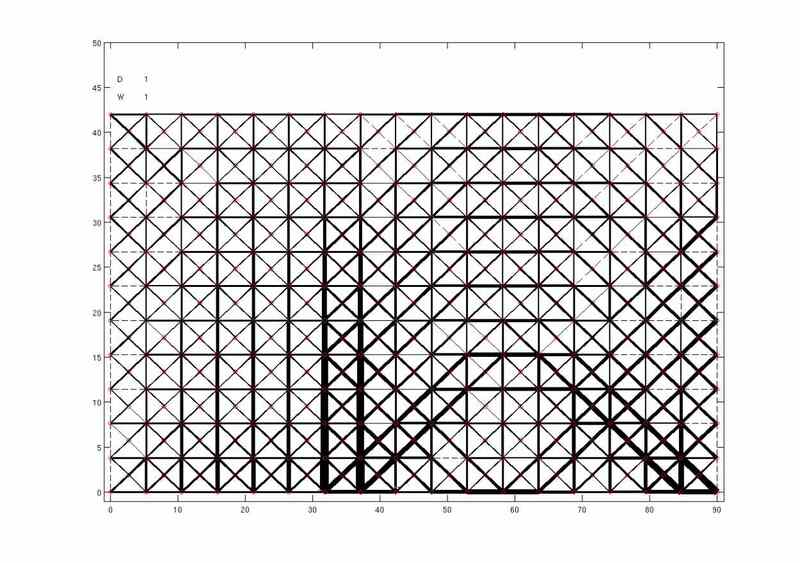 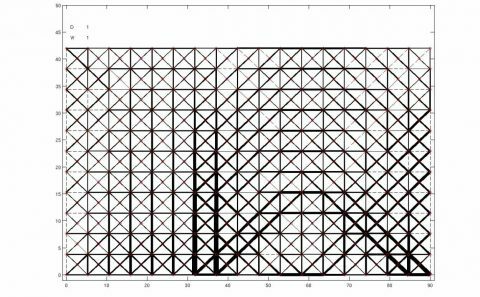 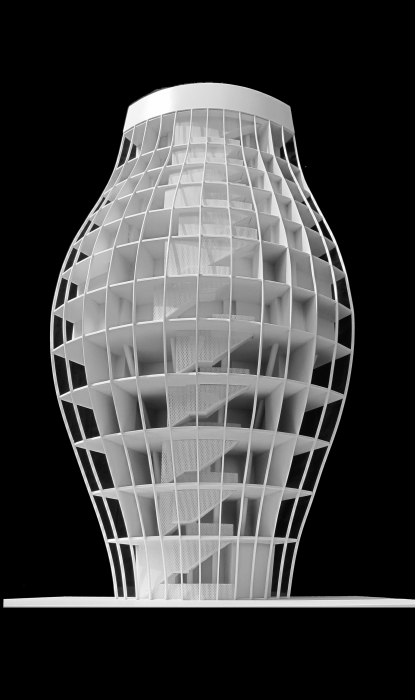 Each level of this volume has an elliptic plan with different dimensions but the same centre and the same principal axis. 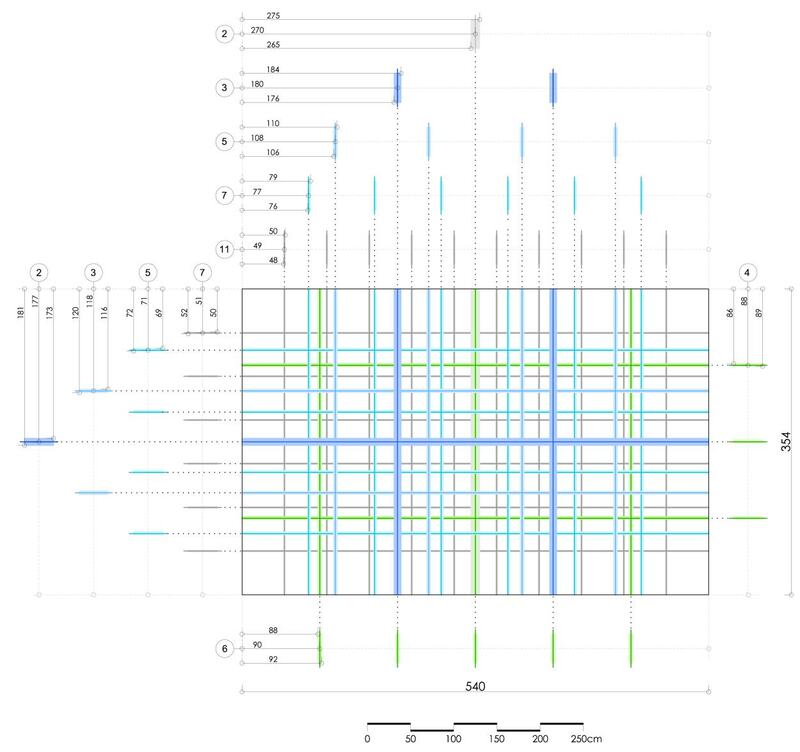 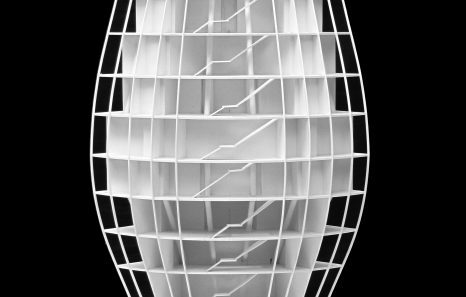 The structure of this object is rigorously symmetrical although it does not appear so. 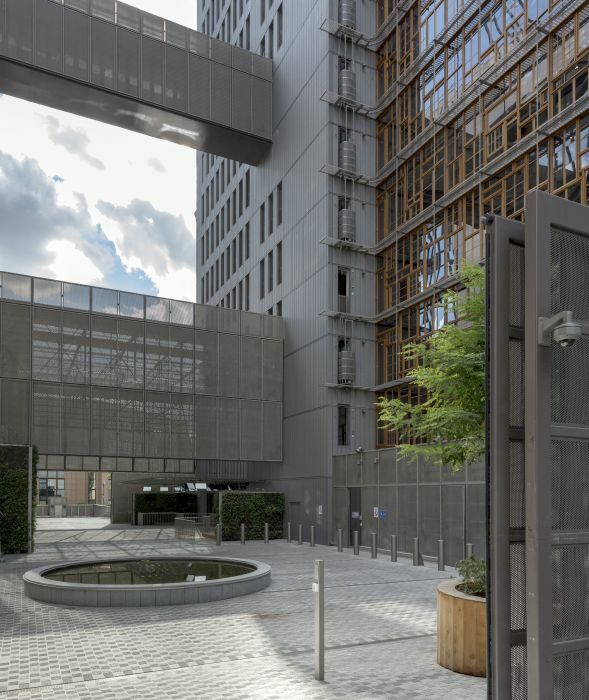 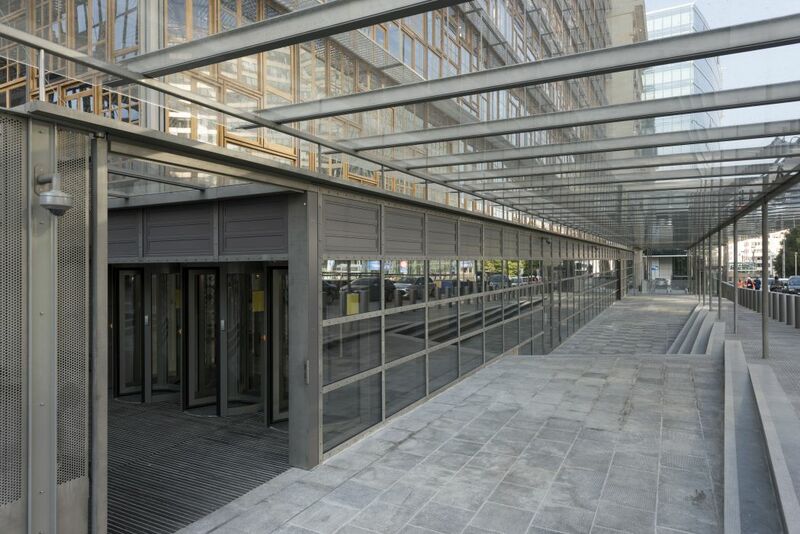 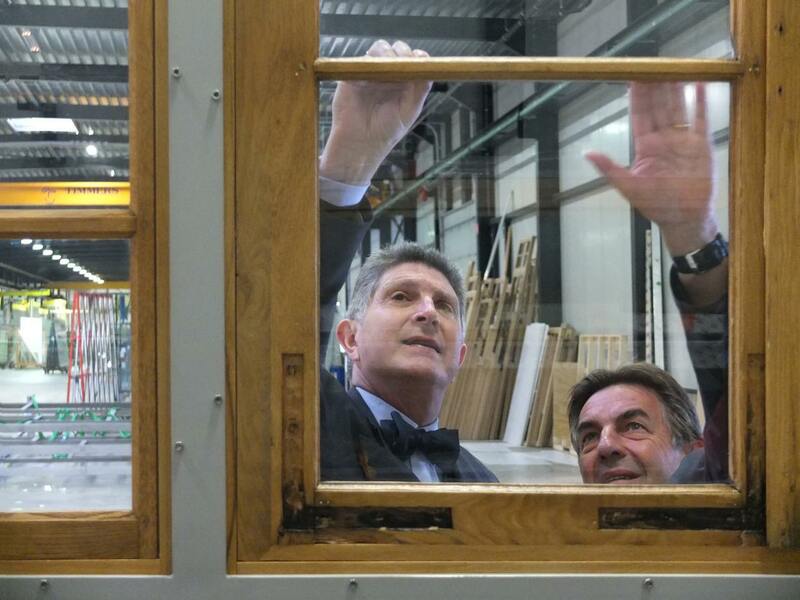 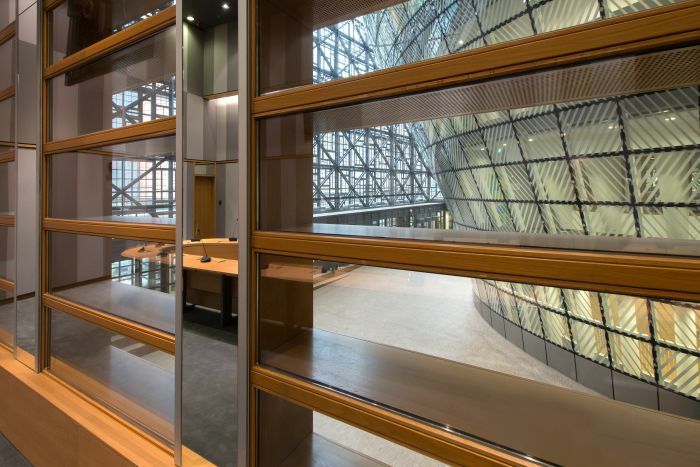 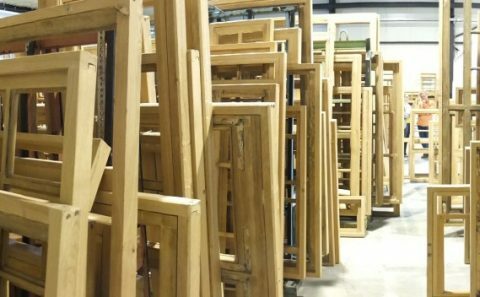 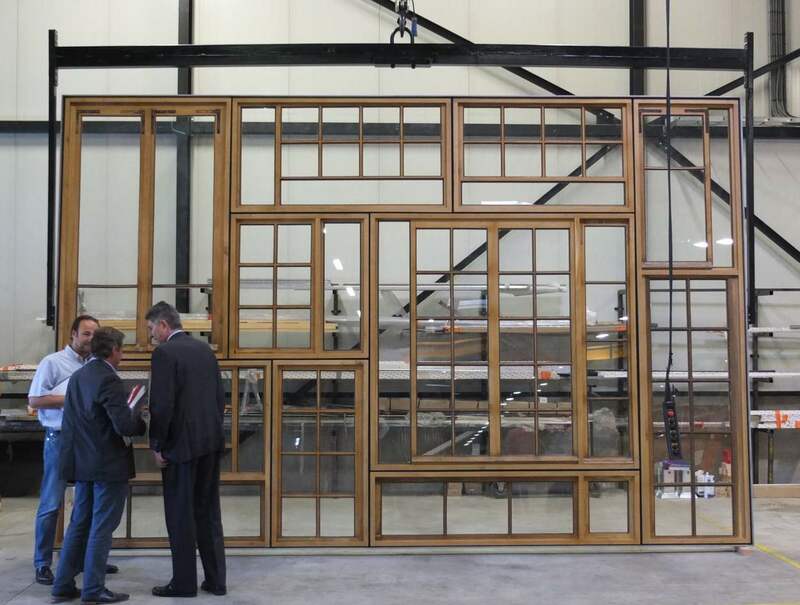 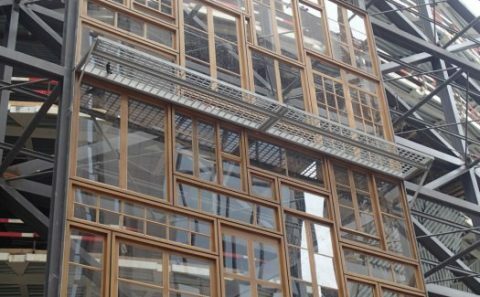 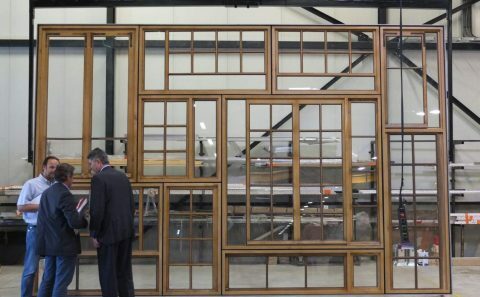 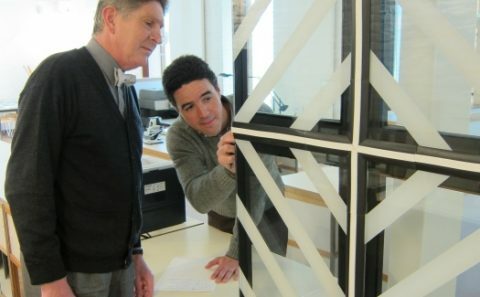 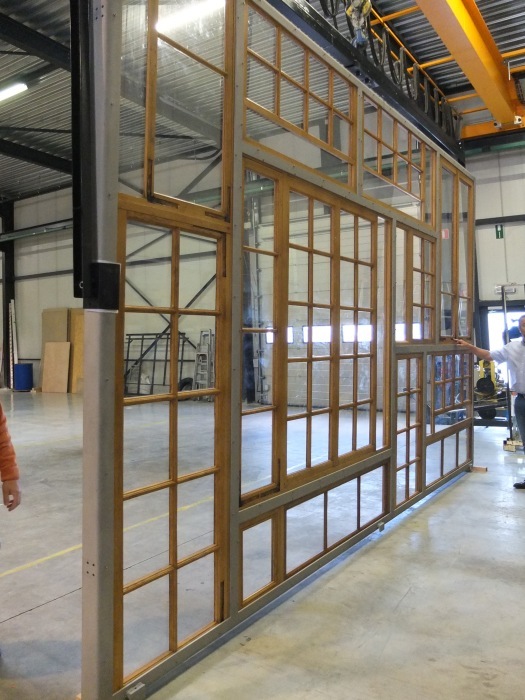 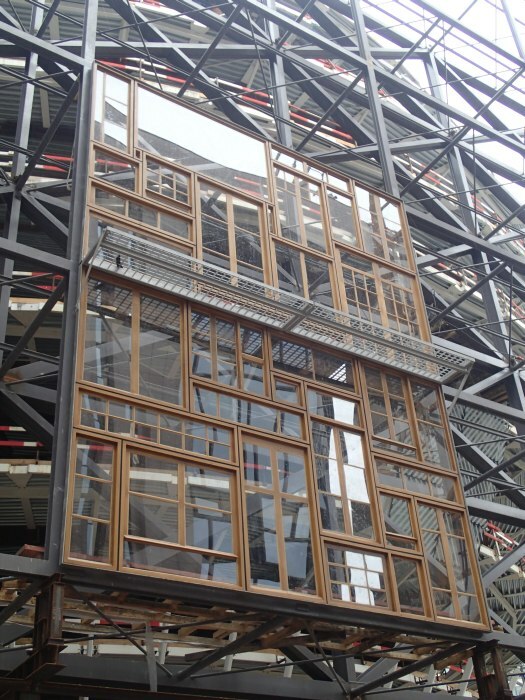 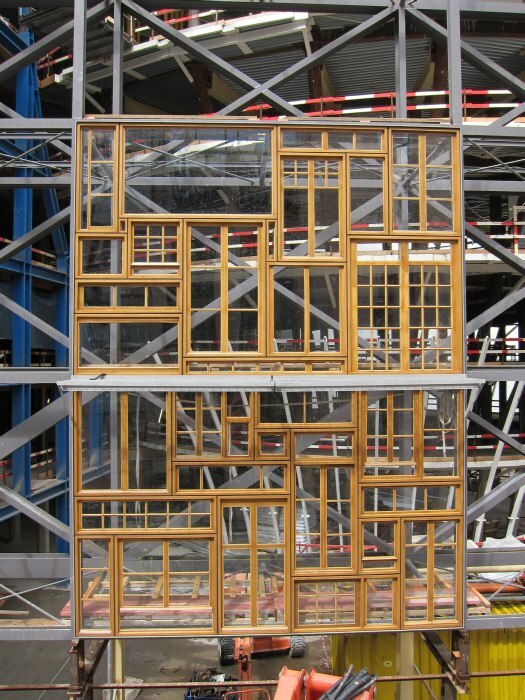 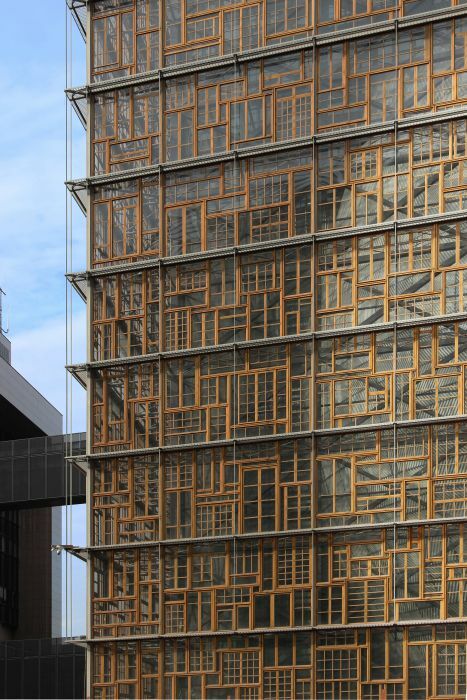 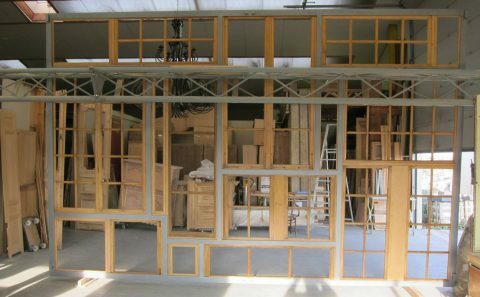 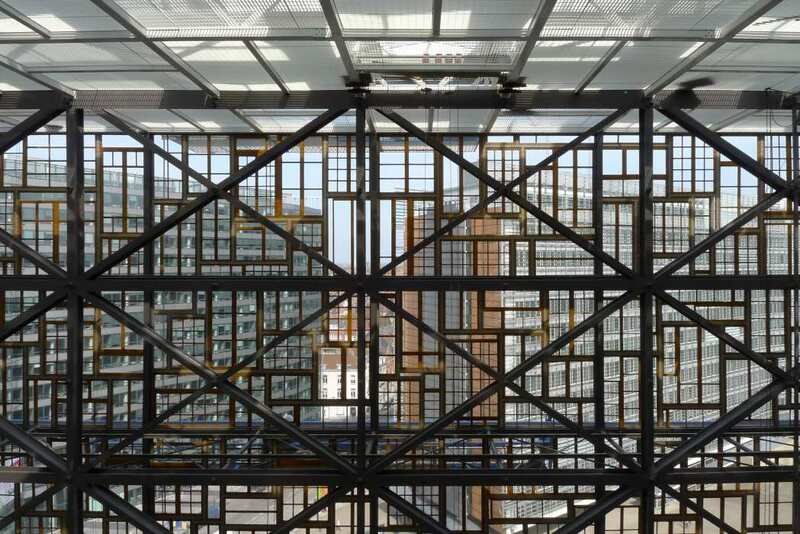 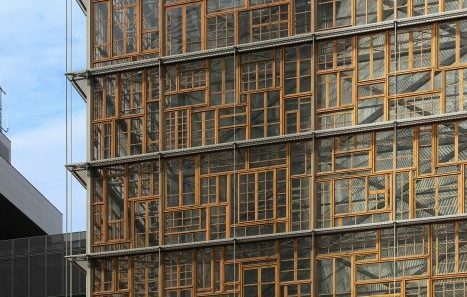 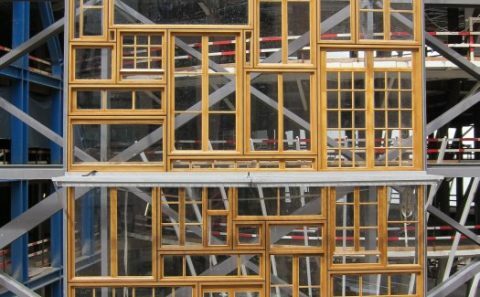 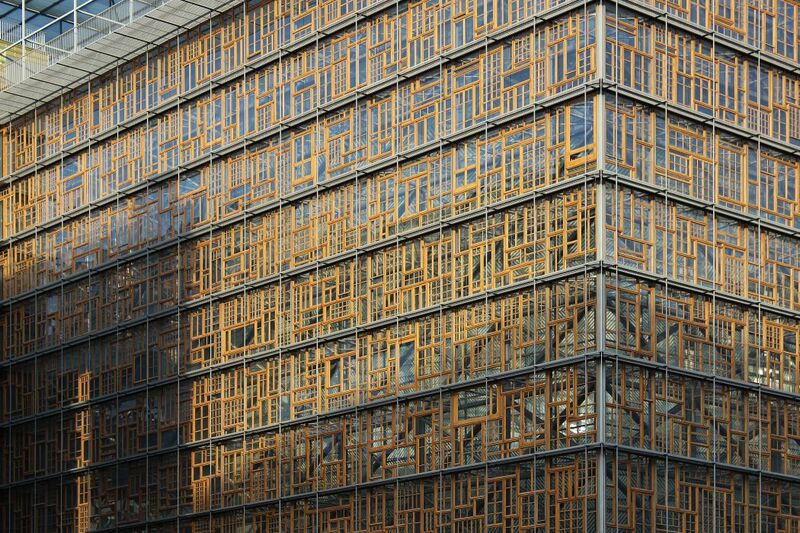 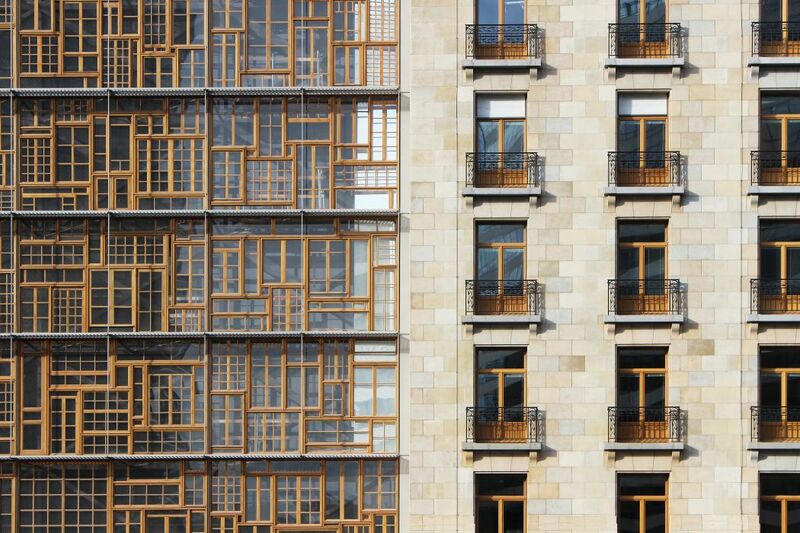 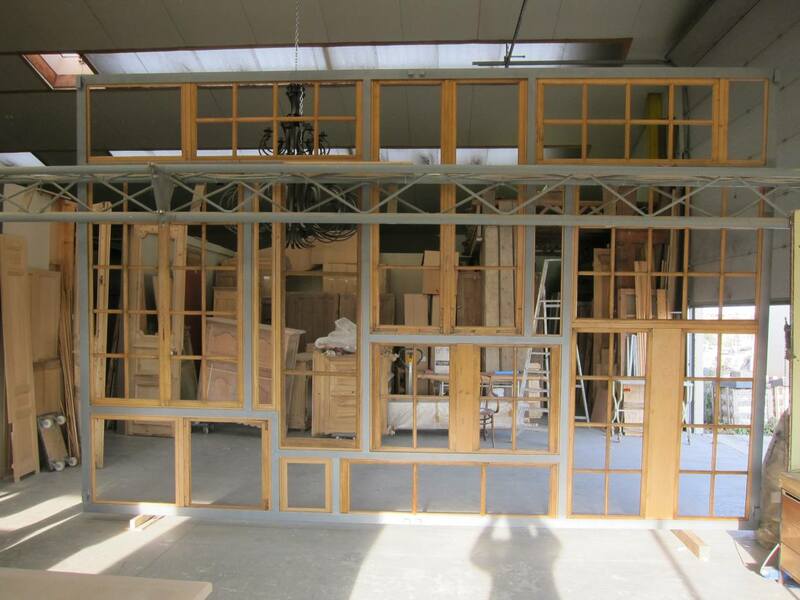 The new double facade, made of a harmonised patchwork of re used oak windows with simple crystal like single glazing (from the different European countries) provides the necessary acoustic barrier from the traffic noise of the Rue de la Loi – Wetstraat and it also offers a first thermal insulation for the inner space. 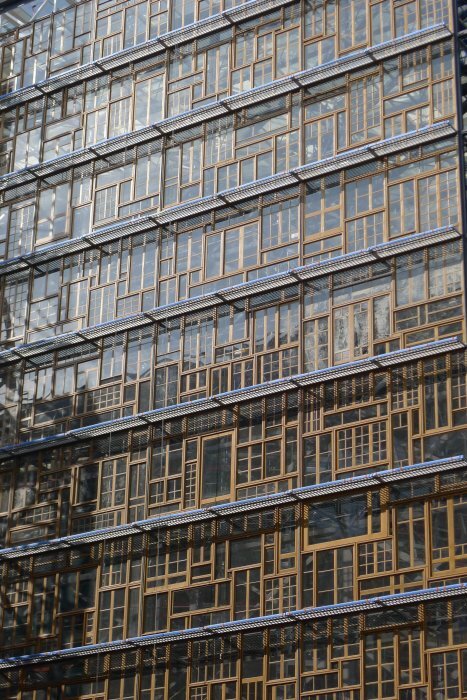 Moreover, the council wishes this building to be from all points of view an example as far as sustainable development is concerned. 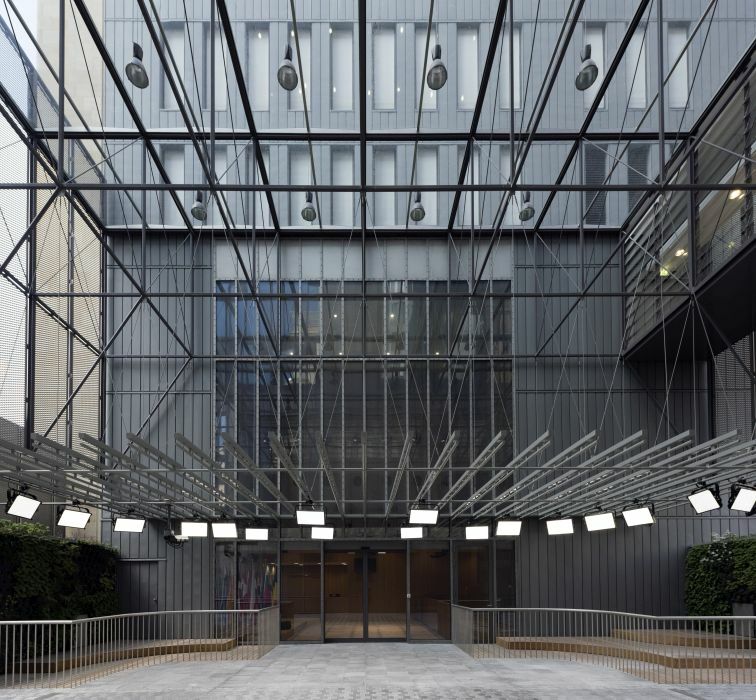 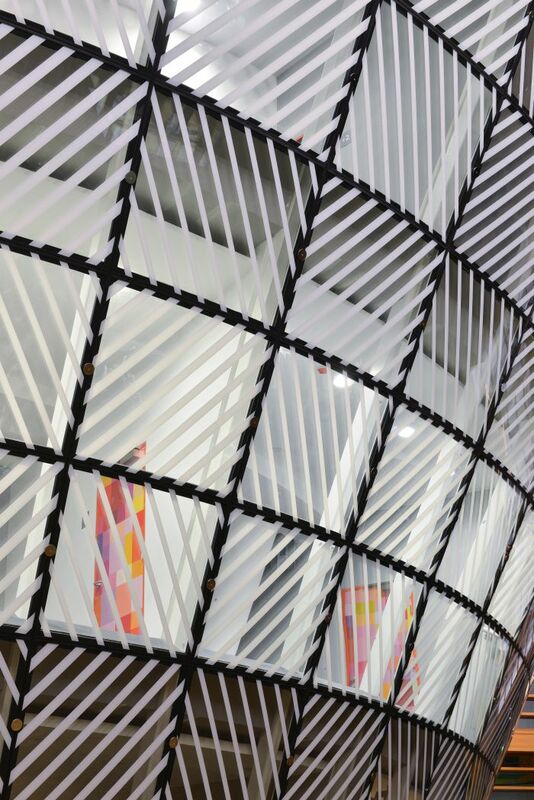 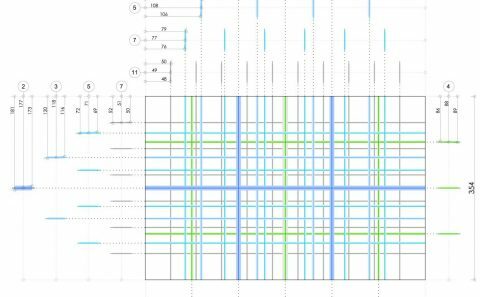 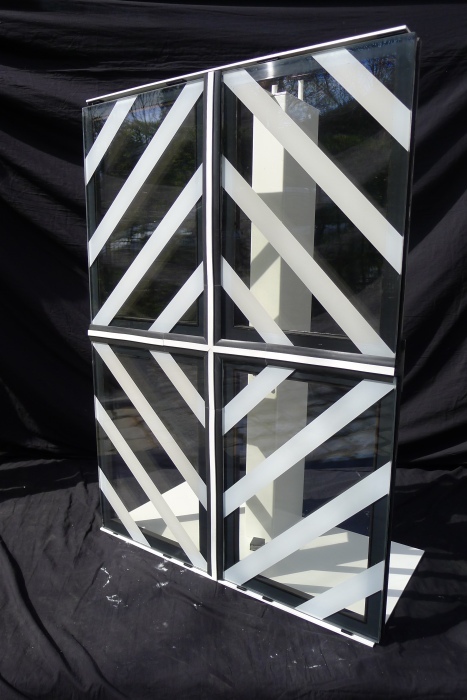 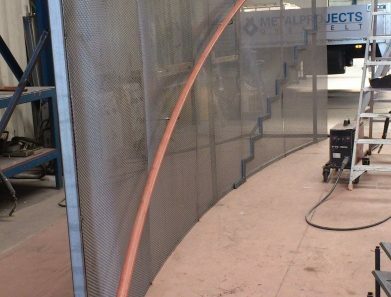 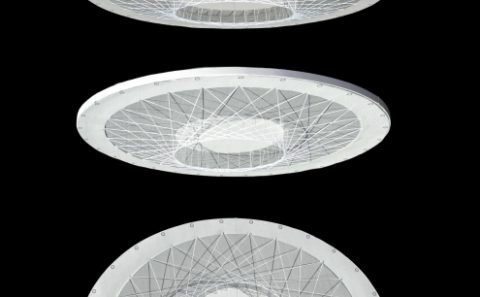 This wish is displayed in many aspects of the architectural and technical design. 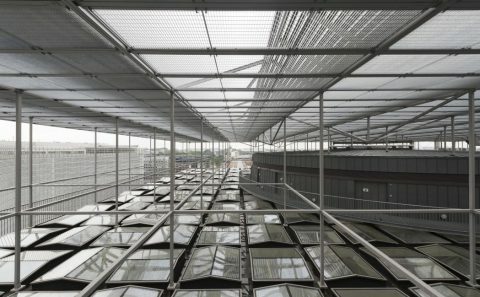 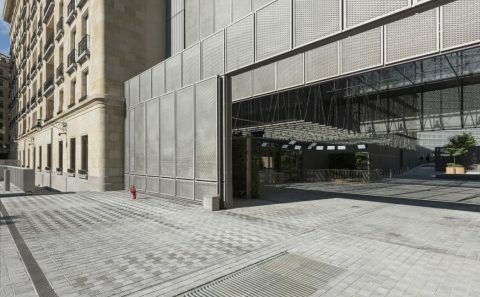 As an example, an umbrella of photovoltaic panels for the electricity production covers both the modern and the historical parts, which symbolizes also the link between the present, the past and the future. 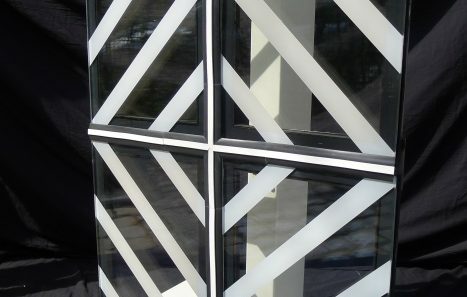 2005 – 2016 ; (01/494). 1) The Council, also called the Council of Ministers designates a meeting that gathers representatives of EU member states at the ministerial level. 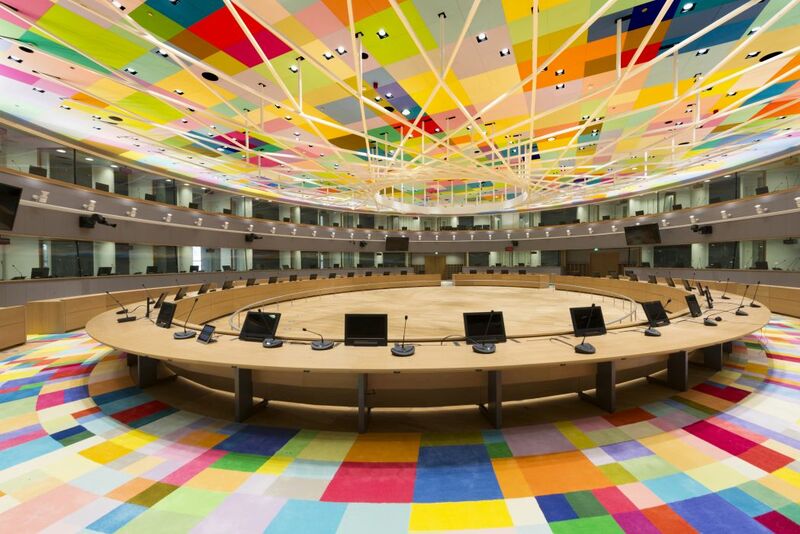 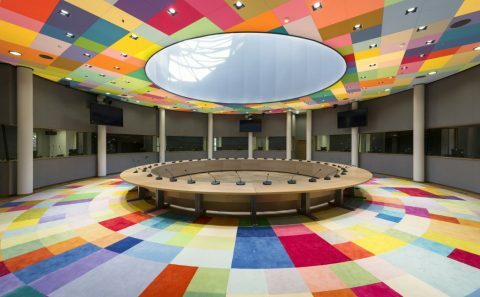 2) The European Council is a political entity that is comprised of EU heads of state and/or government. 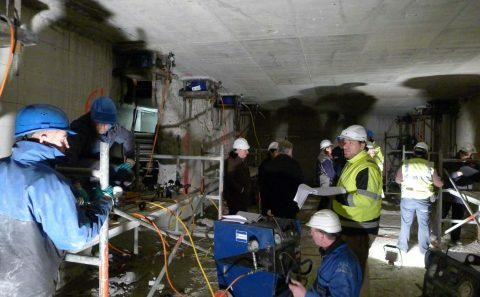 Asbestos removal started in January 2008. 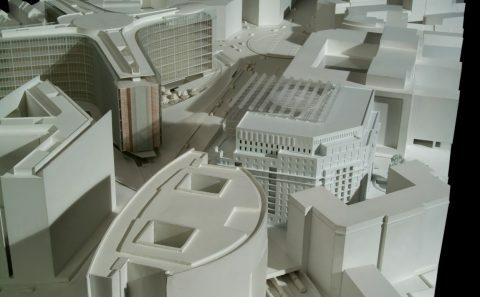 Demolition and infrastructure works started in May 2008. 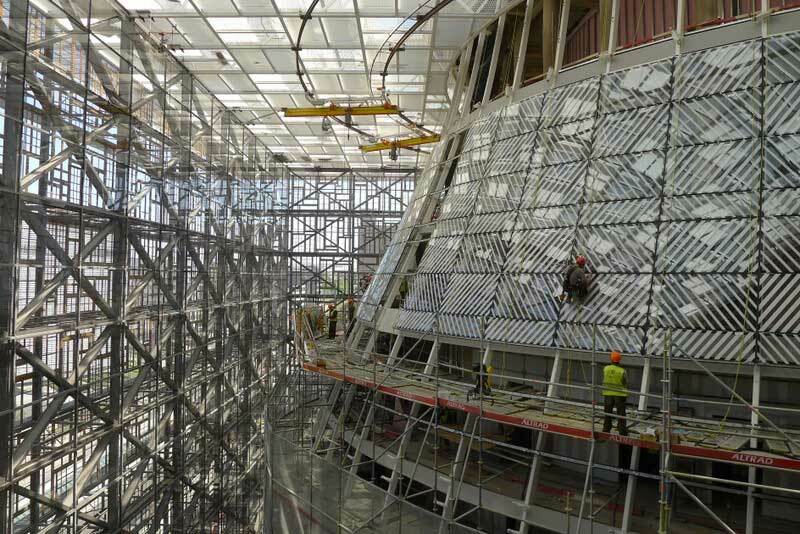 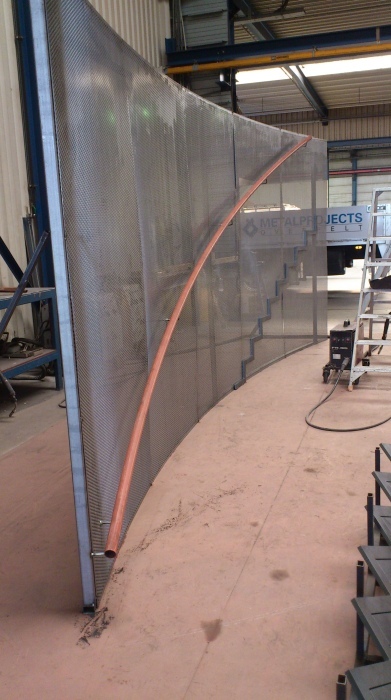 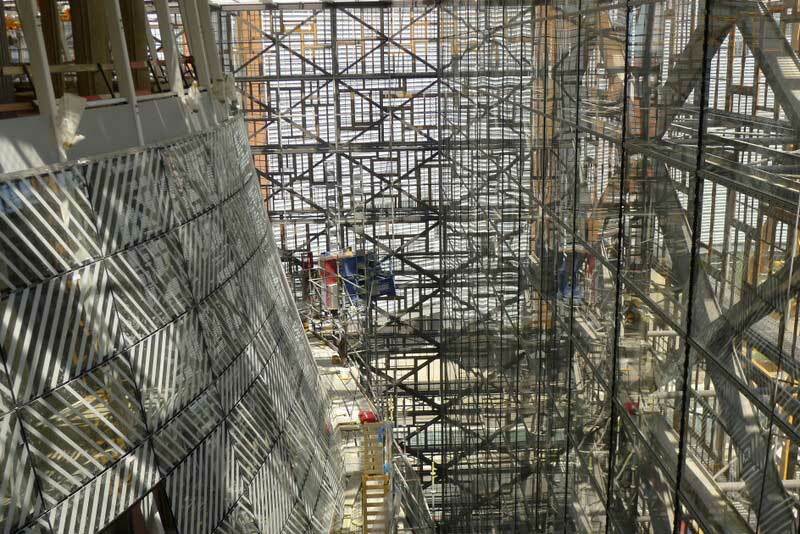 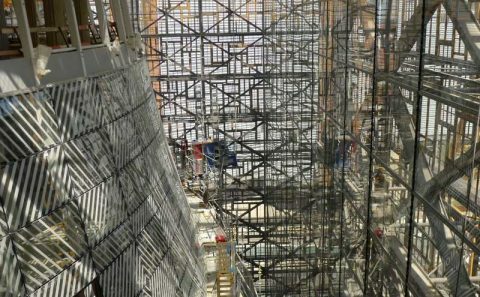 Project on schedule and at final design stade. 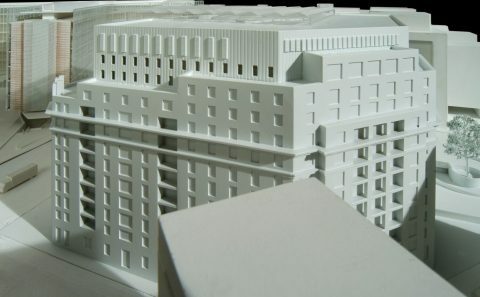 Final building permit granted in April 2008. 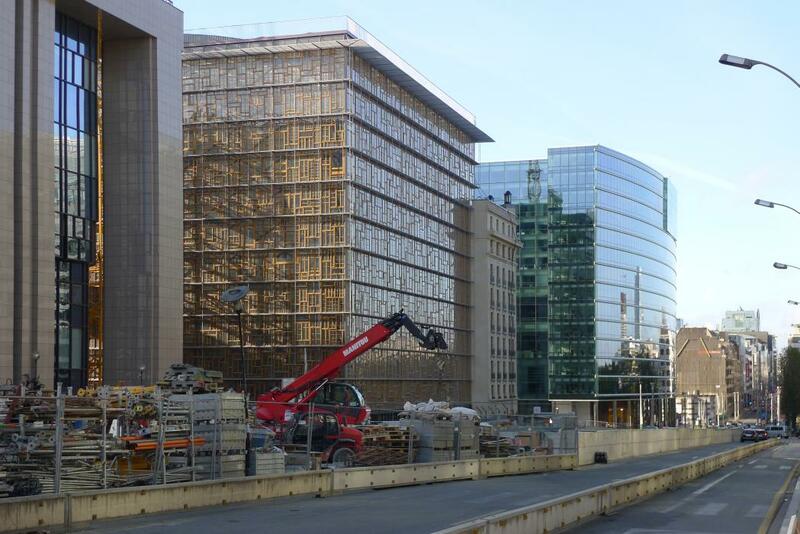 End of the works: December 2016. 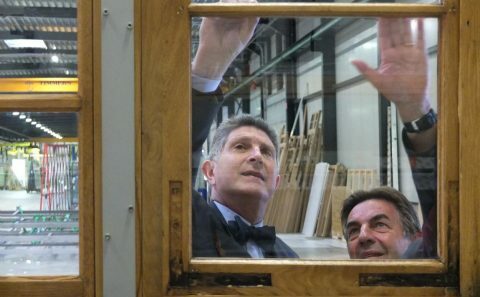 In: BULLETIN DE LA CLASSE DES BEAUX ARTS. 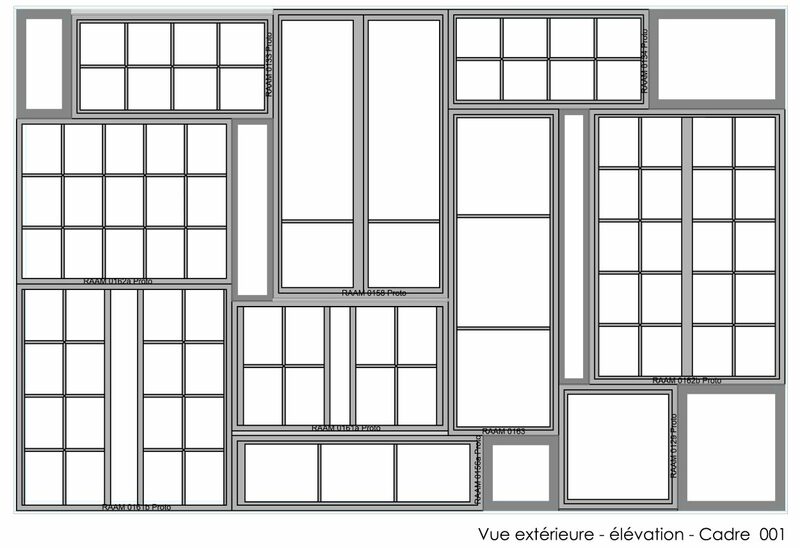 Académie Royale des Sciences, des Lettres et des Arts de Belgique – 6ème serie, tome XVII 2006, 7/12, pp 323-353; Ph. 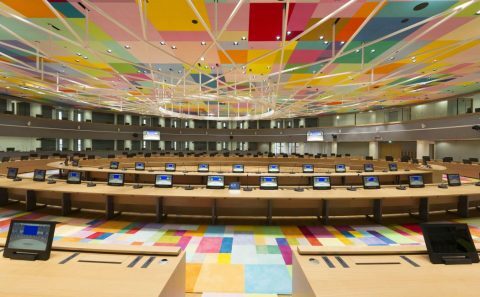 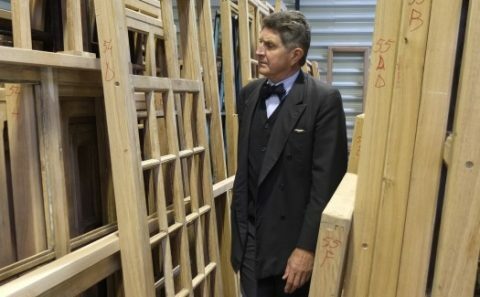 Samyn : “Les vertus du patchwork et la façade du conseil de l’Union Européenne”; (BE),(862). 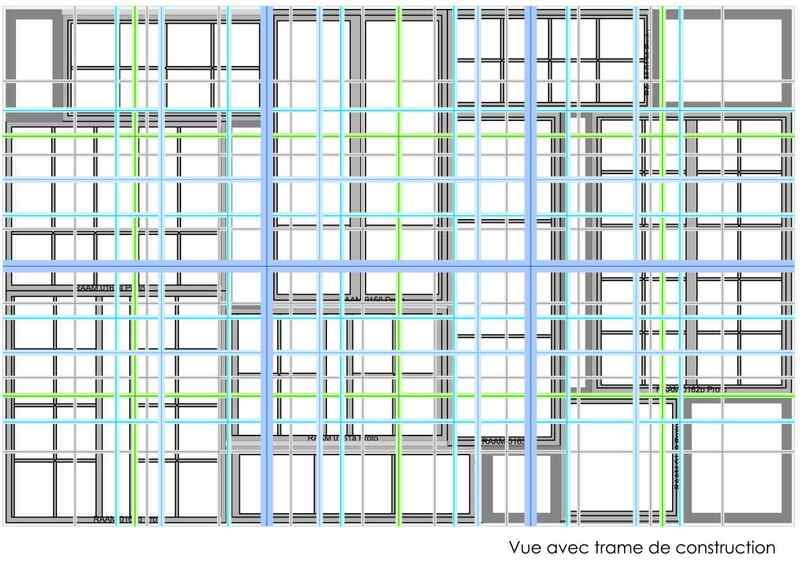 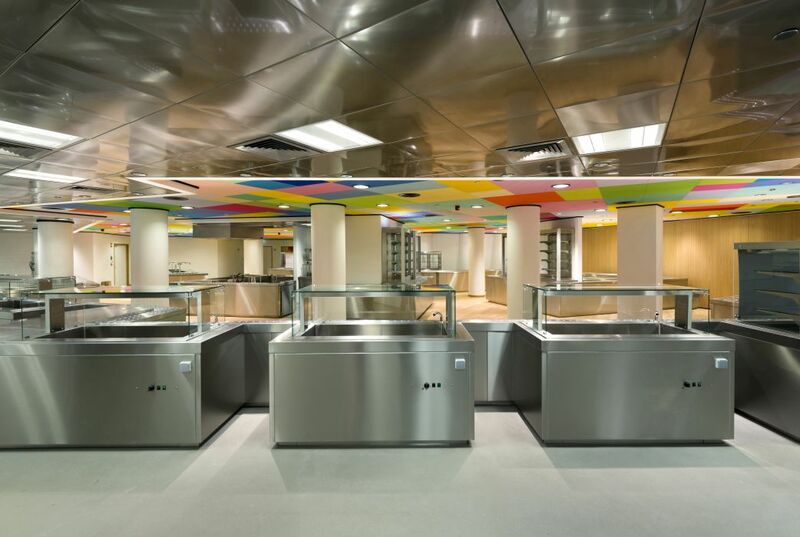 All © : Philippe SAMYN and PARTNERS architects & engineers, LEAD and DESIGN PARTNER. Philippe Samyn and Partners architects & engineers, Studio Valle Progettazioni architects, Buro Happold Limited engineers.